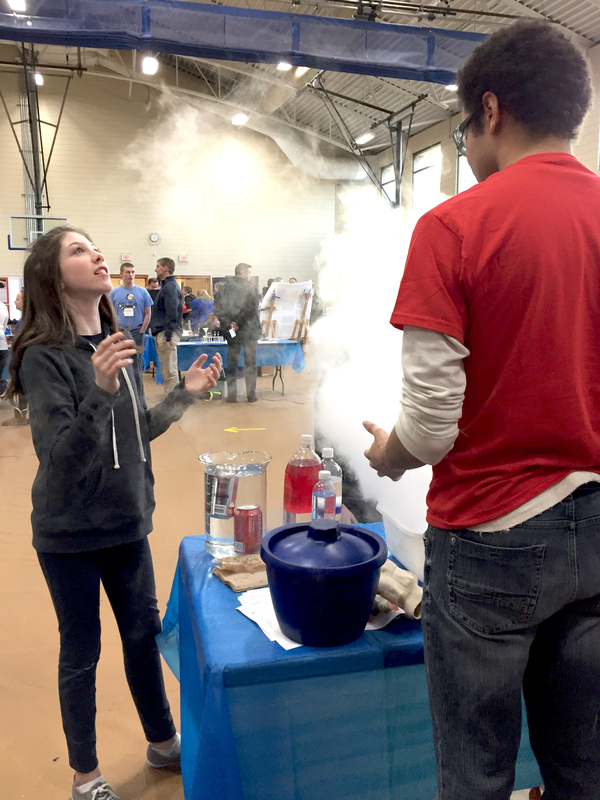 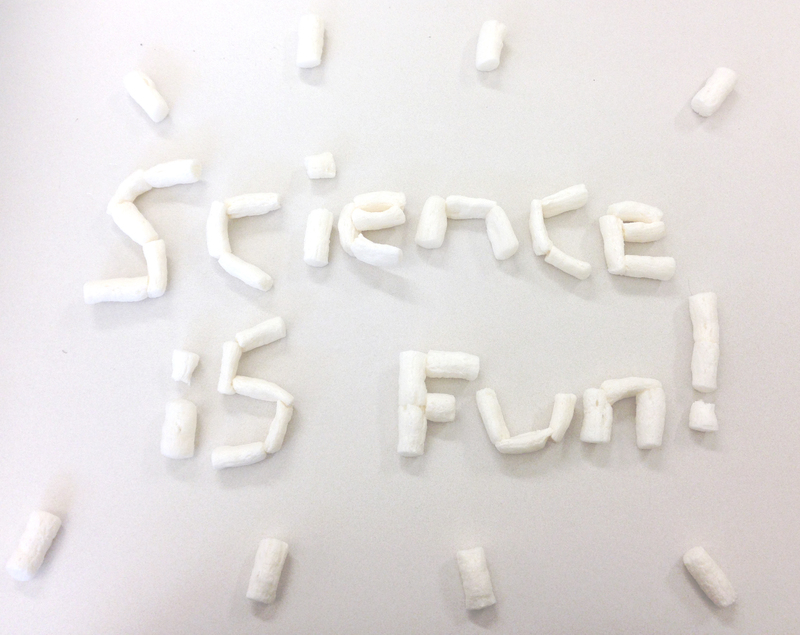 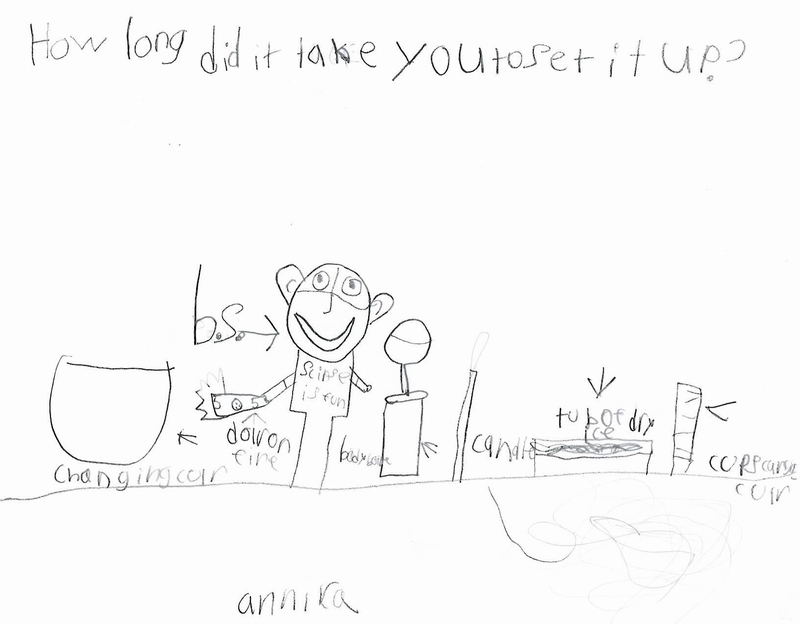 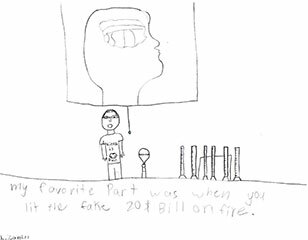 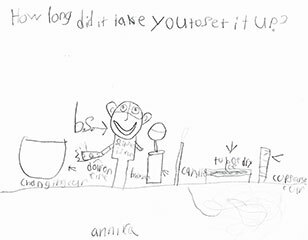 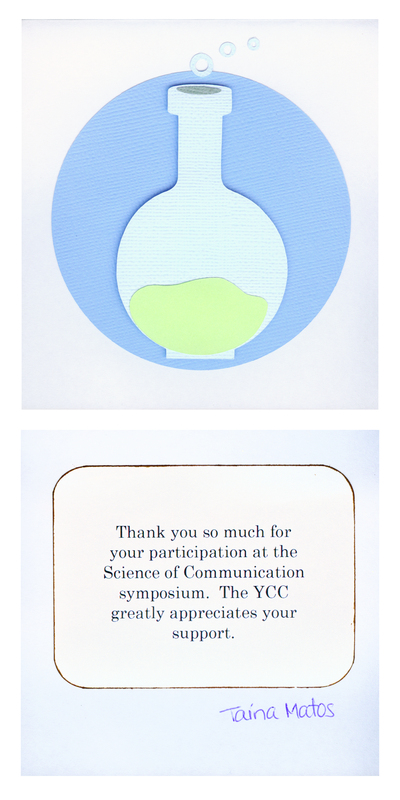 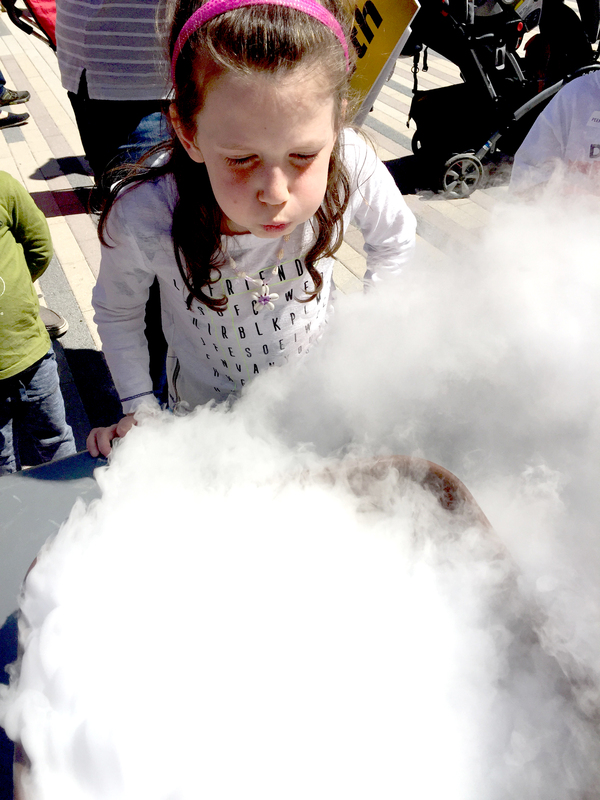 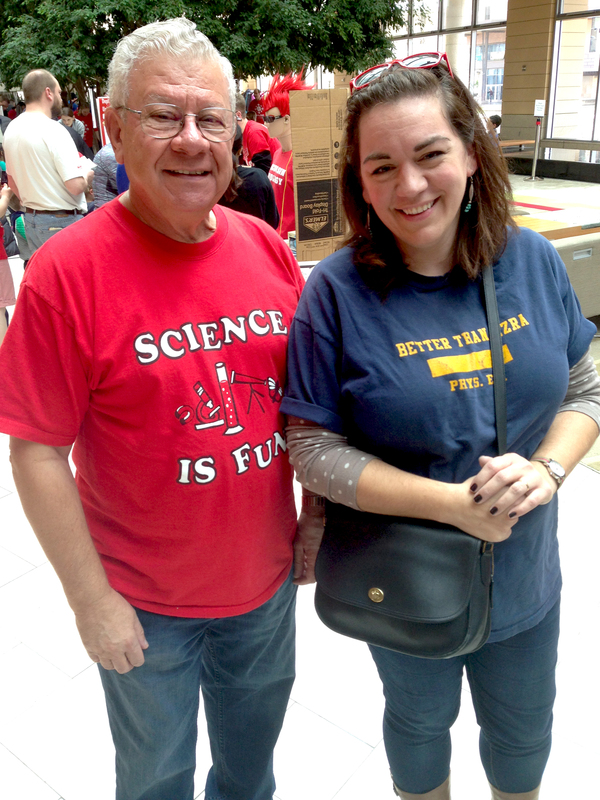 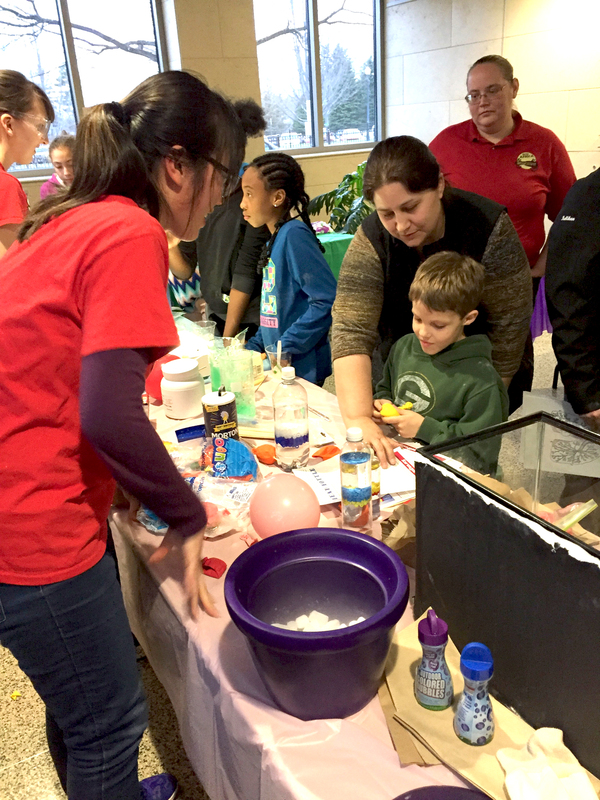 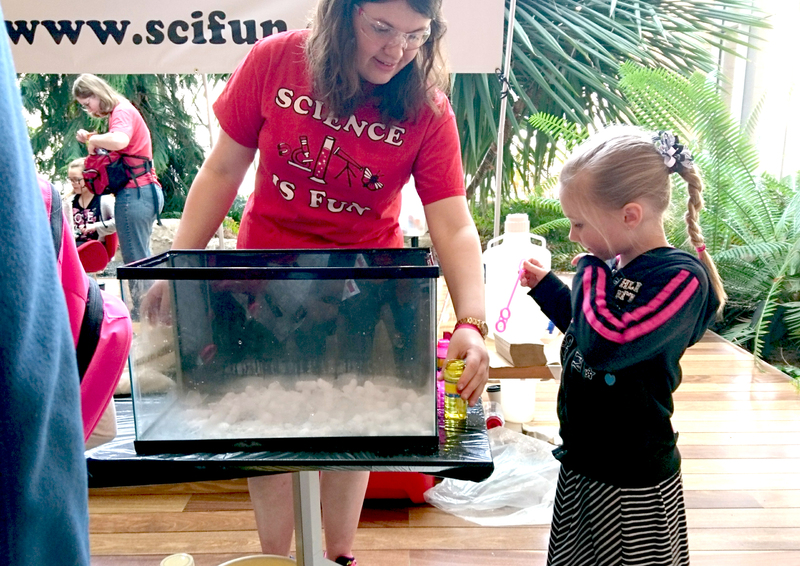 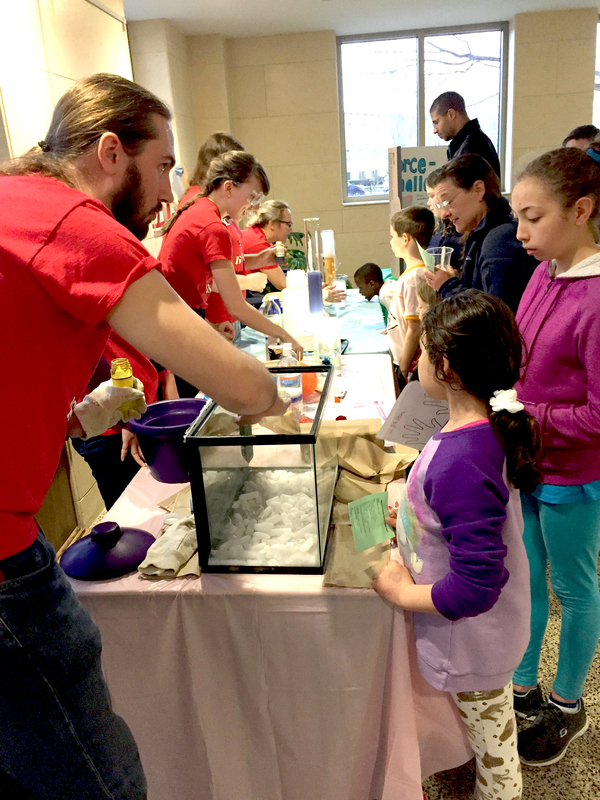 Sophia's mother says: "You have inspired her to want to learn even more about Science. 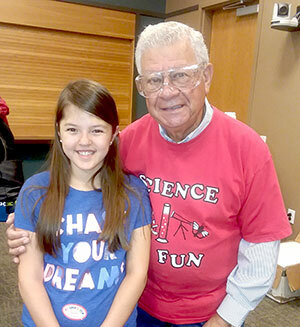 Thank you so much for coming to the library and making a difference in her life." 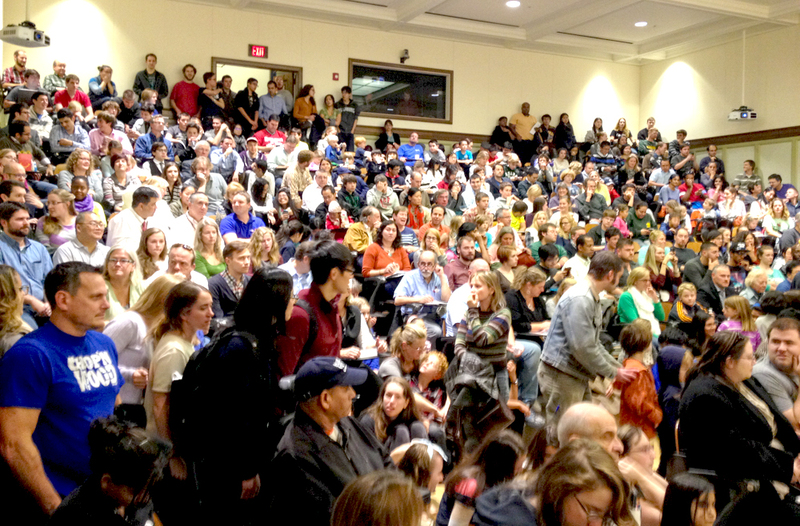 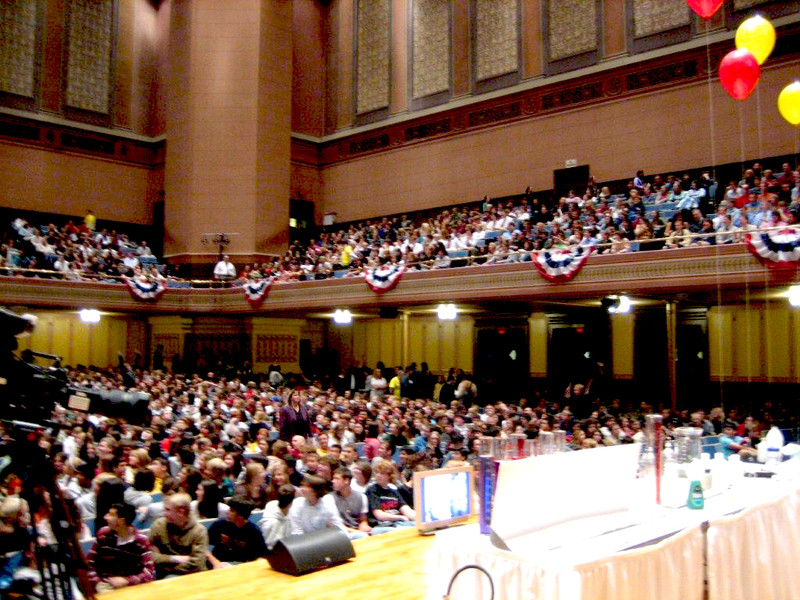 Panel Discussion: Advancing the Natural Science of Behavior: What can we learn from the March for Science? 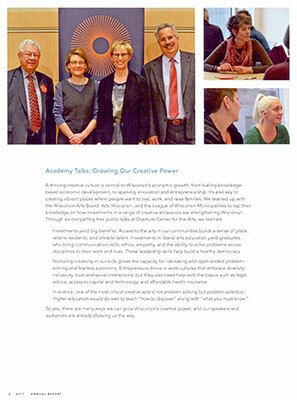 From the Wisconsin Academy's annual report. 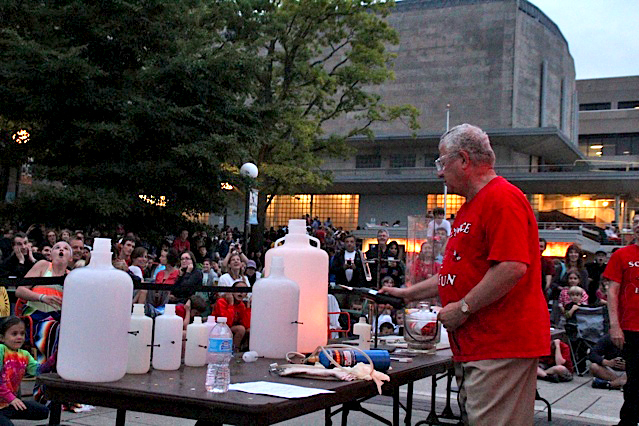 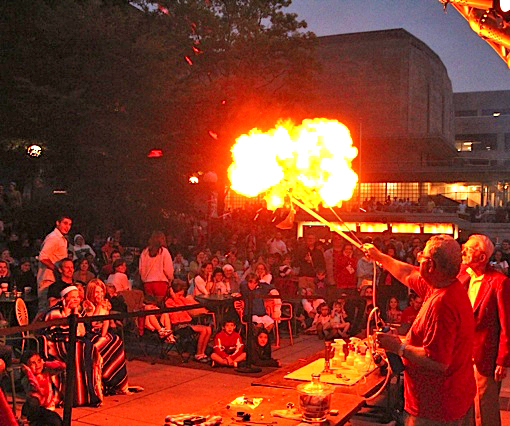 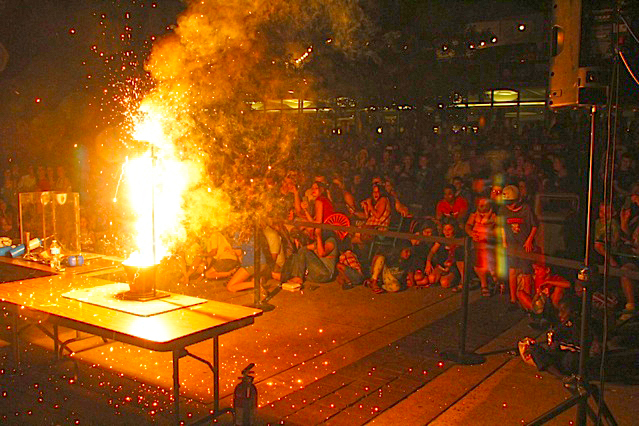 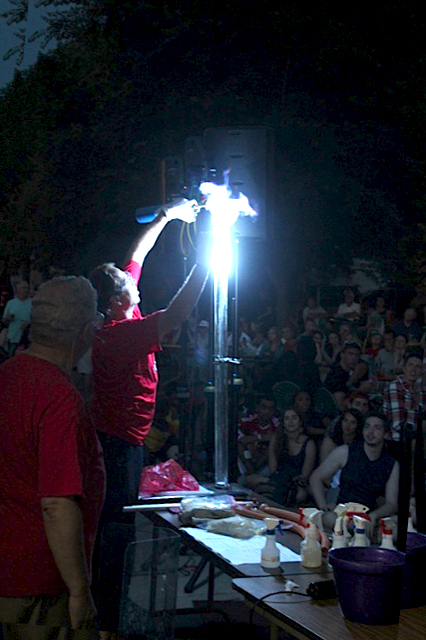 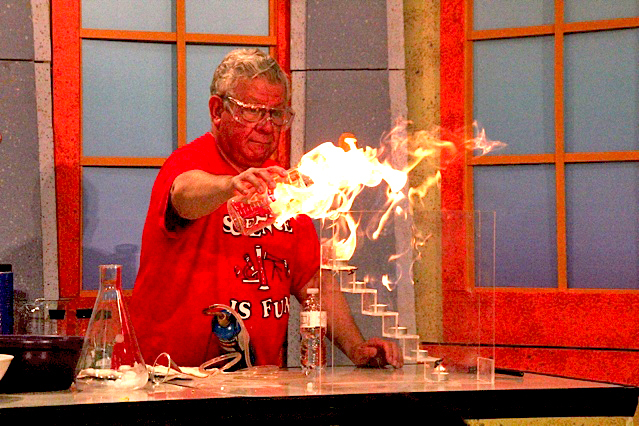 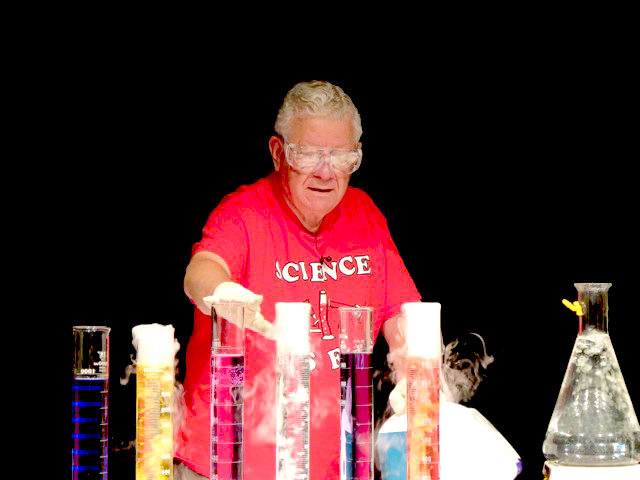 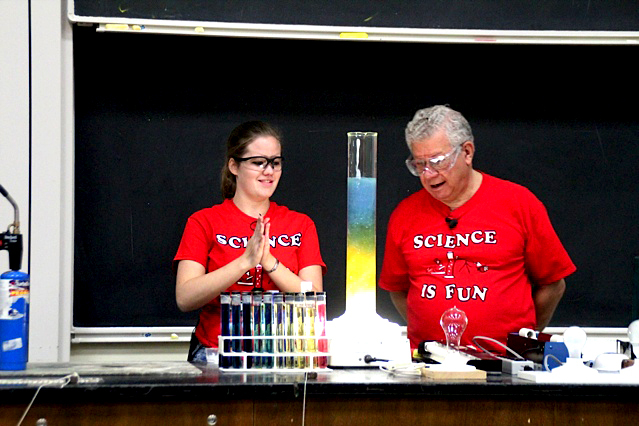 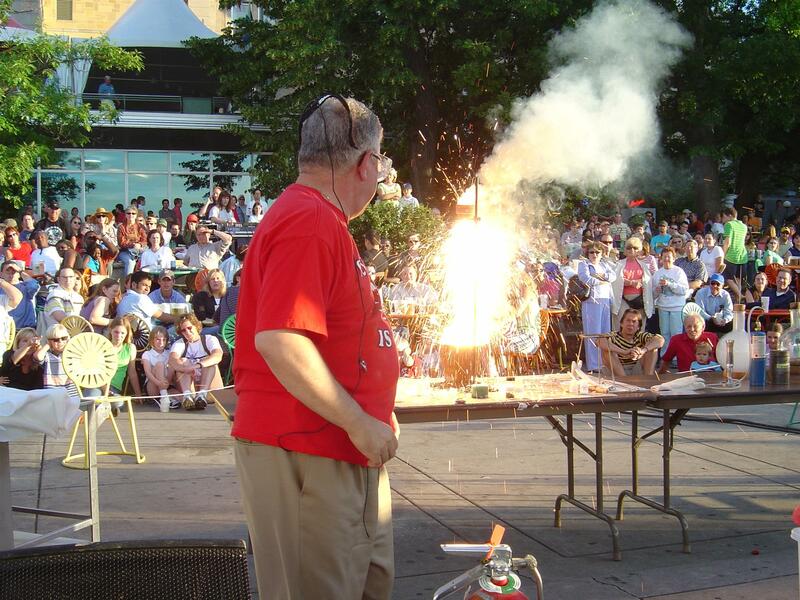 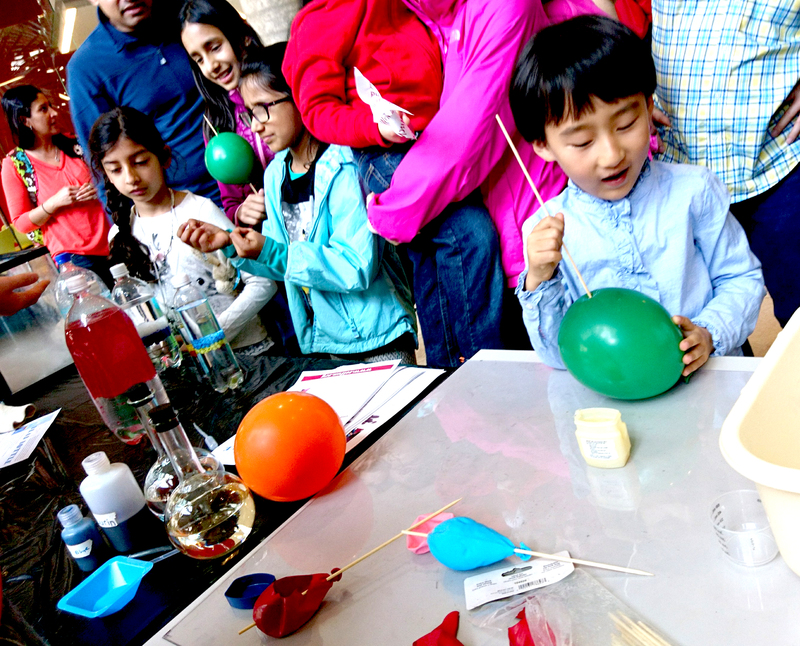 "Science is Fun and the Joy of Chemistry"
Interactive: Build your own fireworks display! 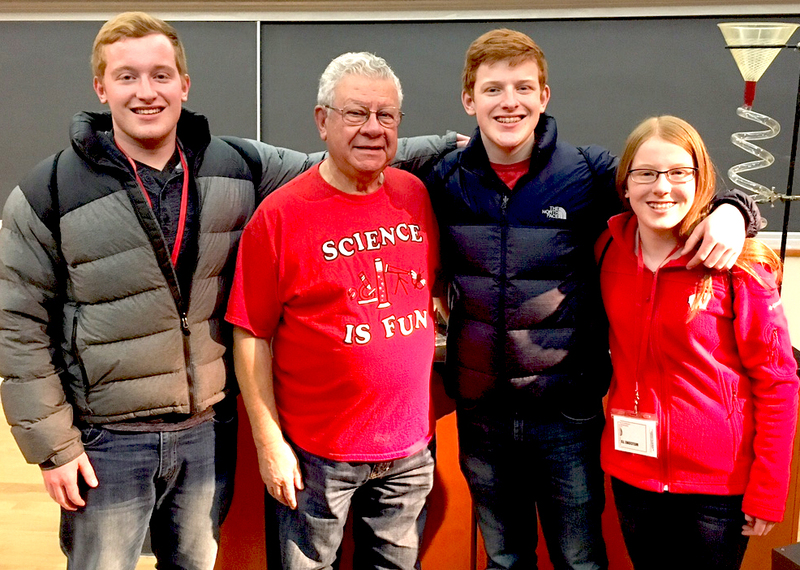 Siblings Joseph, Matthew and Rachel pose with Prof. Shakhashiri. 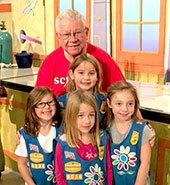 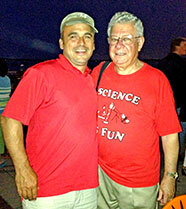 Their father Scott was a student in Bassam's class in 1982. 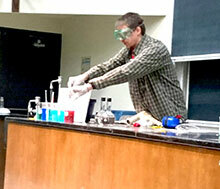 Joseph and Matthew are currently students at UW. 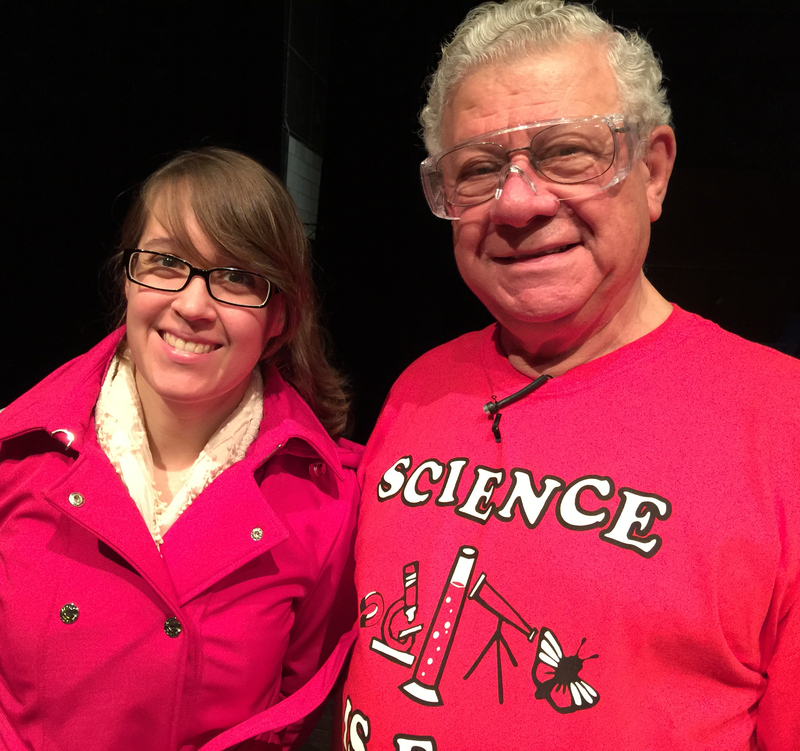 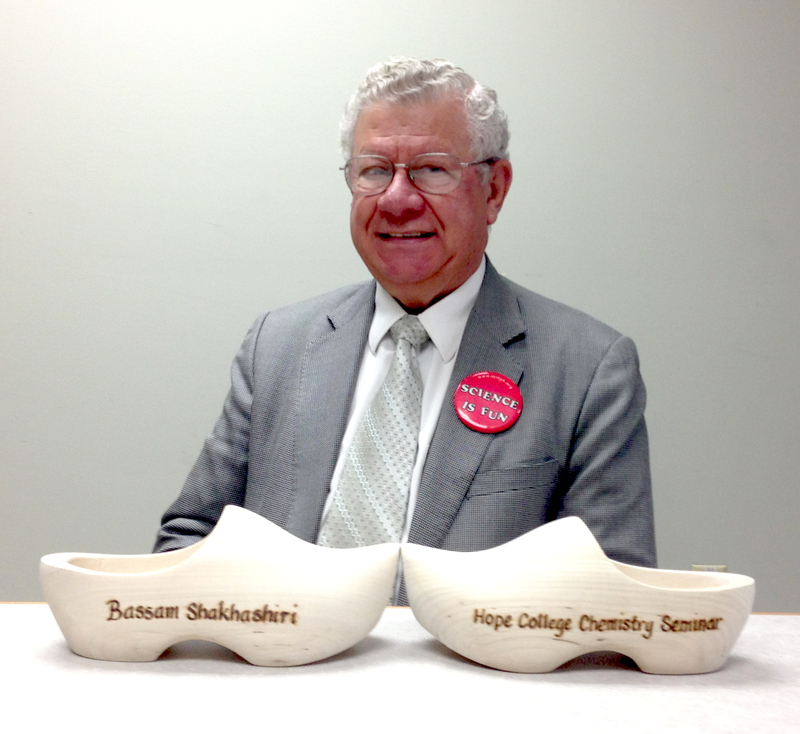 Bassam with Sara (Nowicki) Rodrigues of Sun Prairie, WI. 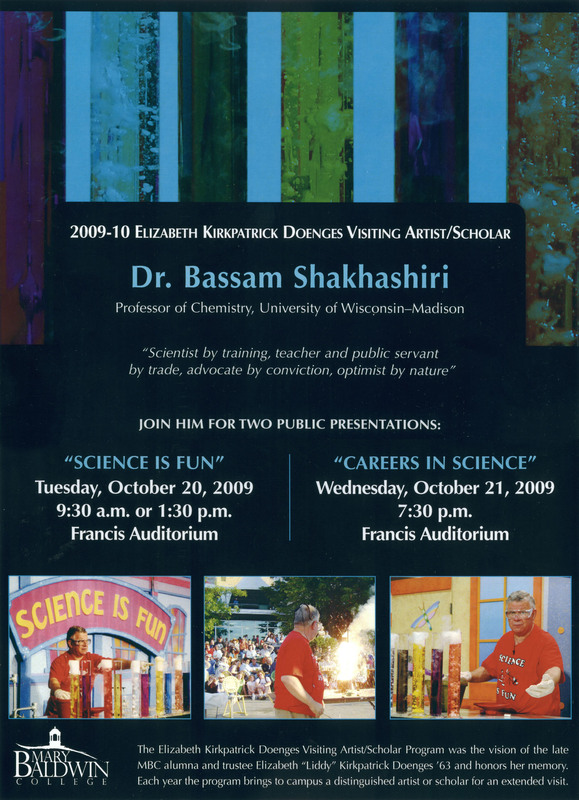 She is a 2001 graduate of UW-Madison who was a student in Bassam's class. 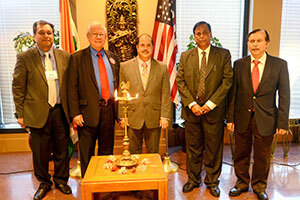 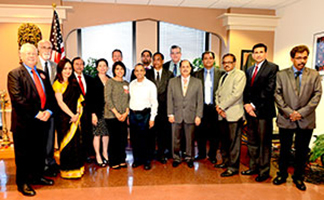 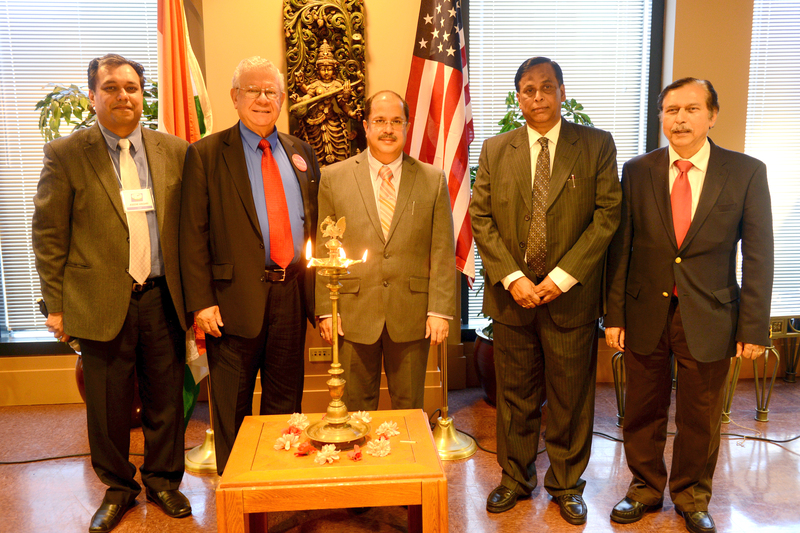 India's Future Scientists Undergo Orientation Upon Arrival in U.S.
teacher at Niles West High School in Skokie, IL. 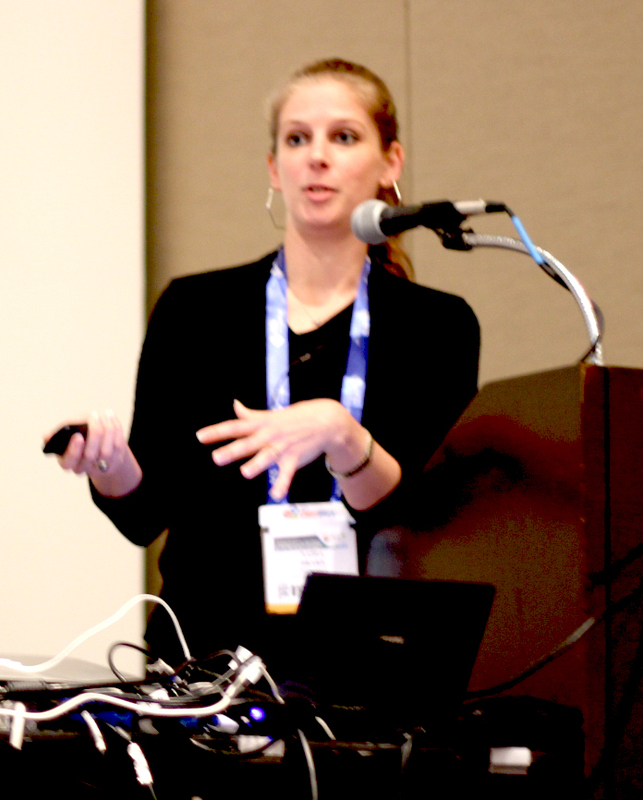 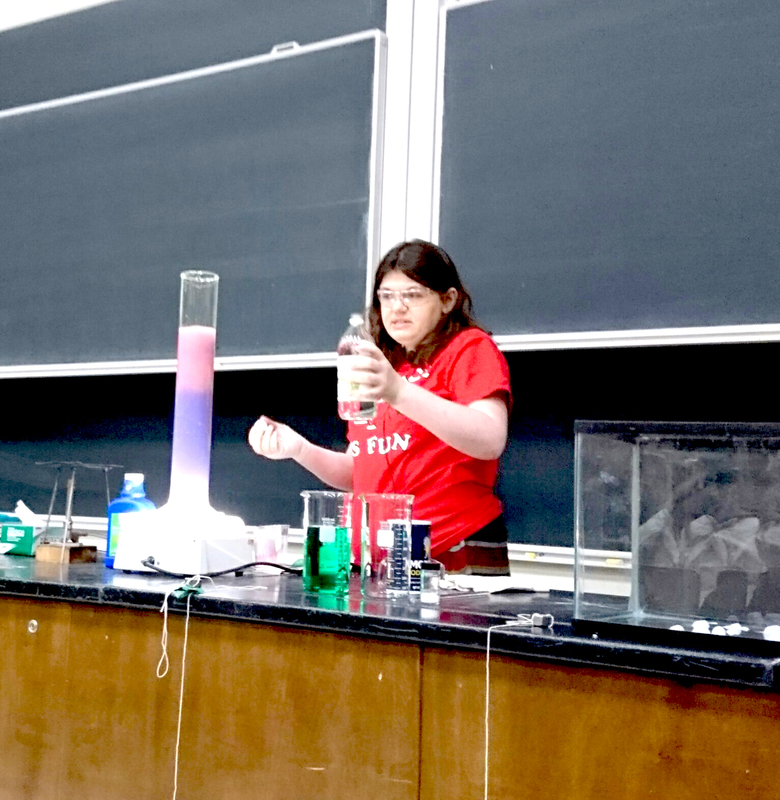 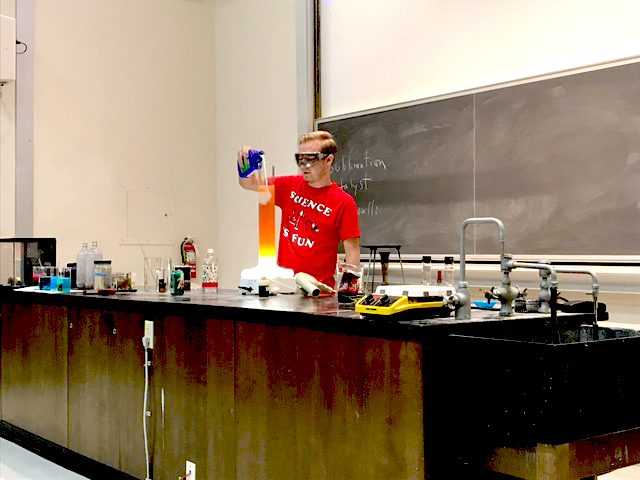 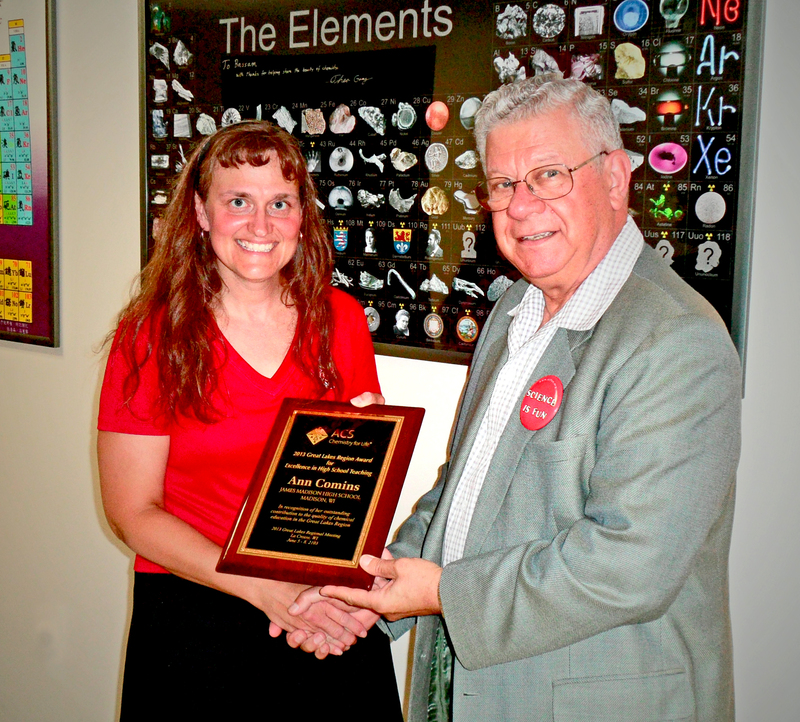 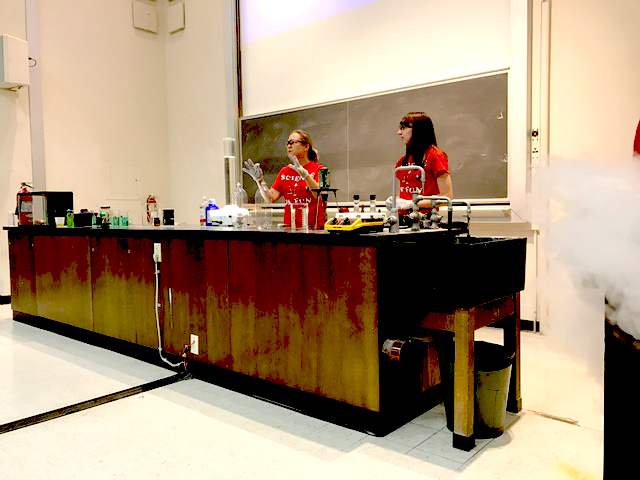 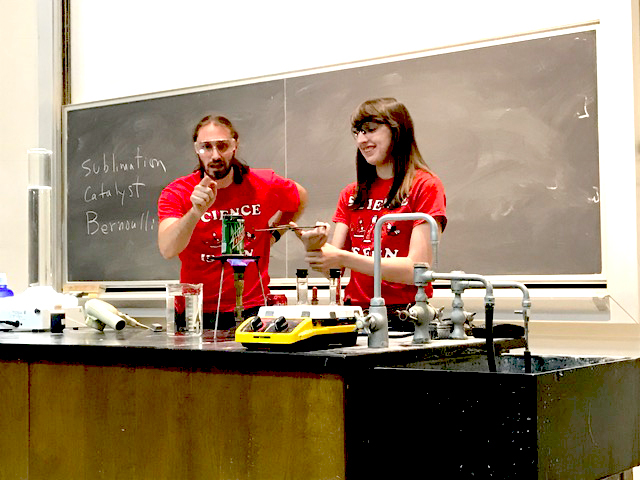 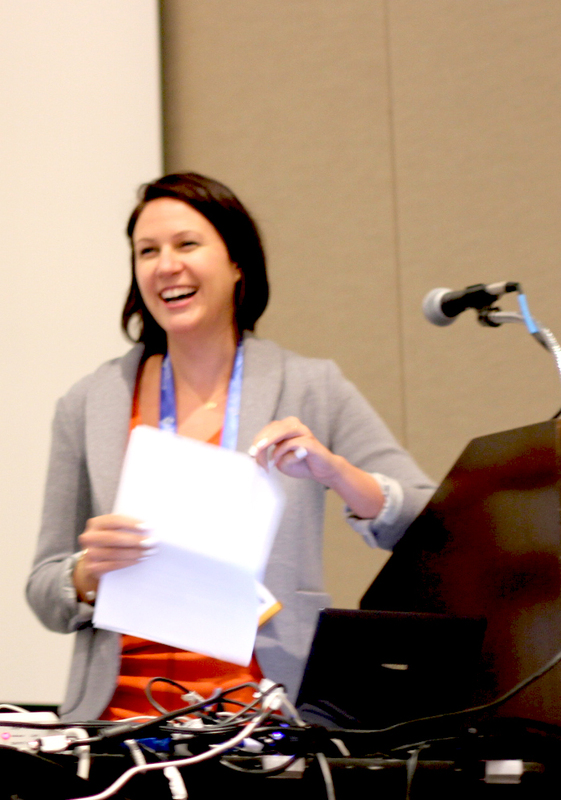 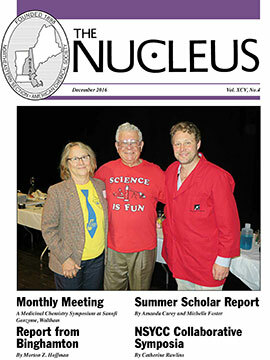 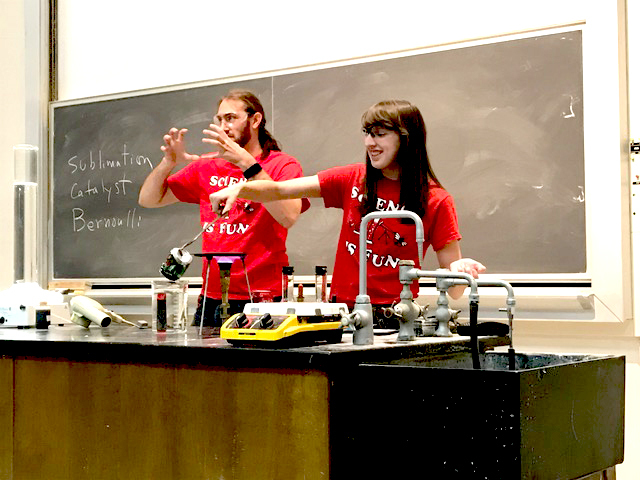 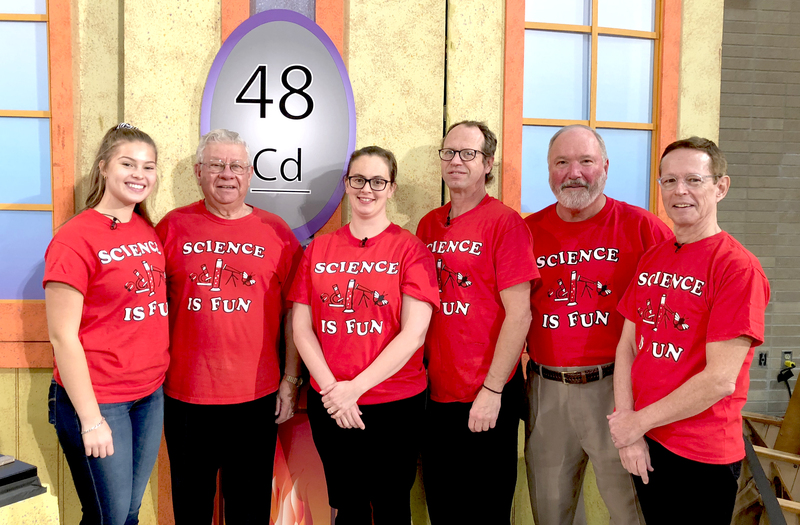 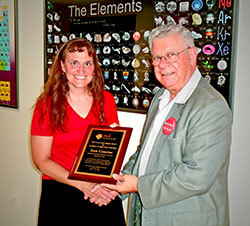 "Advancing Chemistry and Communicating Chemistry"
With Amanda Turek, PhD candidate at Harvard and Science is Fun alumna. 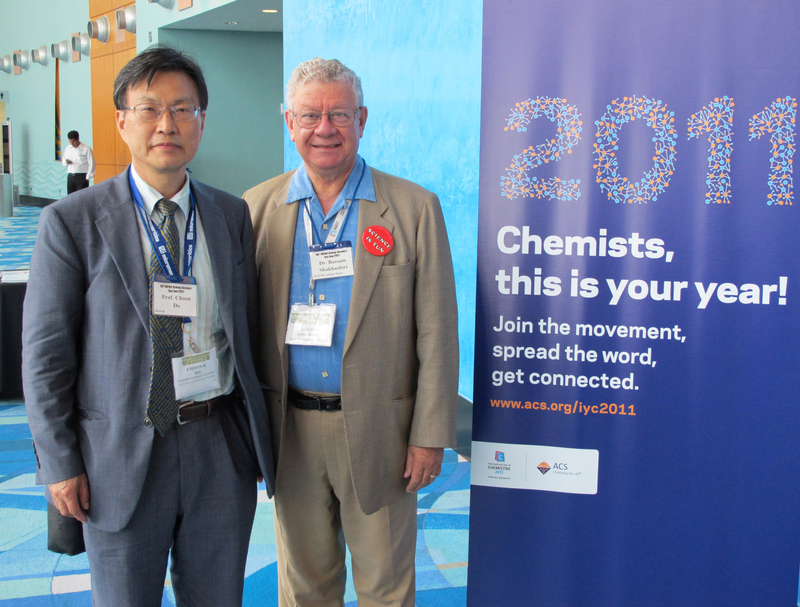 "Enlightenment and the Responsibilities of the Enlightened"
Why is chemistry IMPORTANT for the future? Keynote Presentation, "Advancing Science and Communicating Science"
"Advancing Graduate Education and Research in the Chemical Sciences"
"Advancing graduate education in the chemical sciences"
With science fans Chandini and Malini Sridharan after the Saturday morning presentation. 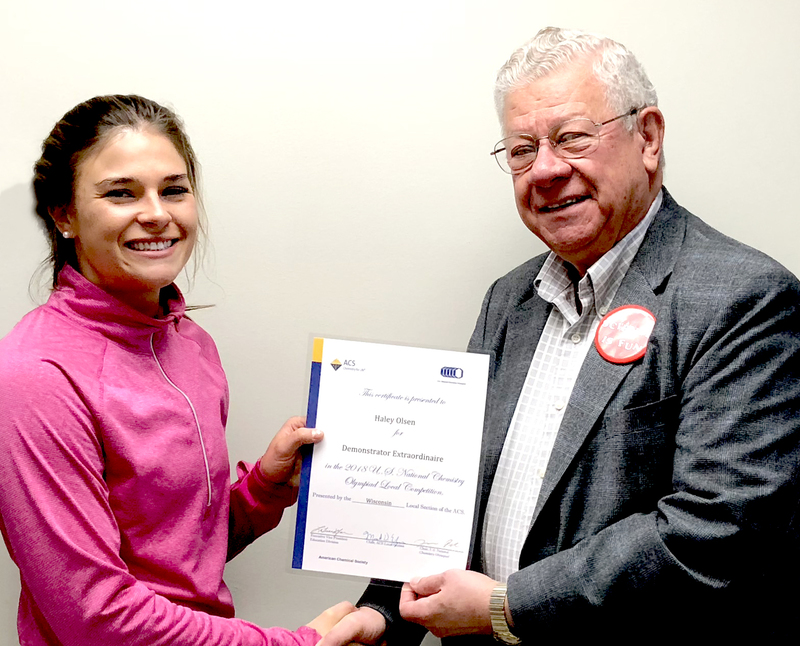 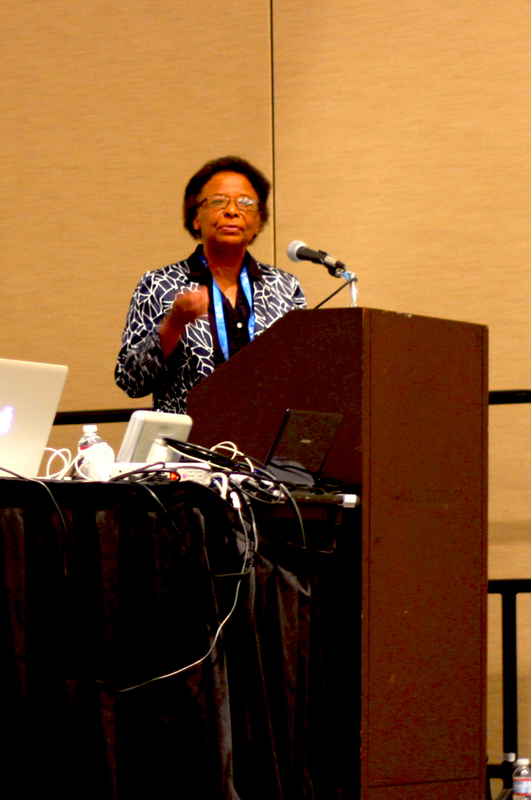 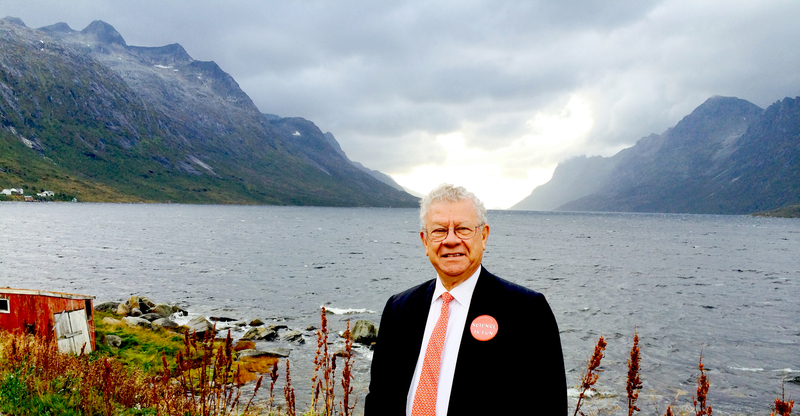 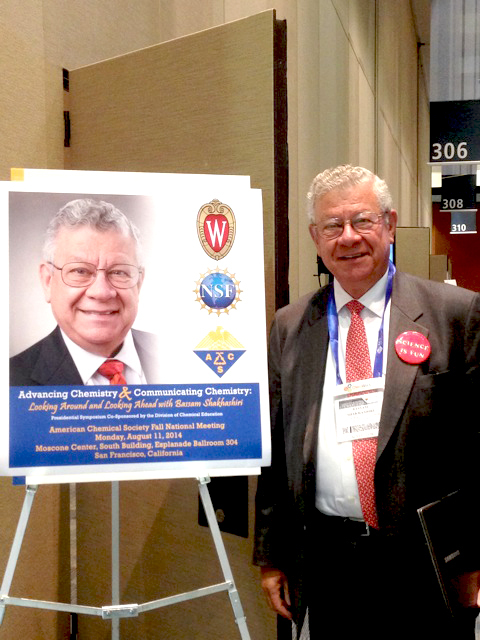 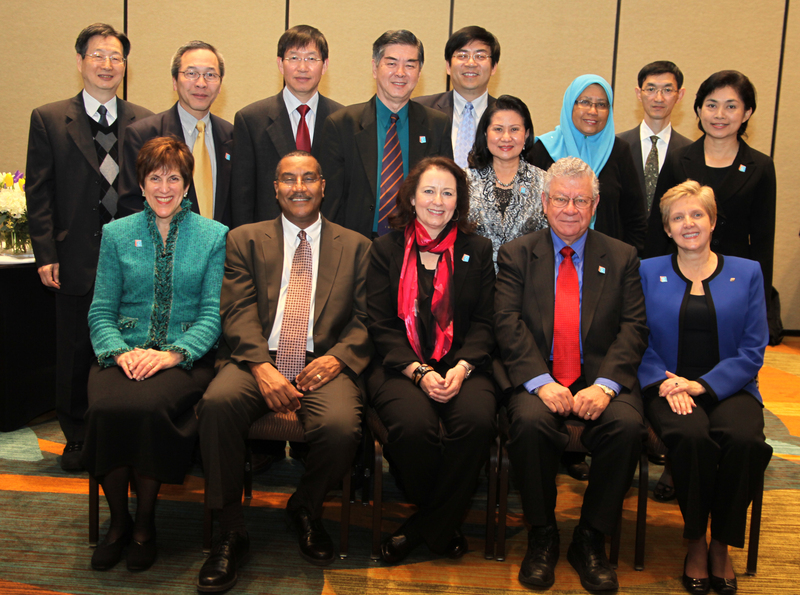 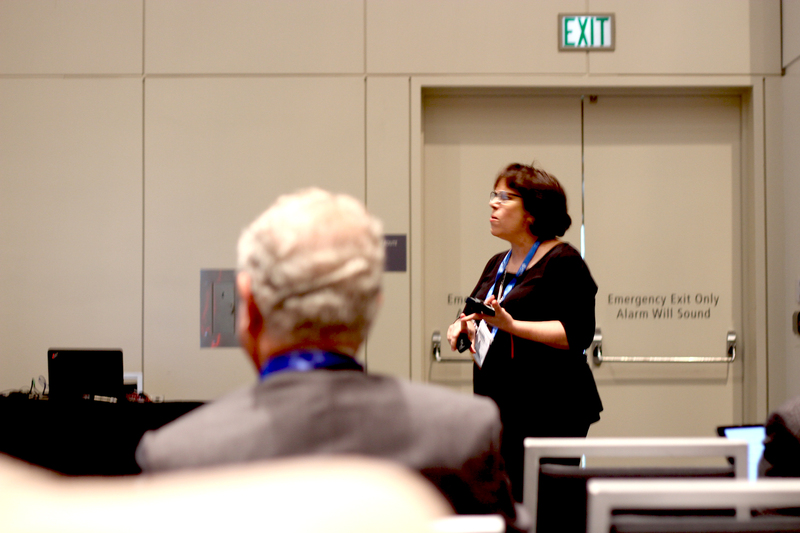 "The Leadership Role of the ACS in Addressing Grand Global Challenges"
of her outstanding contribution to the quality of chemical education in the Great Lakes Region"
at the ACS-GLRM. 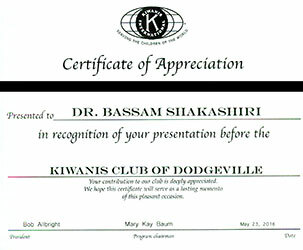 Here Bassam is presenting Ann with her award. 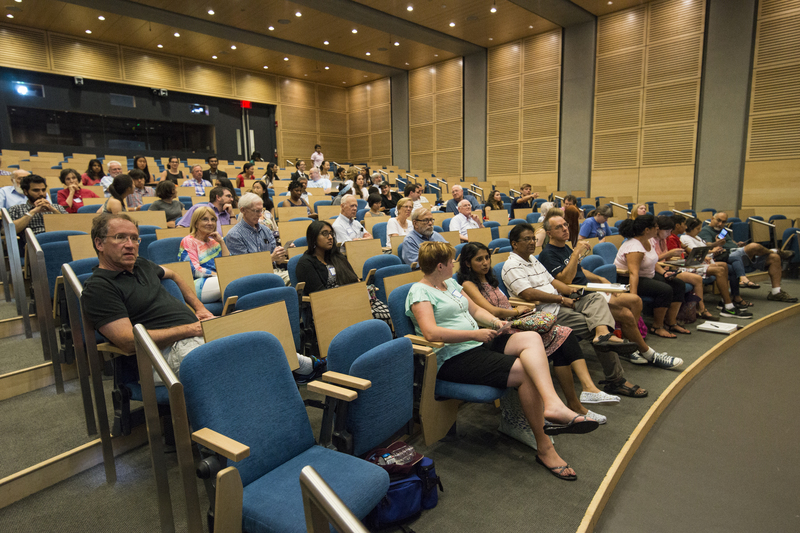 The speakers discuss new interactive tools that demystify the science behind climate change, integrating lessons from the past, climate communication from a science perspective, and the responsibility scientists have to communicate effectively. 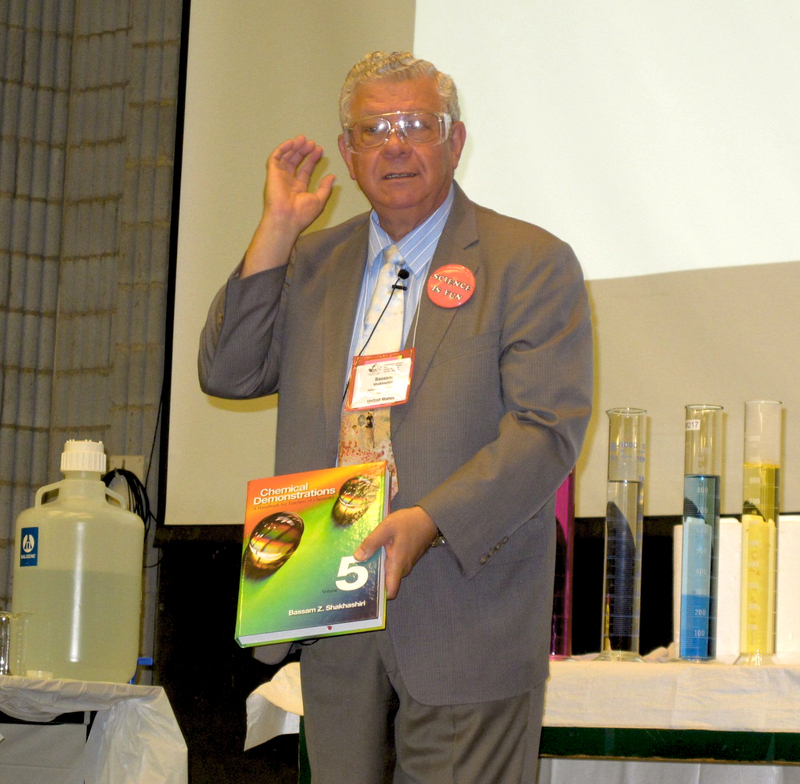 The speakers discuss water sustainability, technological and institutional challenges, the convergence of nanotechnology and microbiology, and how Dow technologies are confronting the water challenge. 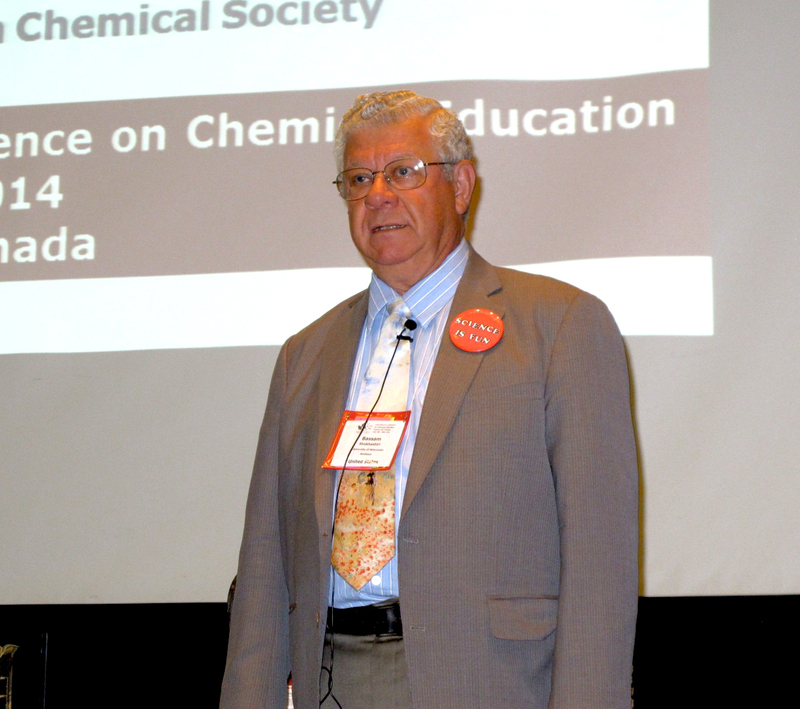 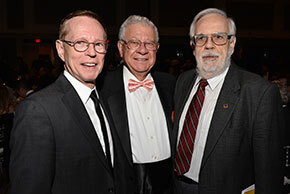 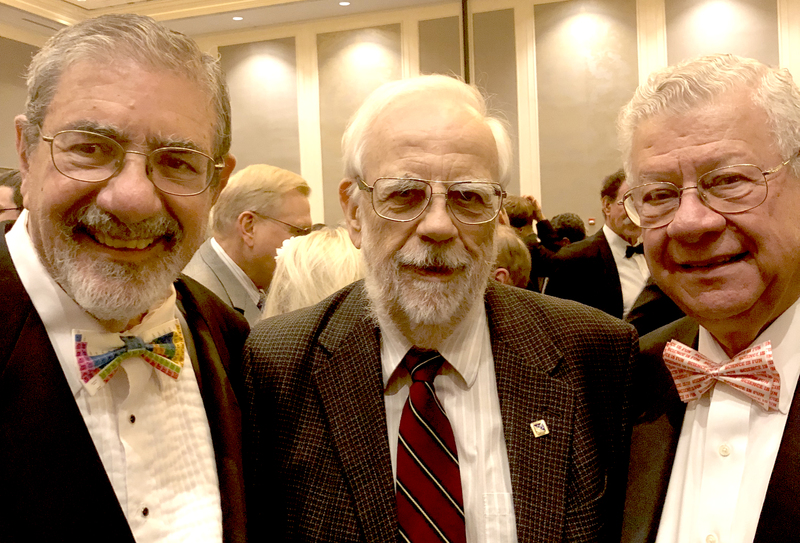 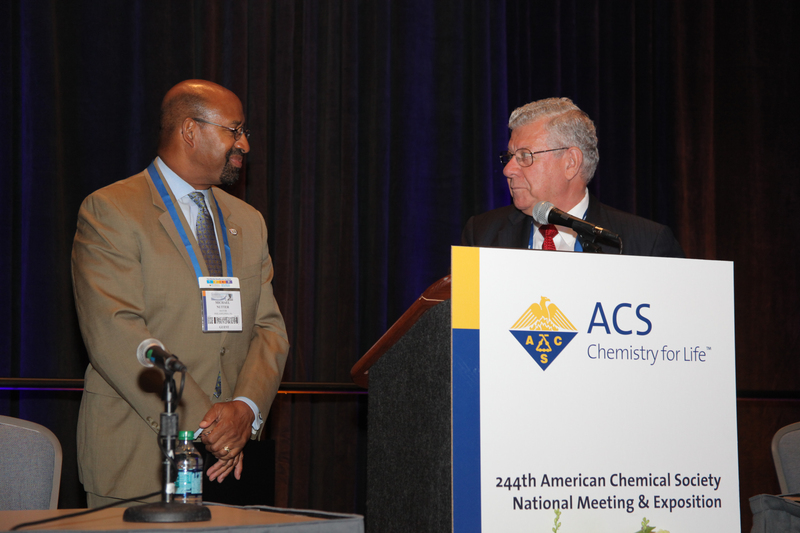 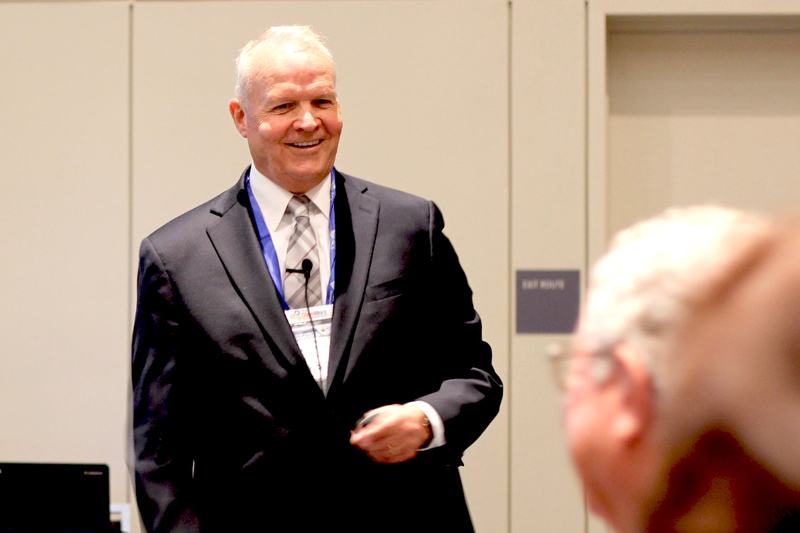 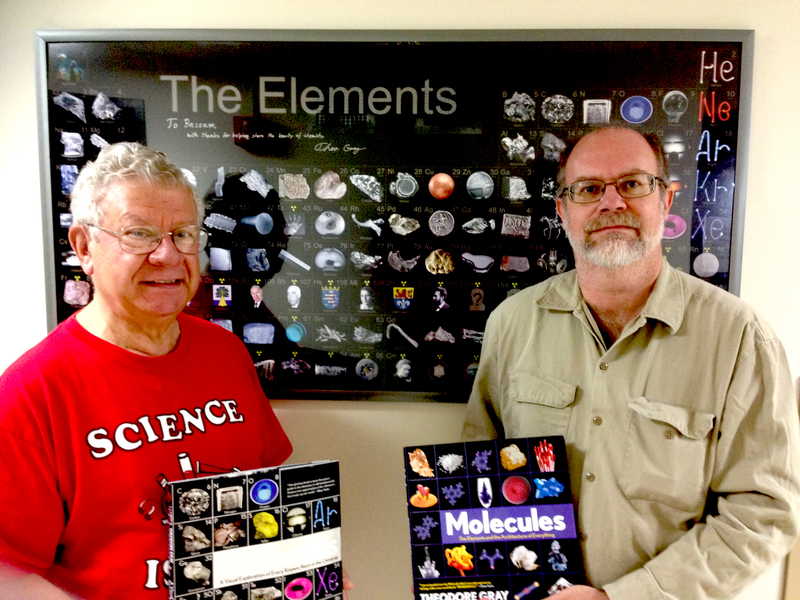 Larry Faulkner and Paul Houston discuss the big questions facing the ACS Commission on Advancing Graduate Education in the Chemical Sciences, and the recommendations of the commission's working groups. 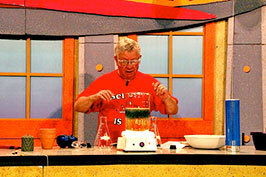 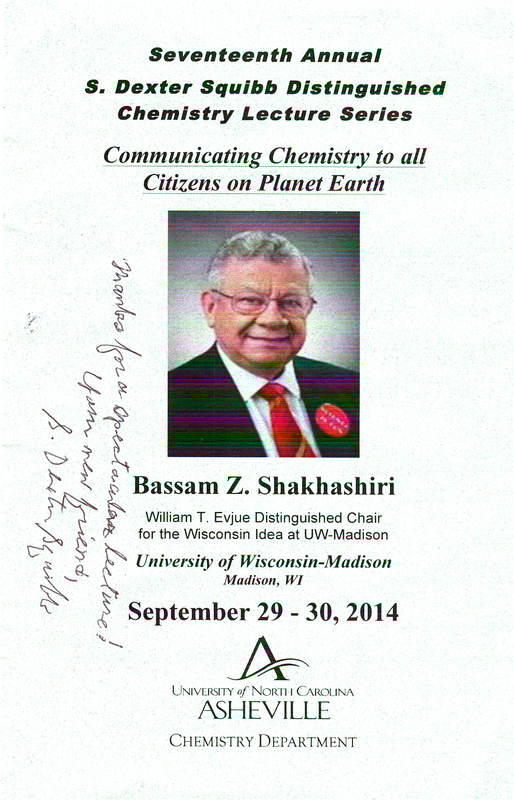 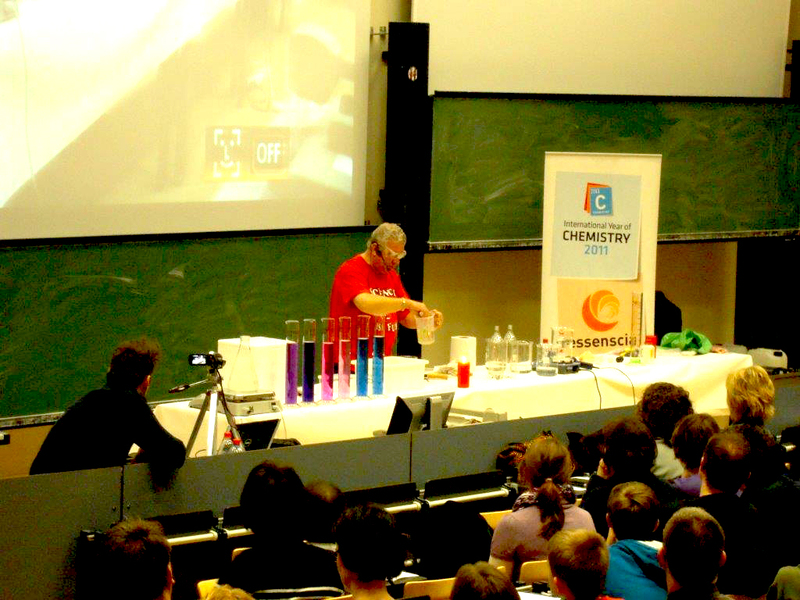 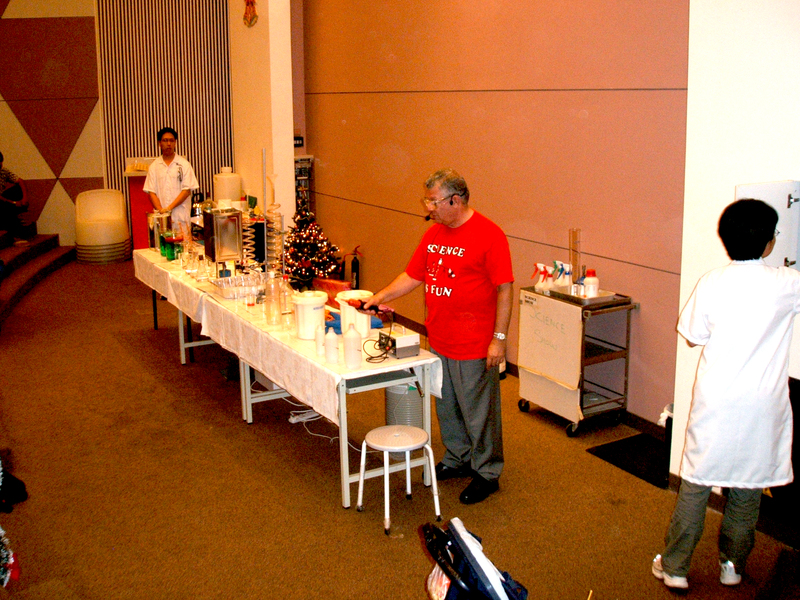 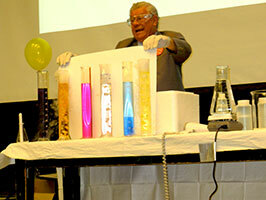 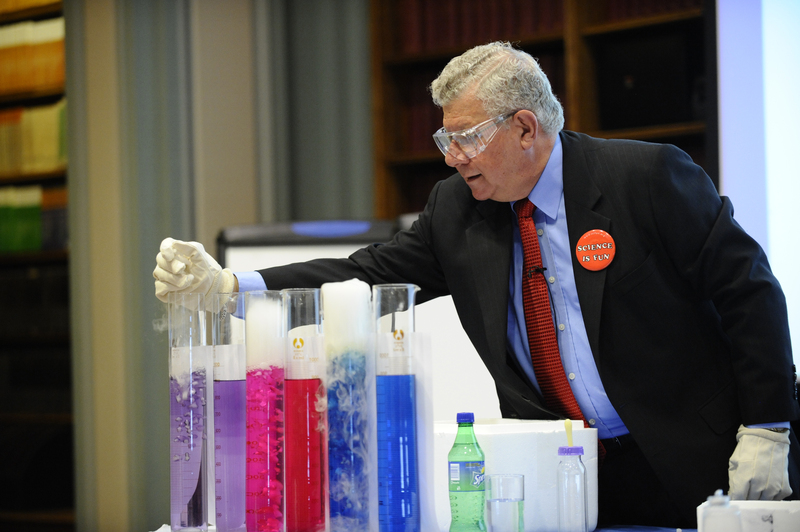 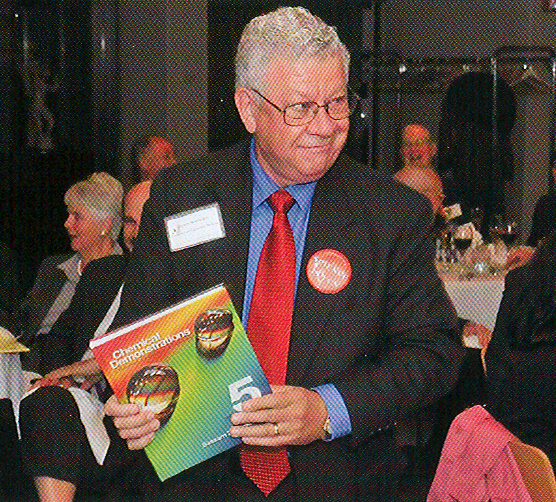 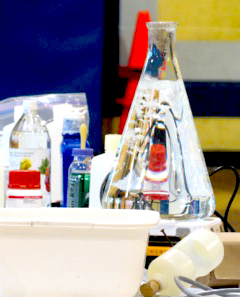 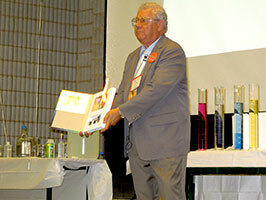 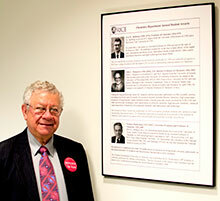 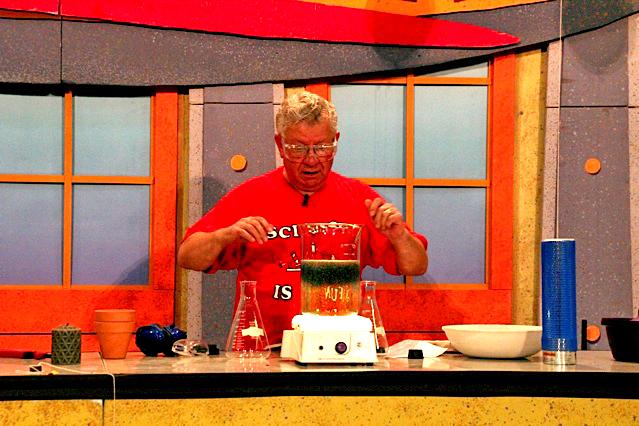 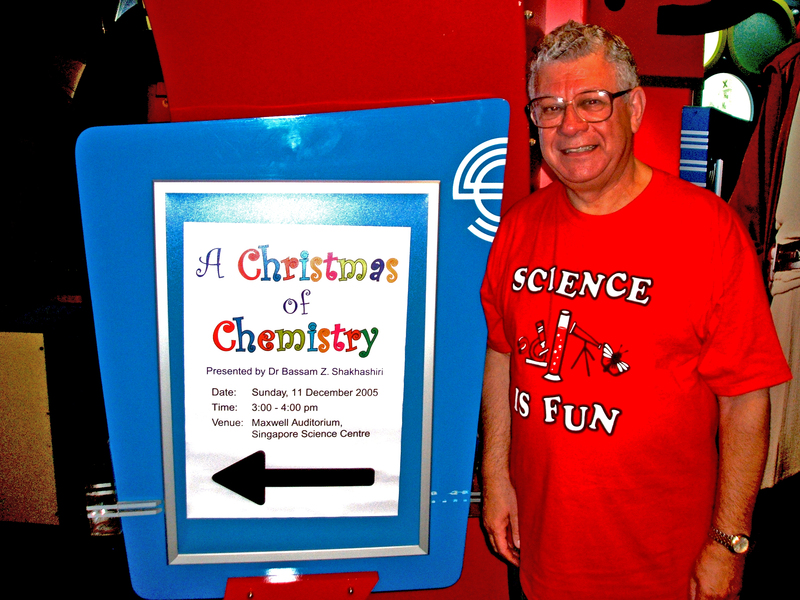 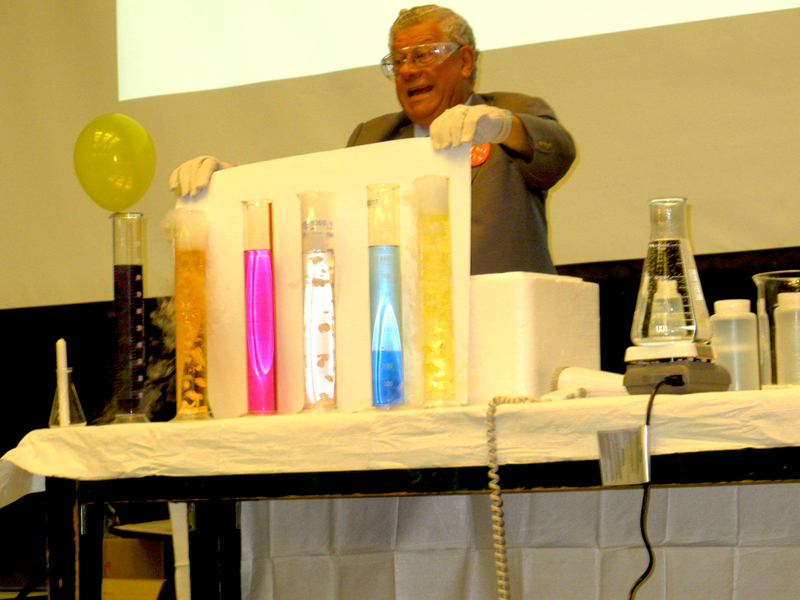 Professor Shakhashiri has helped launch National Chemistry Week since 1987. The alumni magazine of Walnut Hill School for the Arts talks to Brauner's daughter about her mother's commitment to mentoring students and her passion for diverse and innovative scientific studies. 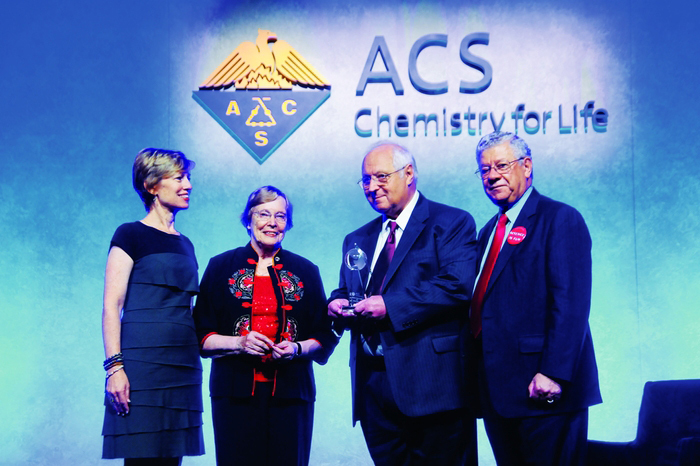 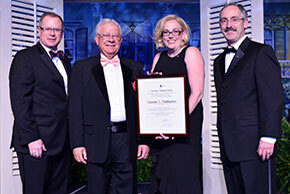 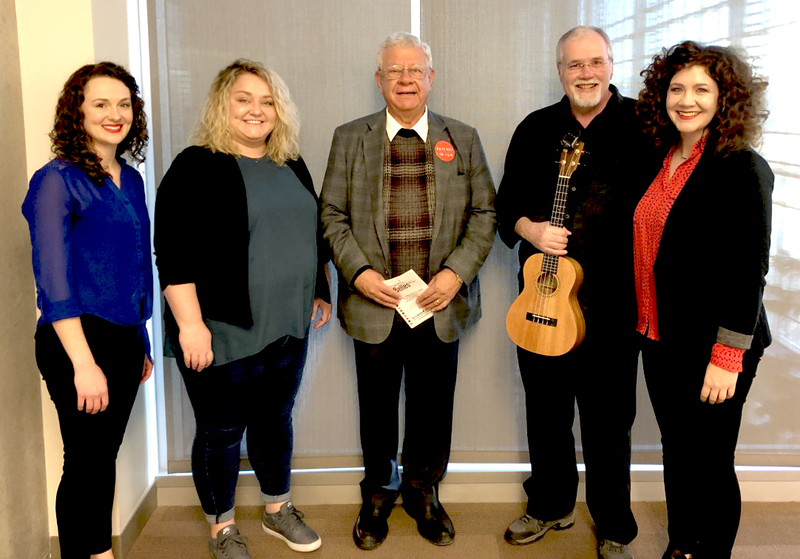 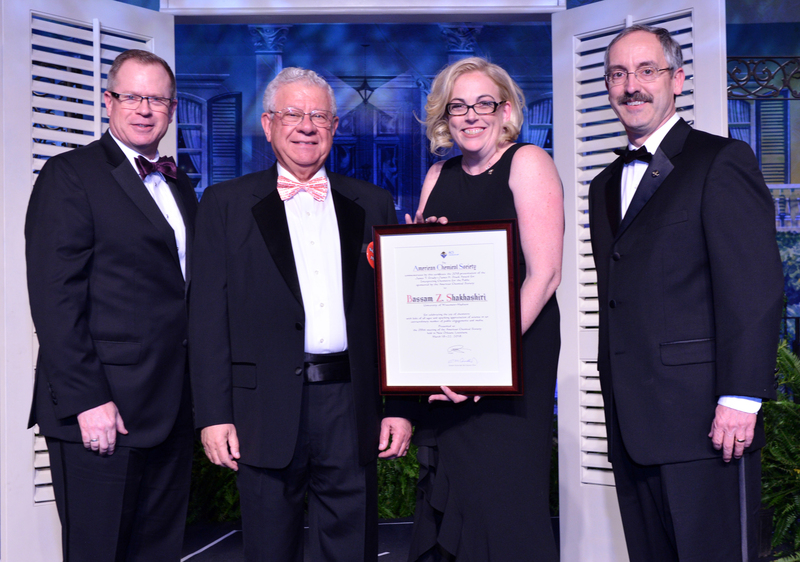 WISL Honorary Fellow Ron Perkins receives the Helen M. Free Award for Public Outreach from Cheryl Frech (from left), chair of the ACS Committee on Public Relations & Communications; Free; and Shakhashiri. 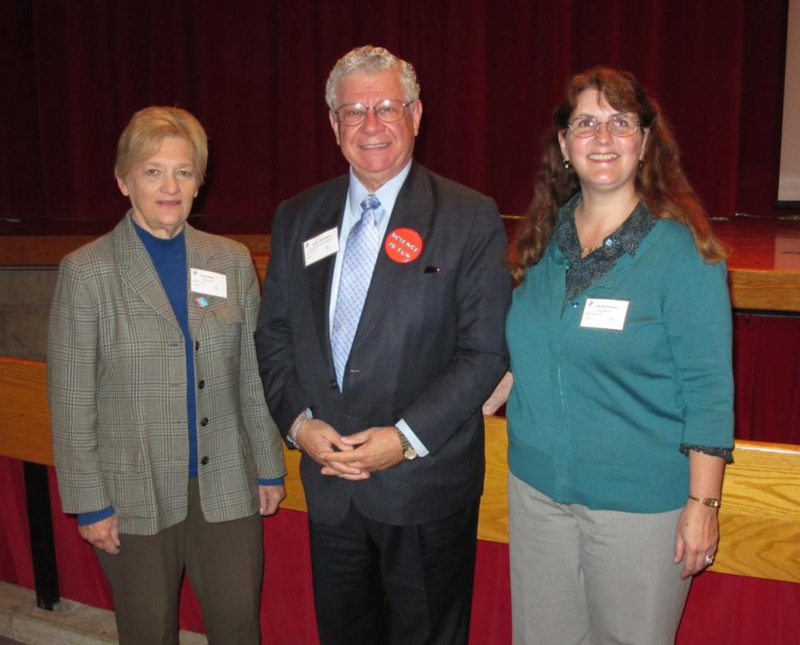 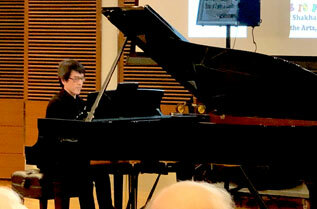 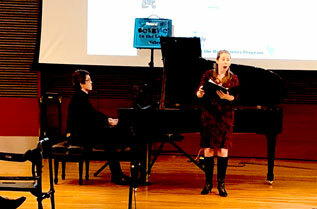 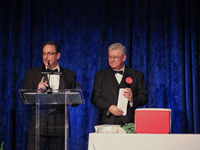 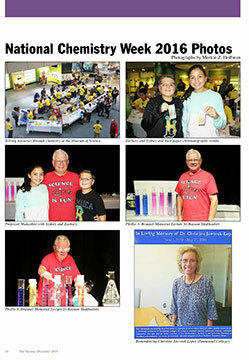 Photos courtesy of Linda Wang, C&E News unless otherwise specified. 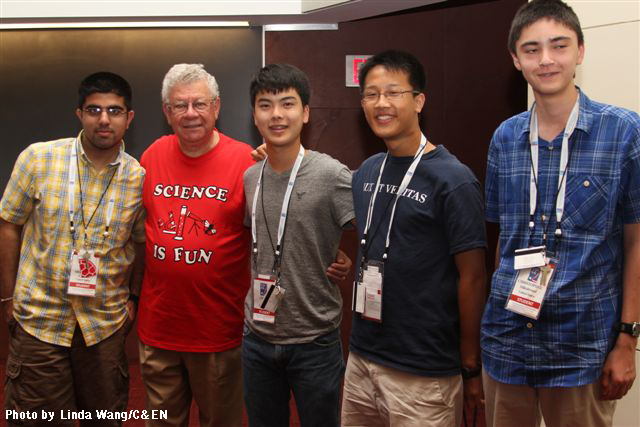 The U.S. team, Sidharth Chand (silver medalist), Jason Ge (silver medalist), James Deng (silver medalist) and Christopher Hillenbrand (gold medalist) pose with Bassam at the 44th International Chemistry Olympiad. 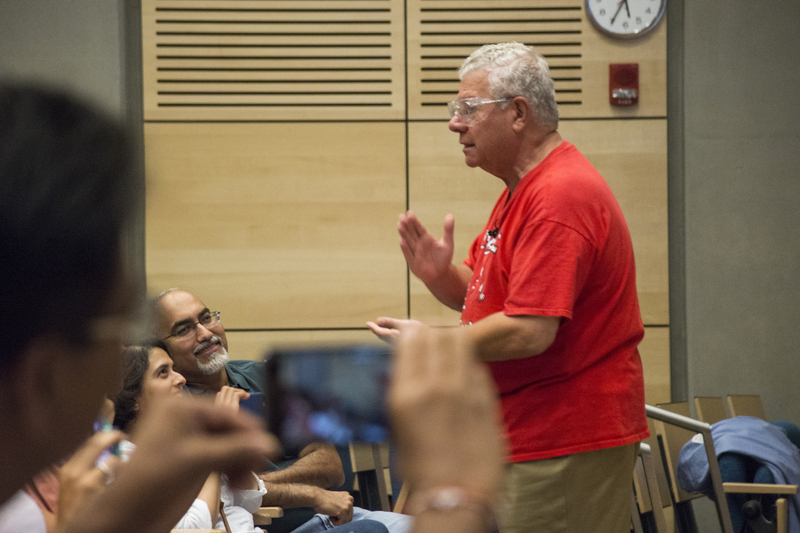 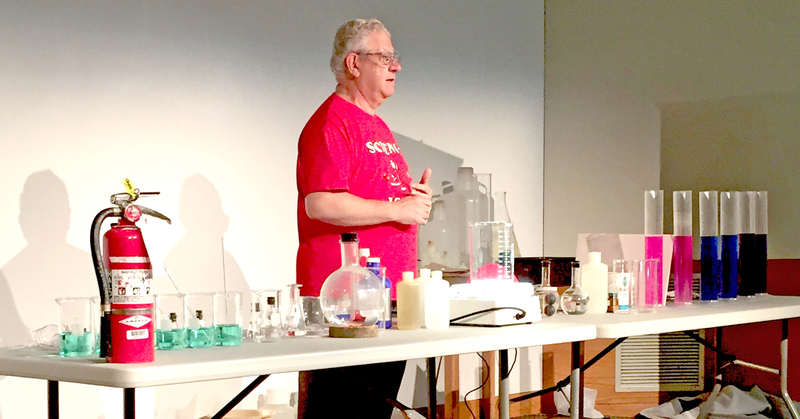 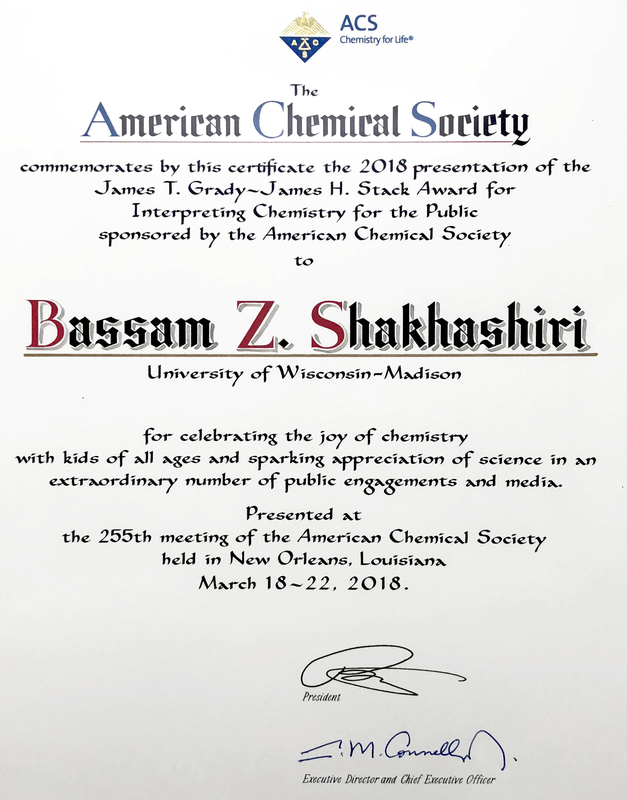 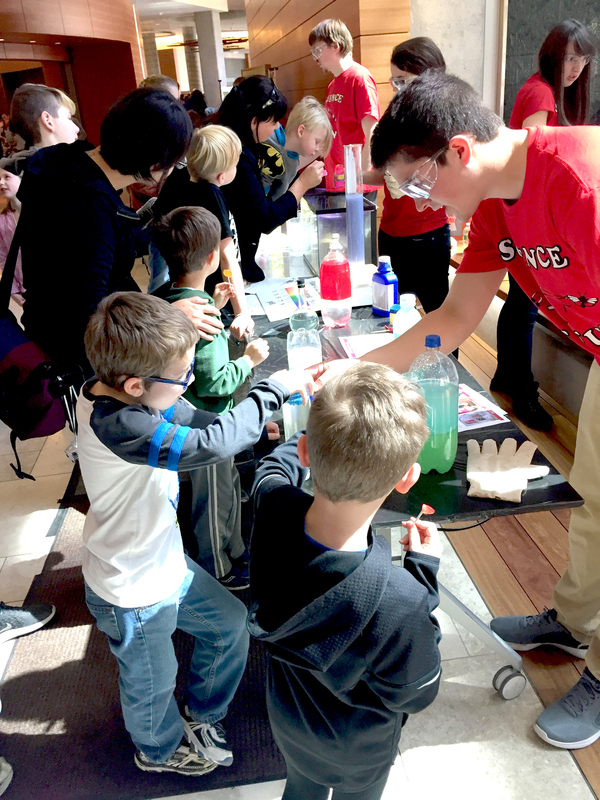 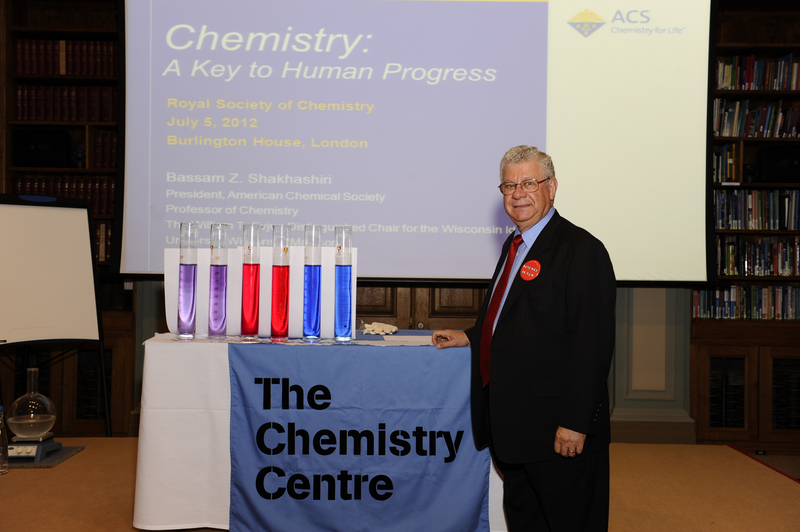 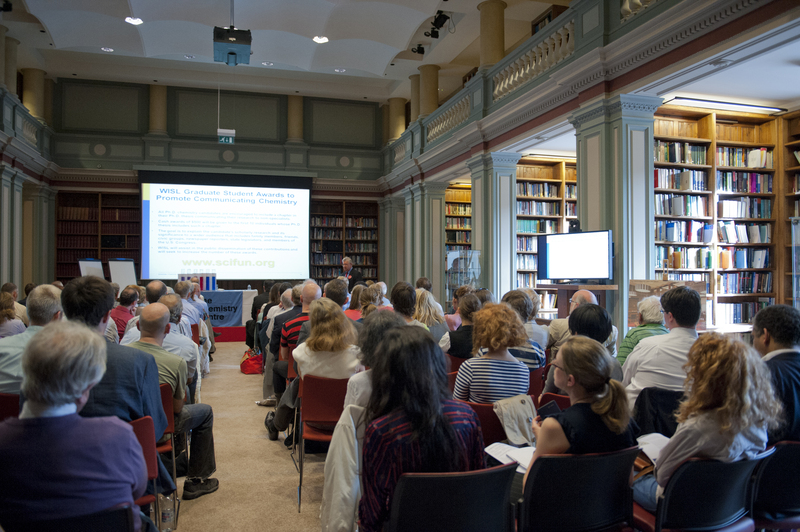 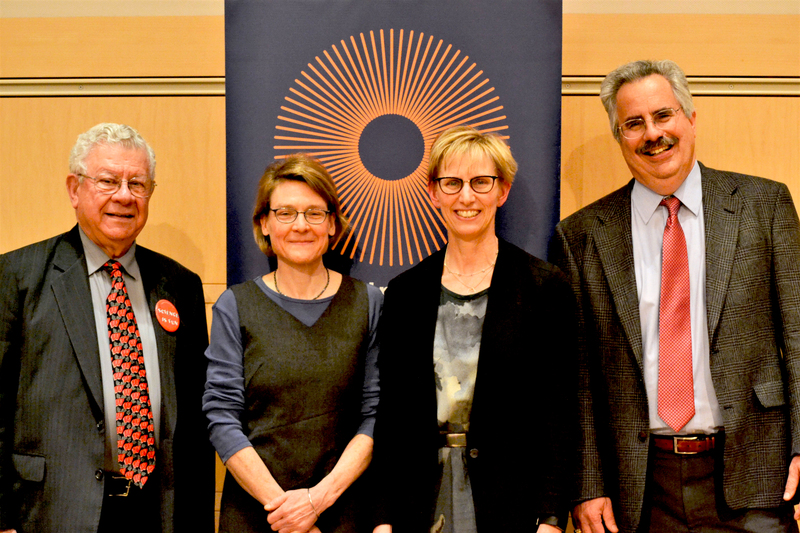 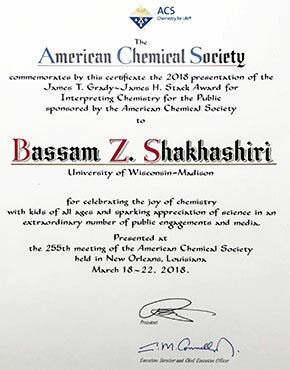 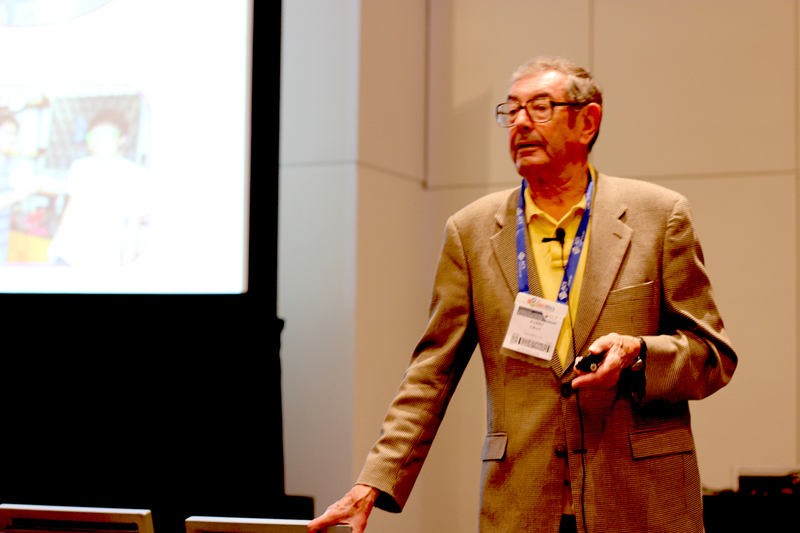 View Bassam's talk, "Chemistry: A Key to Human Progress"
Thank you to the Royal Society of Chemistry for providing us with photos of this wonderful event! 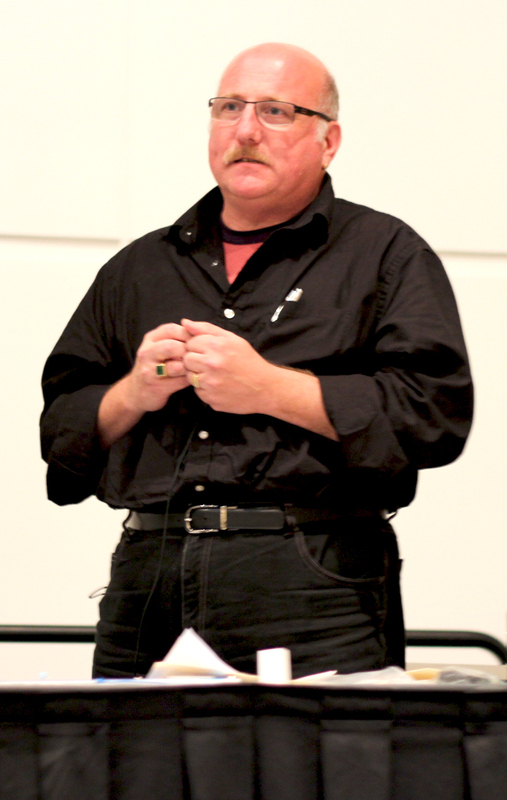 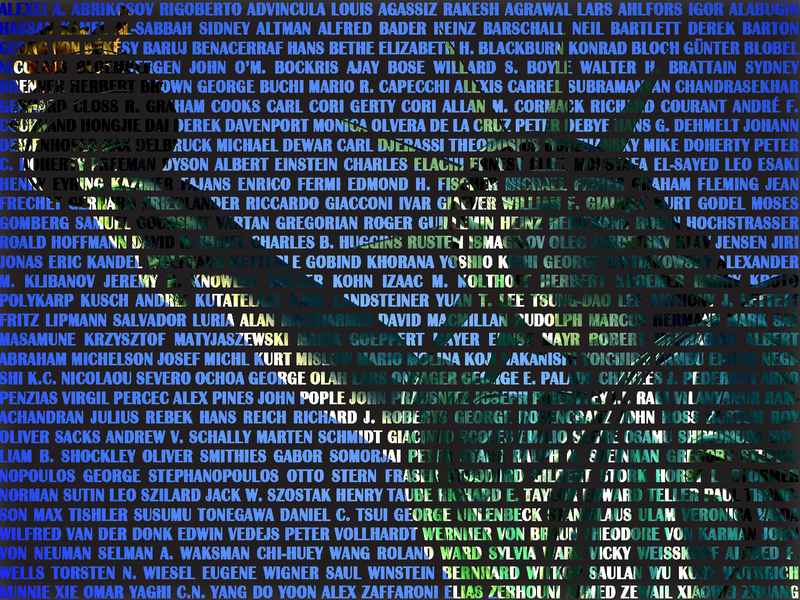 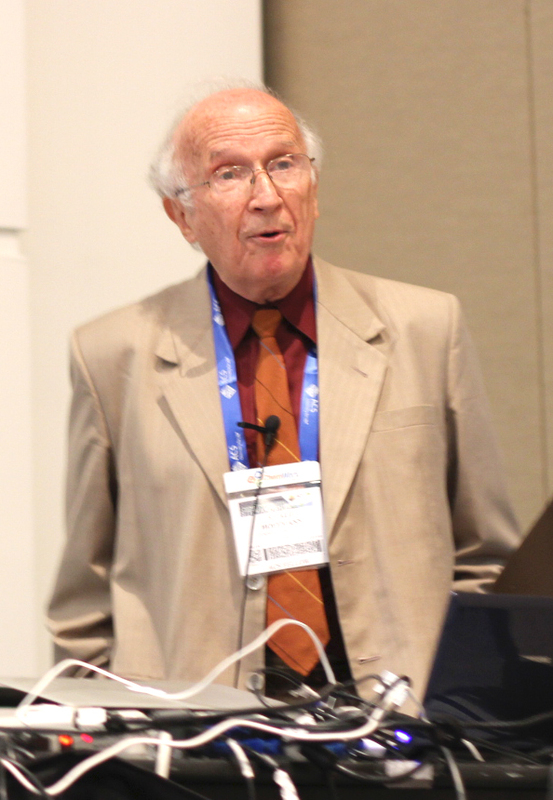 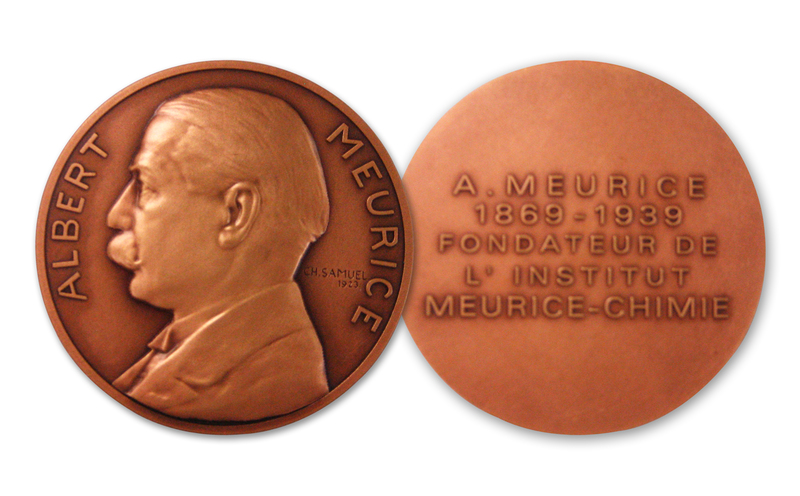 For his extensive, broad outreach to the public that bridges the chasm between science and popular culture as well as science and public policy through his popular books and lectures, editorials in major newspapers and magazines, regular columns in scientific journals, musical performances, and television documentaries and news programs. 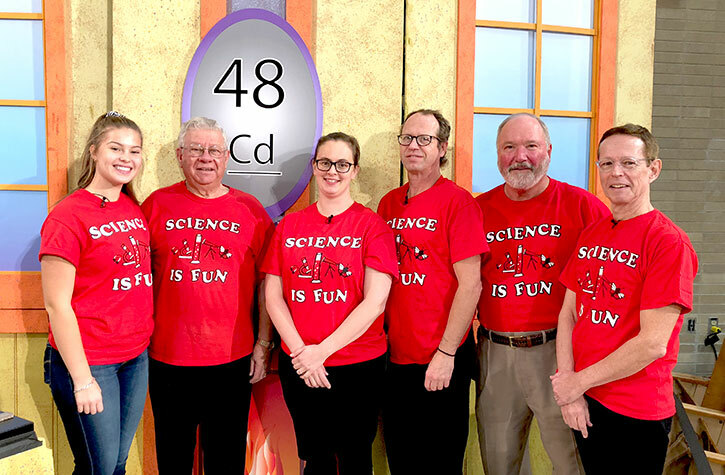 For its decades-long commitment to deep, thoughtful, and engaging coverage of science that offers compelling explanations of important and complex issues as an integral part of its public-service broadcast mission. 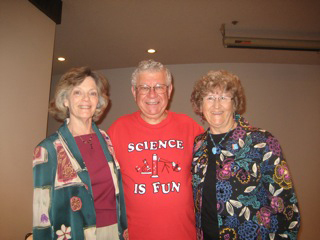 With Prof. Ruth Tanner, chair-elect of ACS Northeastern Section, and Prof. Marietta Schwartz, organizer of the conference and former TA of Bassam's at UW-Madison. 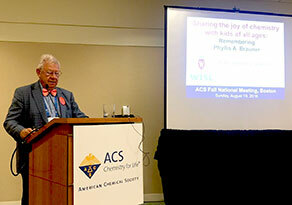 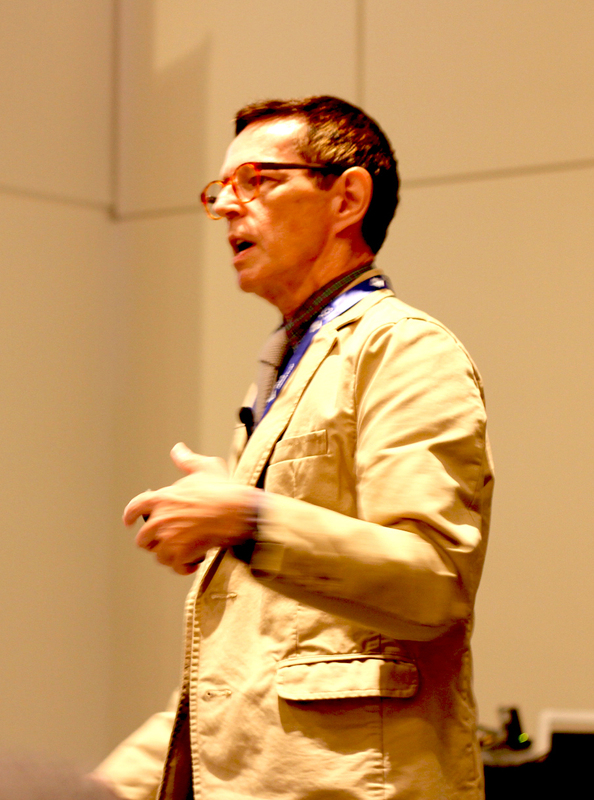 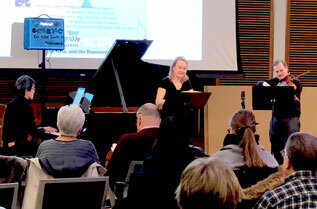 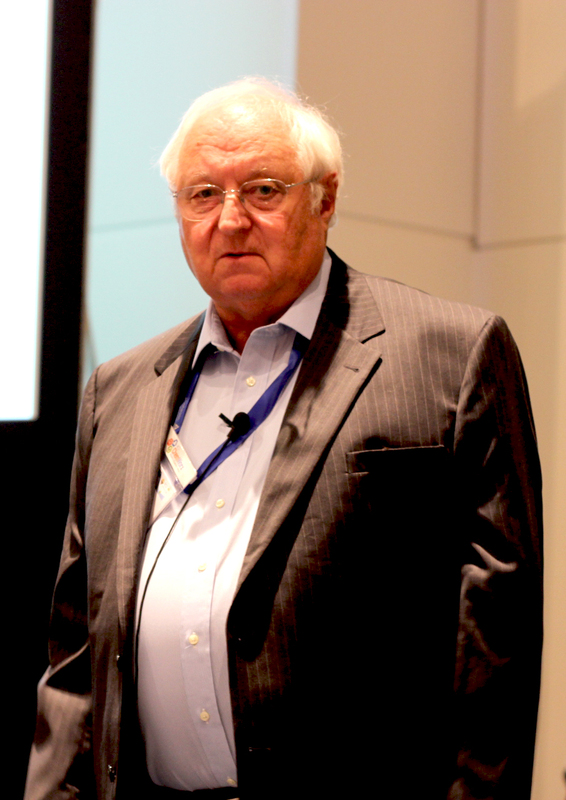 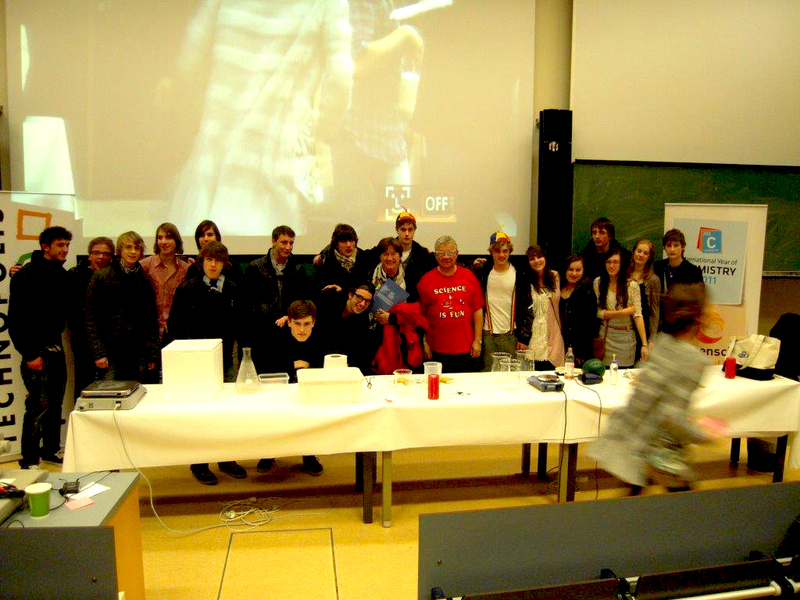 Giving the Phylis A. Brauner Memorial Lecture. 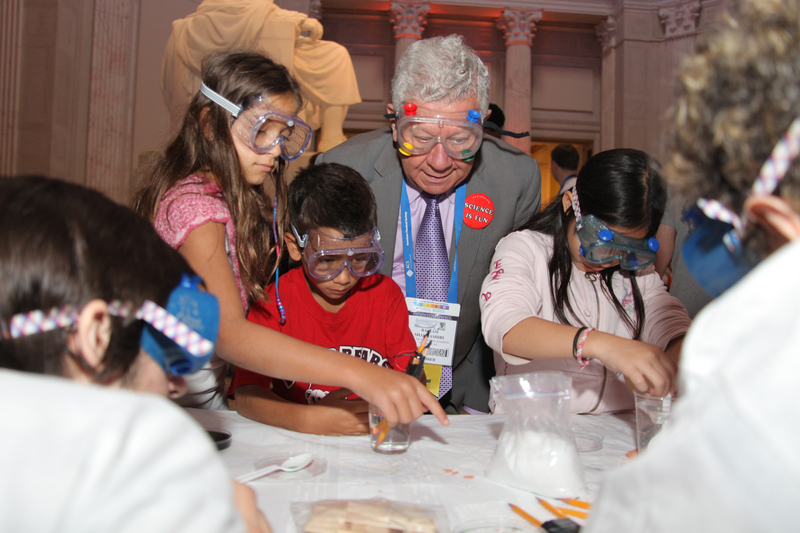 With some young National Chemistry Week participants. 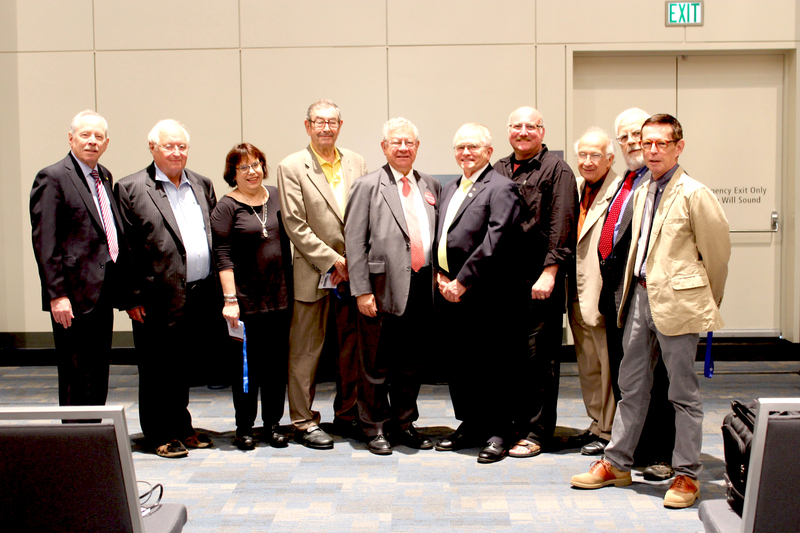 With Northeastern Section members and members of the Brauner family. 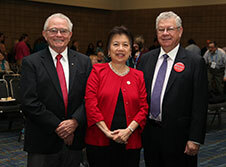 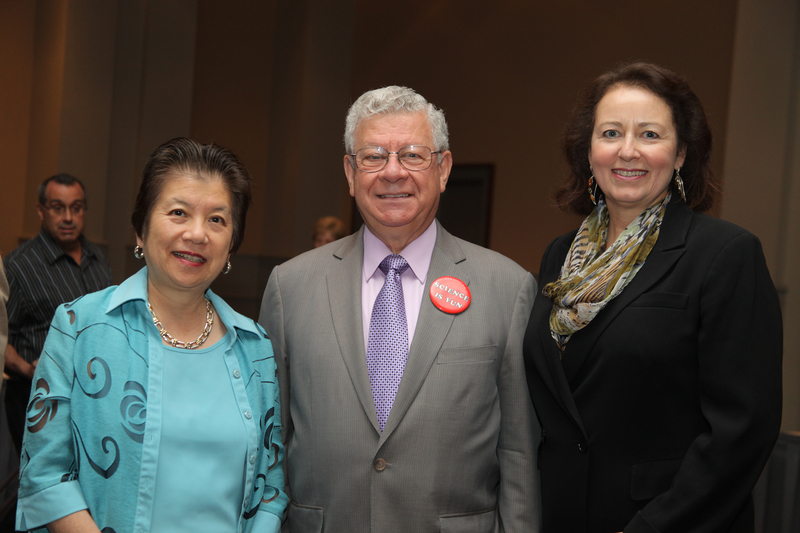 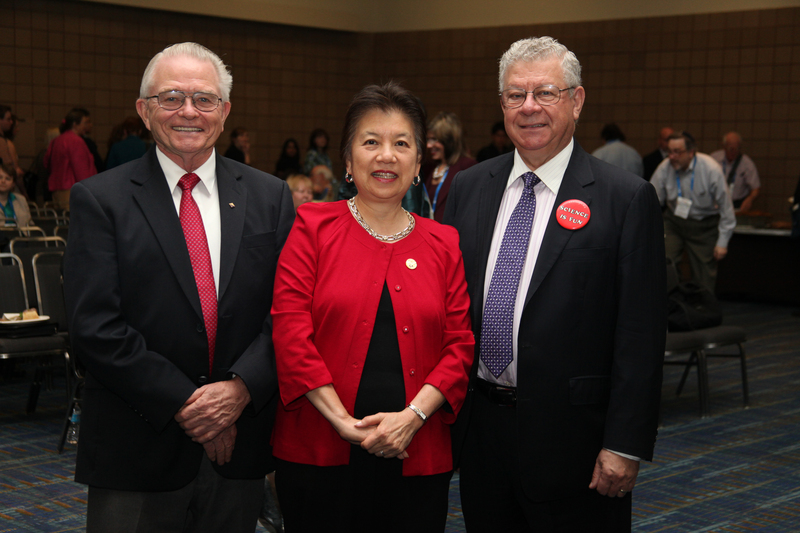 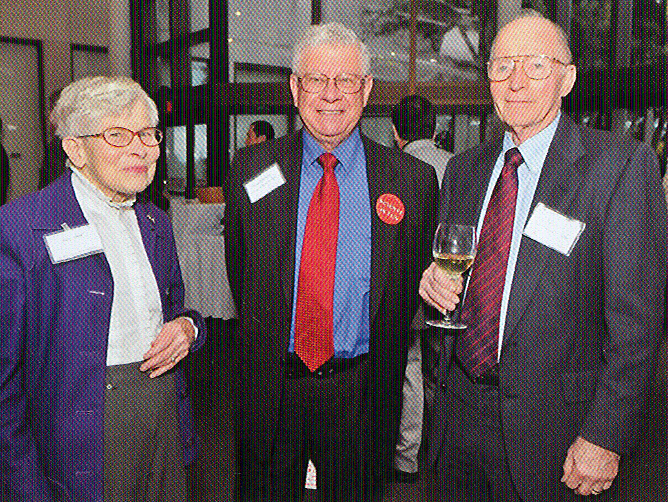 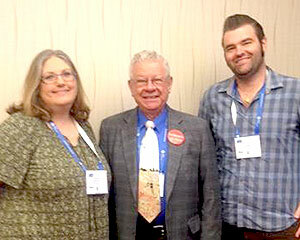 With Nancy and Louis Allred at the prize reception. 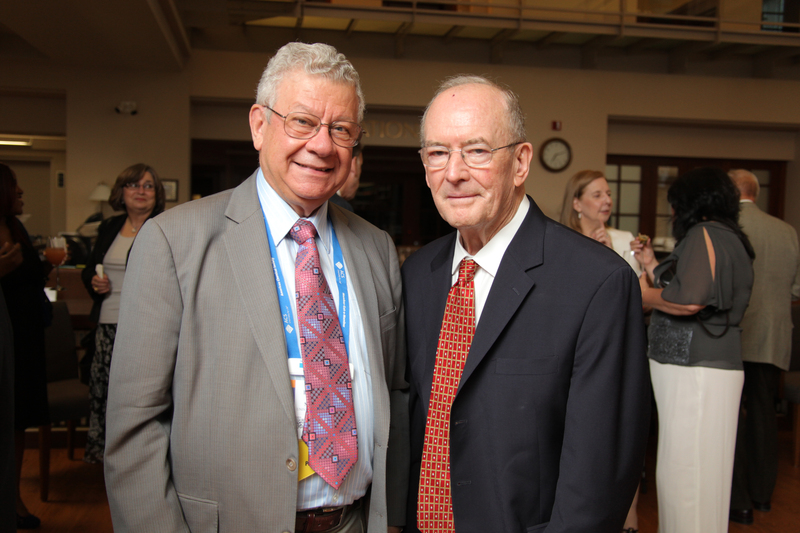 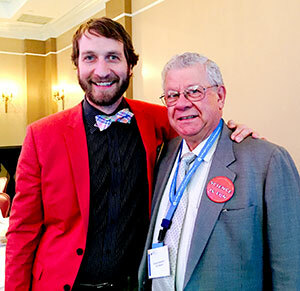 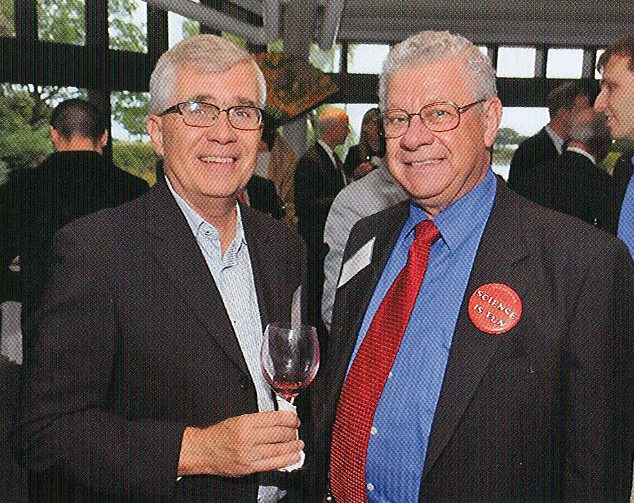 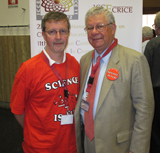 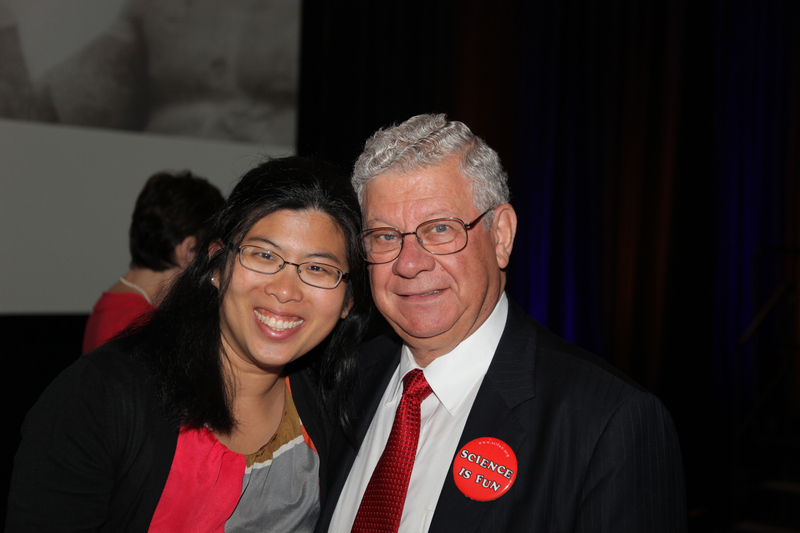 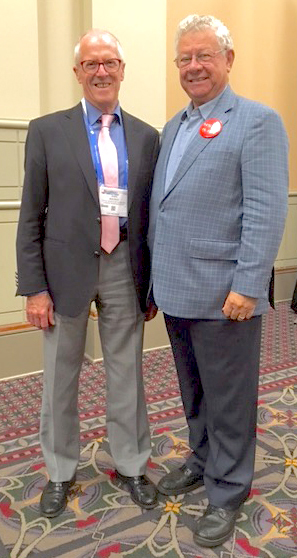 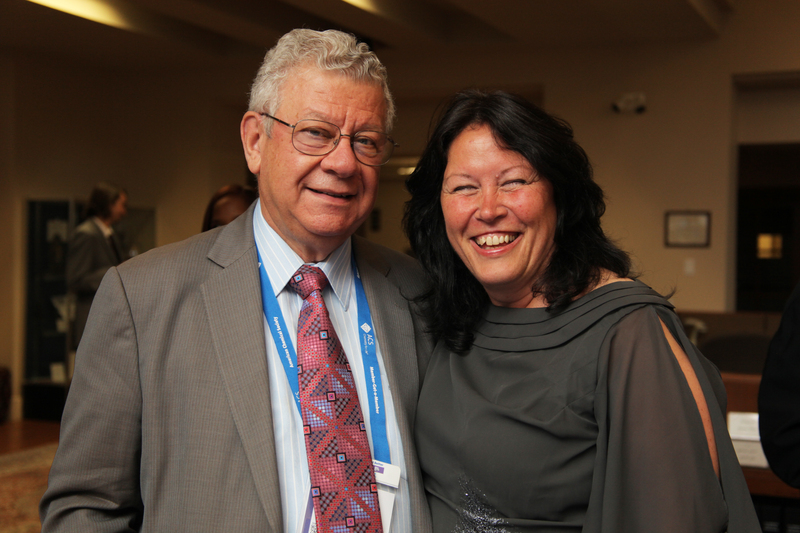 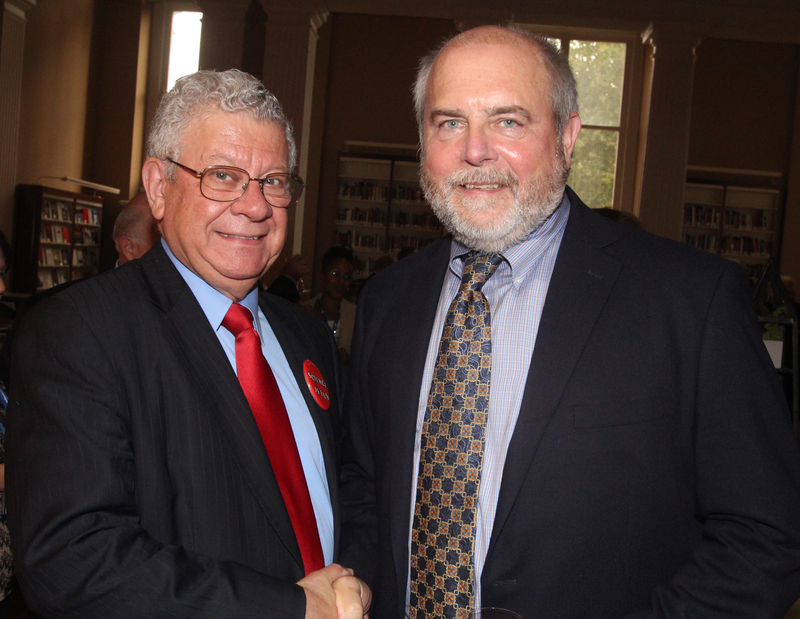 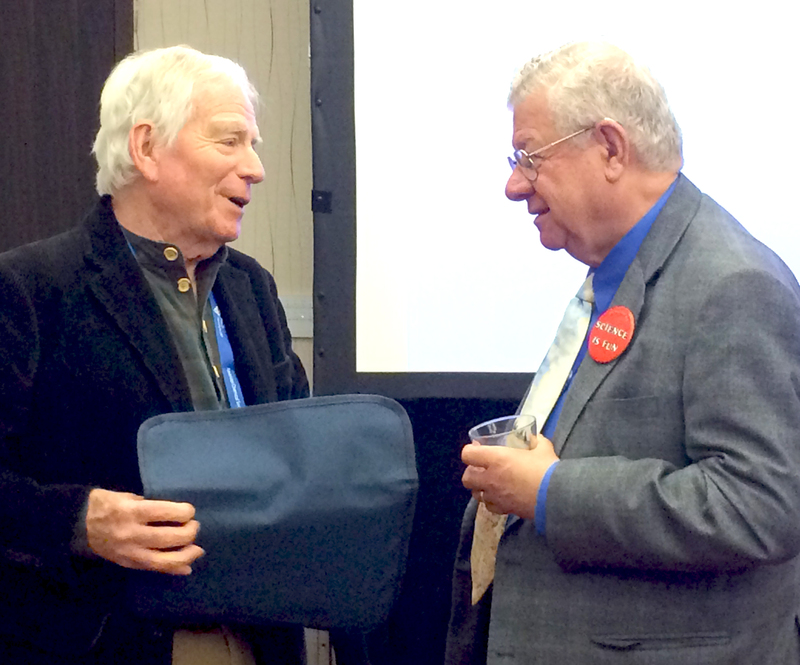 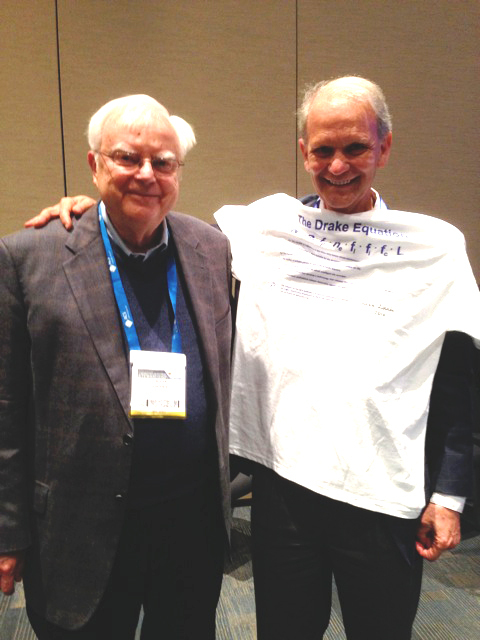 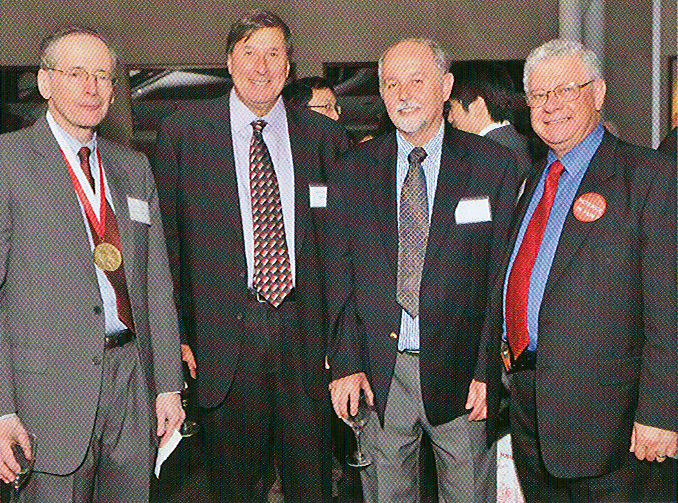 With Kenneth Poeppelmeier at the prize reception. 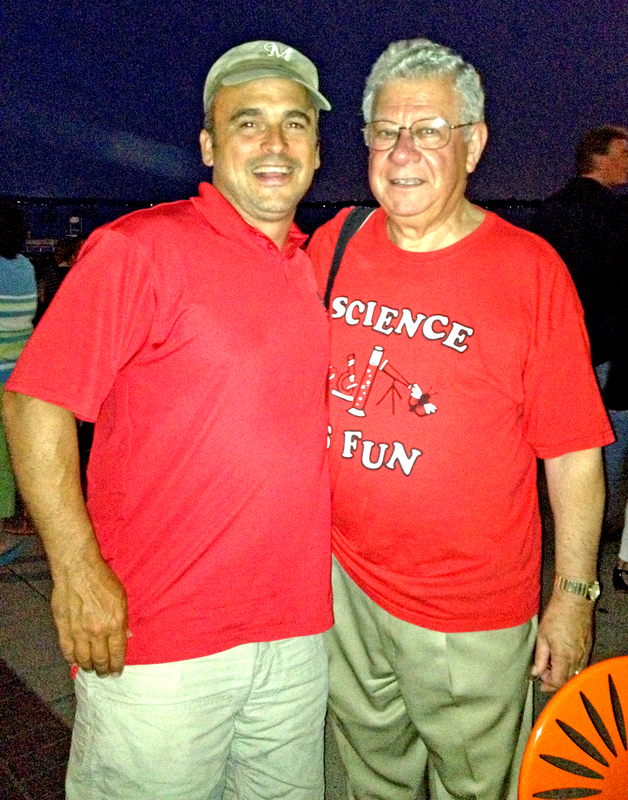 With Tobin J. 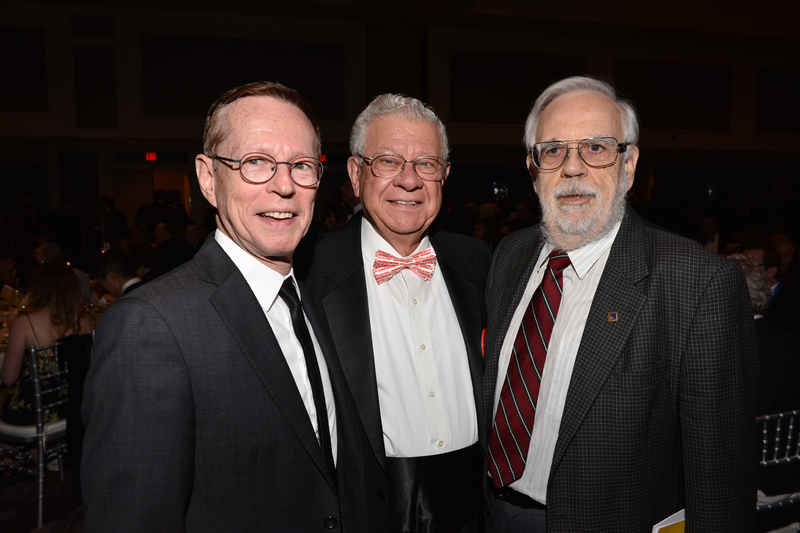 Marks, Jeffrey Bricker and Richard Adams. 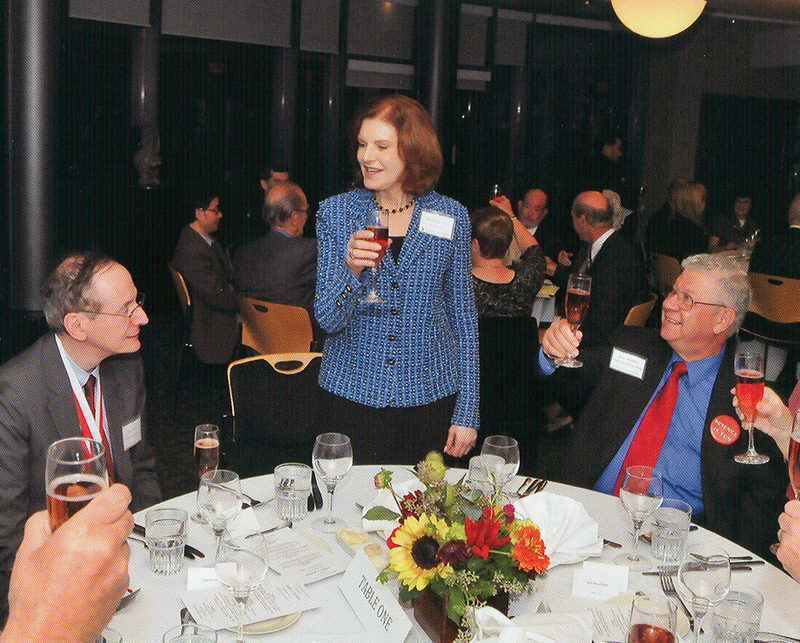 Dorothy Dinsmoor speaking at the prize dinner. 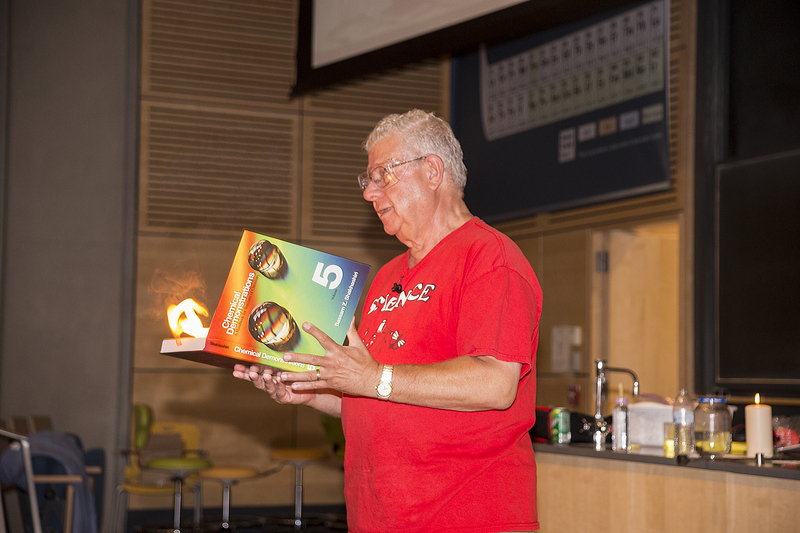 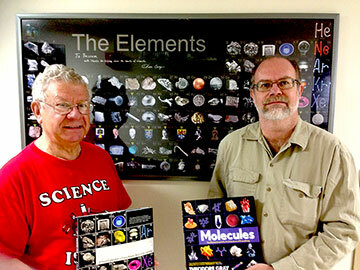 Presenting a copy of Chemical Demonstrations Volume 5 to the man of honor. 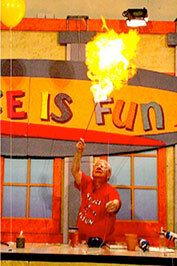 Tobin J. 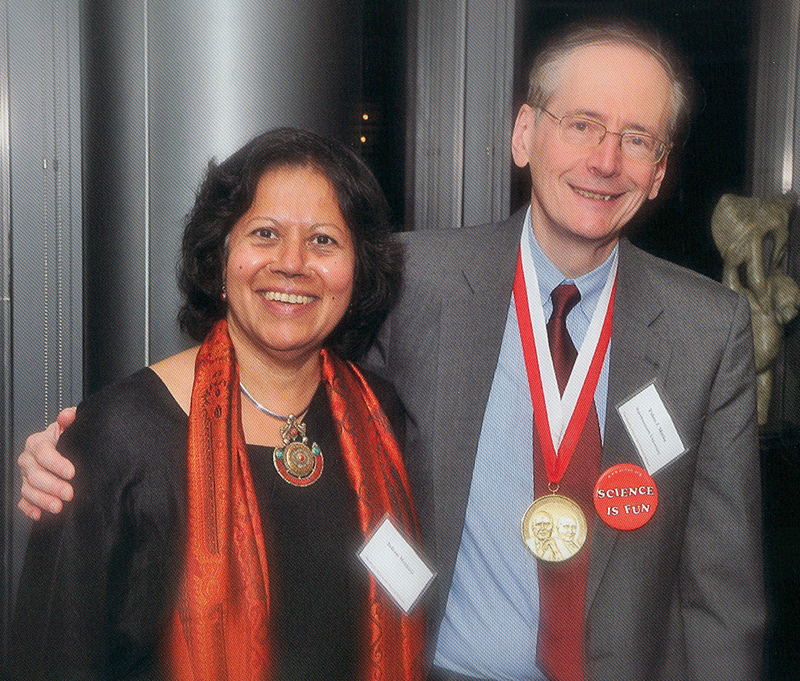 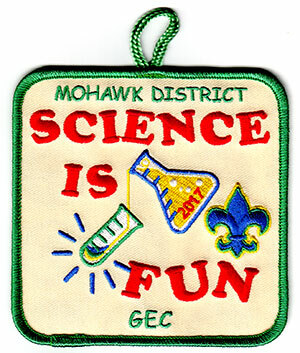 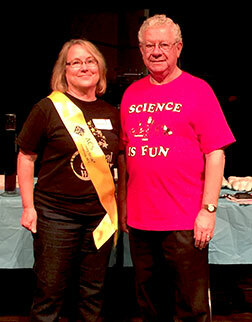 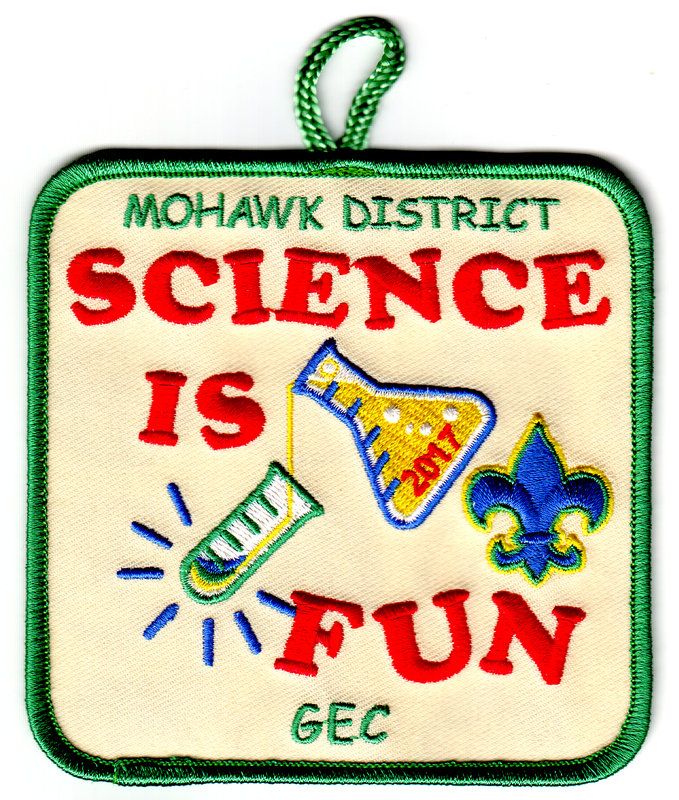 Marks wearing his Science is Fun button, with Indrani Mukharji. 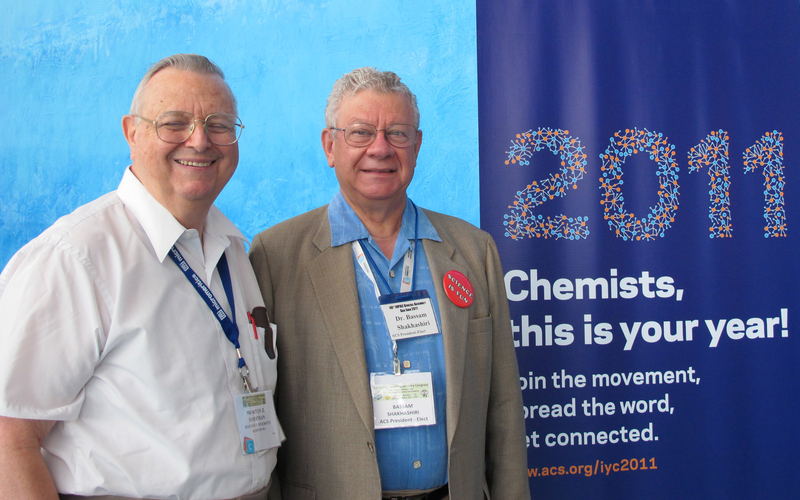 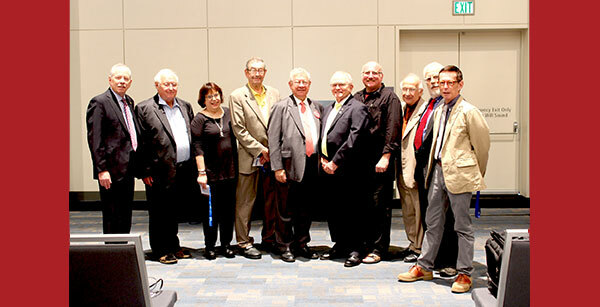 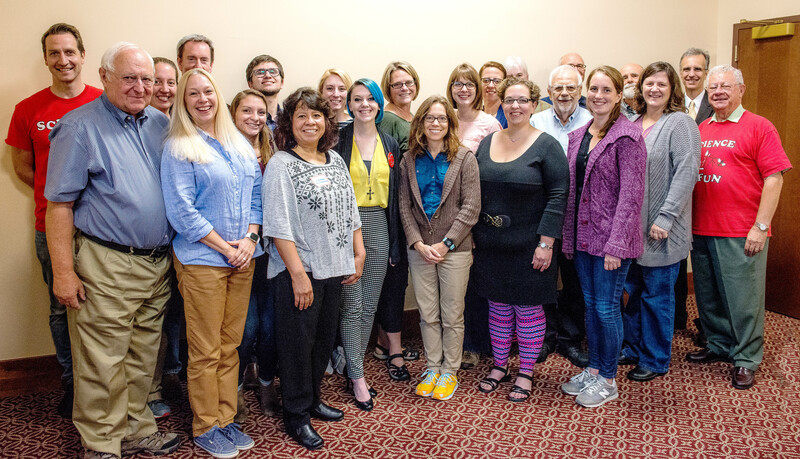 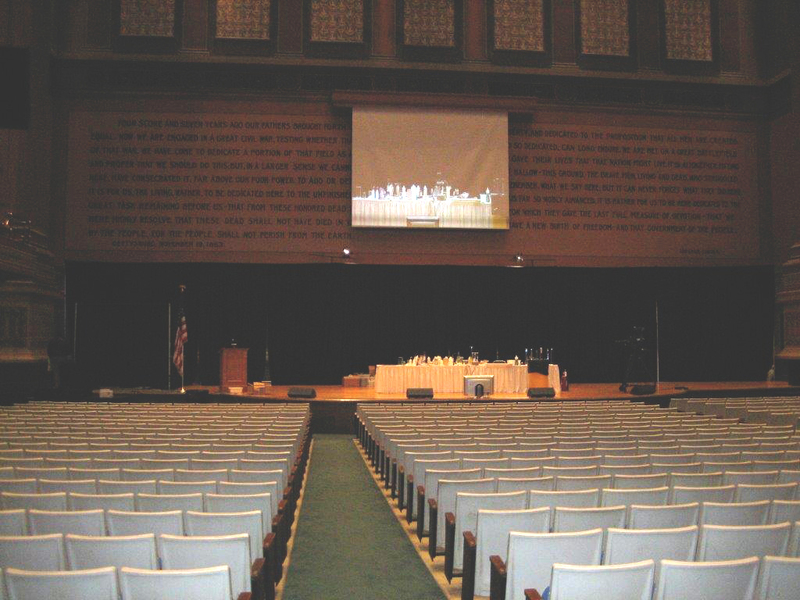 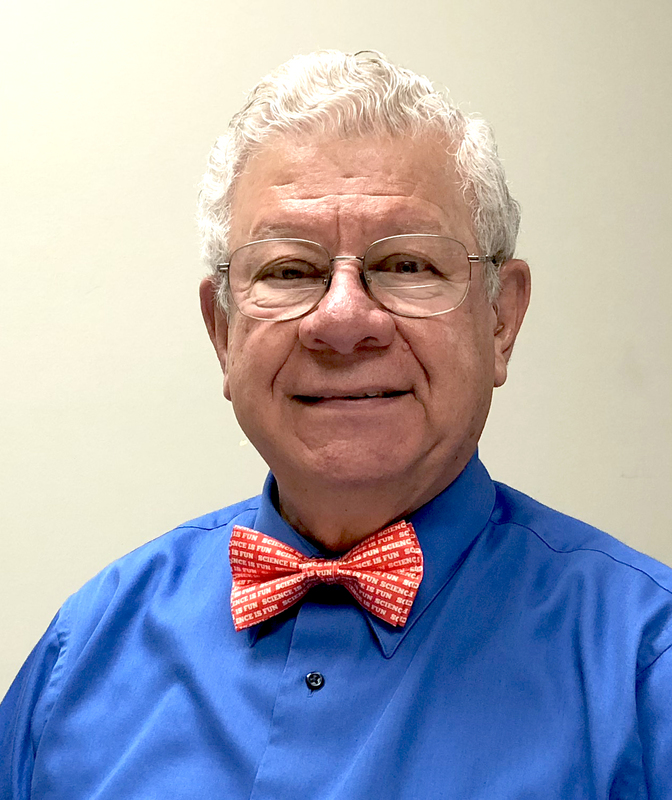 Board of Directors Open Meeting, 12:00-1:00 p.m.
Senior Chemists Breakfast, 7:30-9:30 a.m.
ACS Council Meeting, 8:00 a.m.-12:00 p.m.
At the IUPAC Sunday Fiesta. 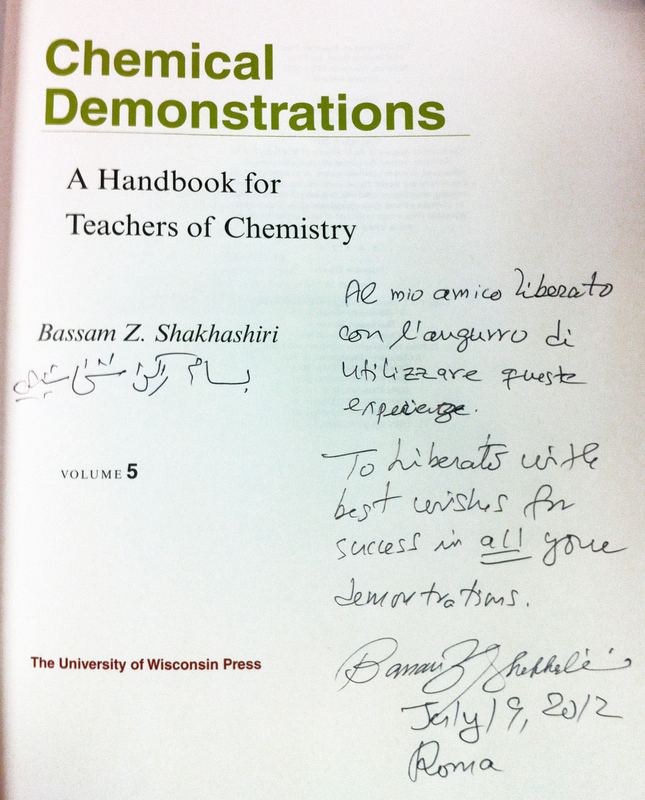 Presenting HRH Princess Chulabhorn Mahidol of Thailand with a copy of Chemical Demonstrations Volume 5. 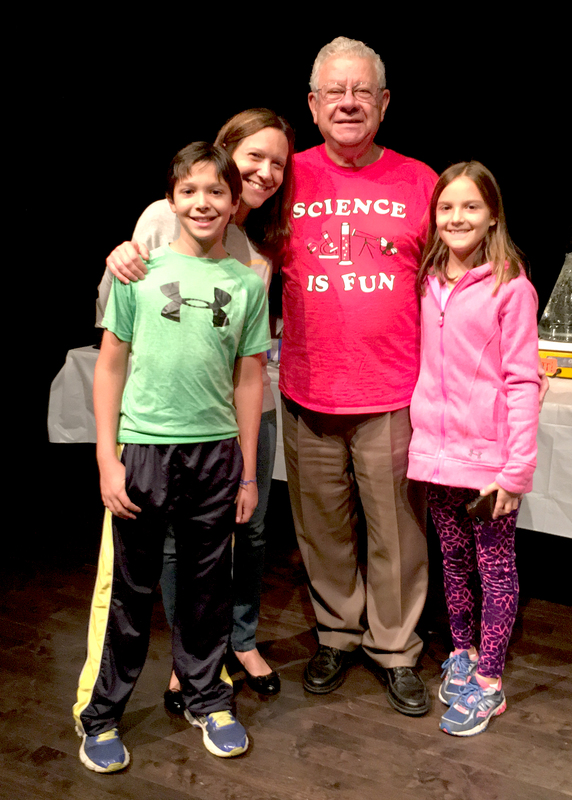 Marti Maguire-Rosemas (left) and Elnore Grow (right) pose with Bassam after the High School Chemistry Awards at the Colorado School of Mines. 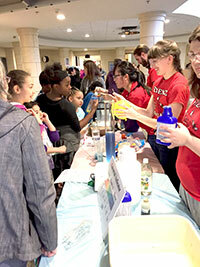 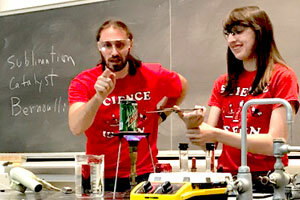 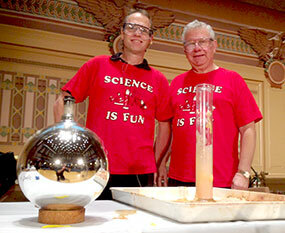 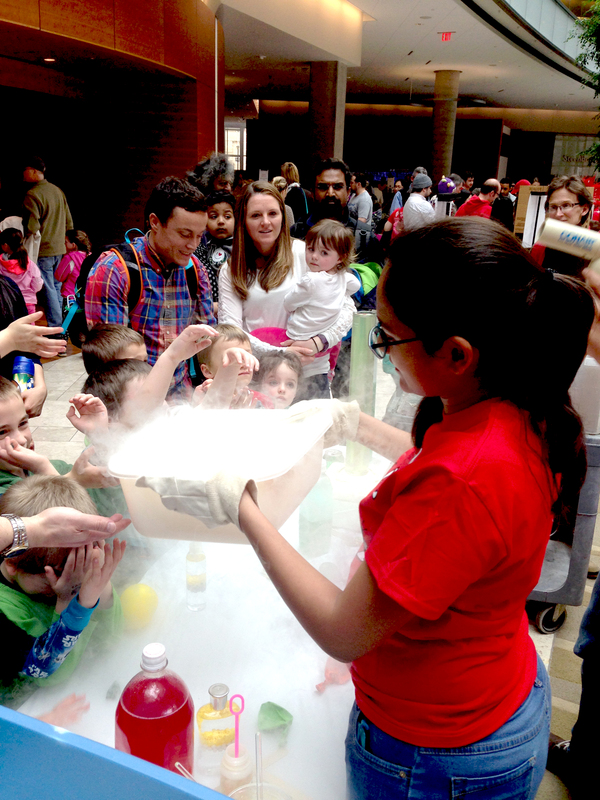 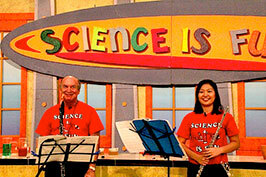 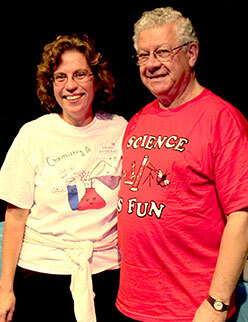 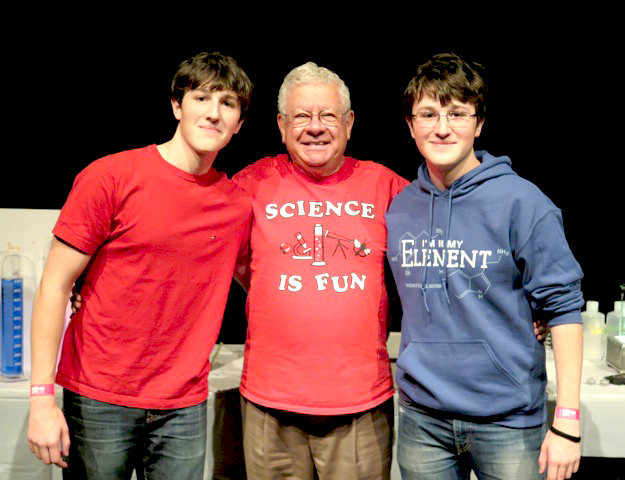 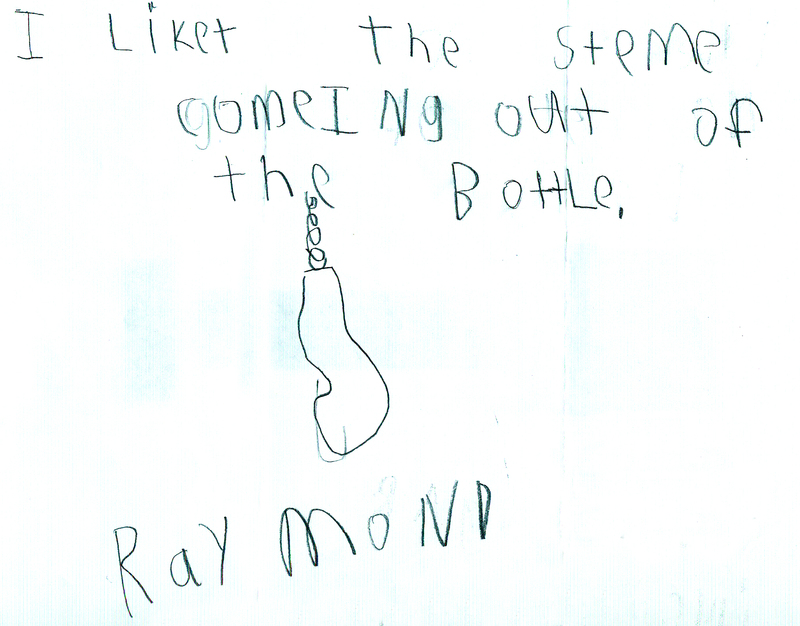 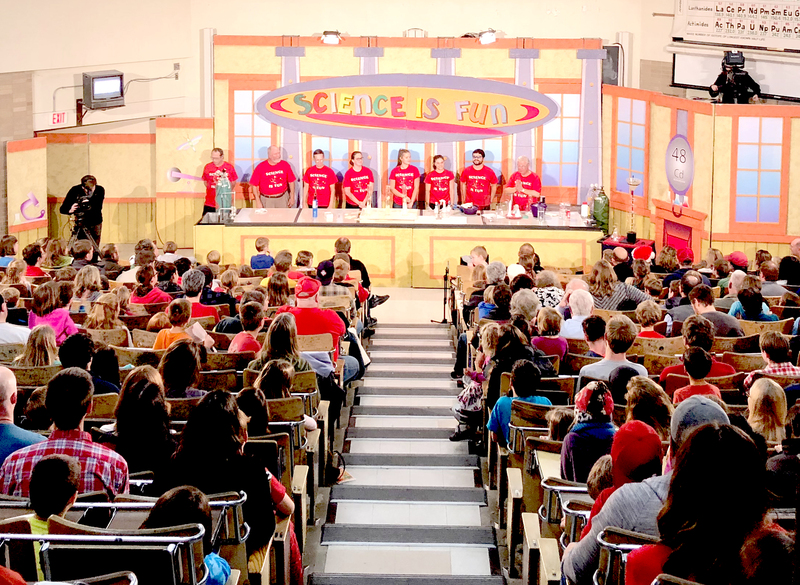 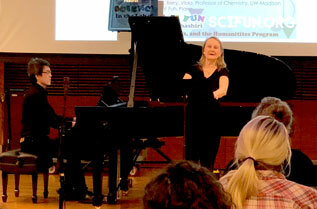 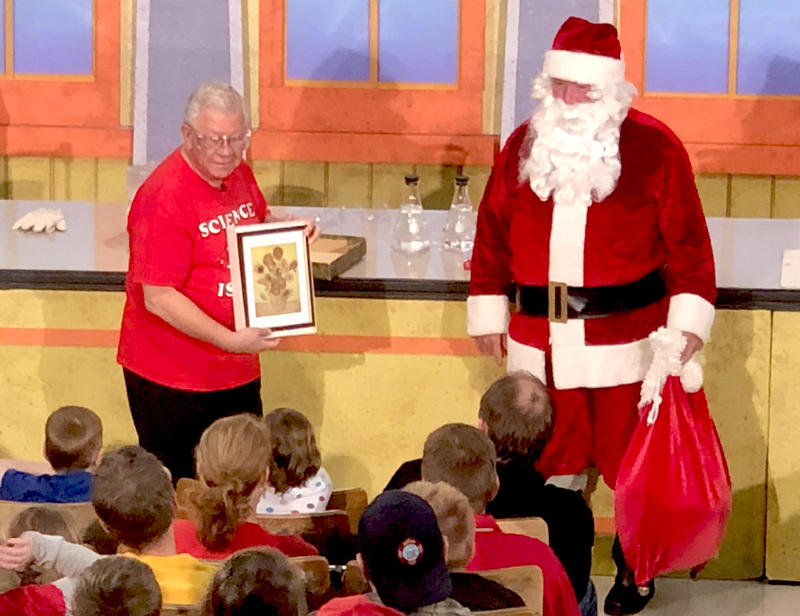 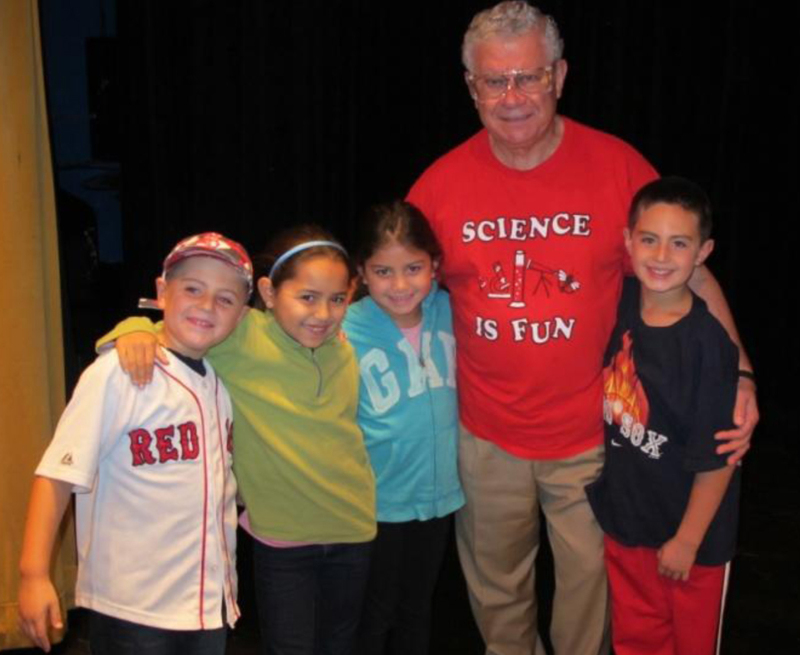 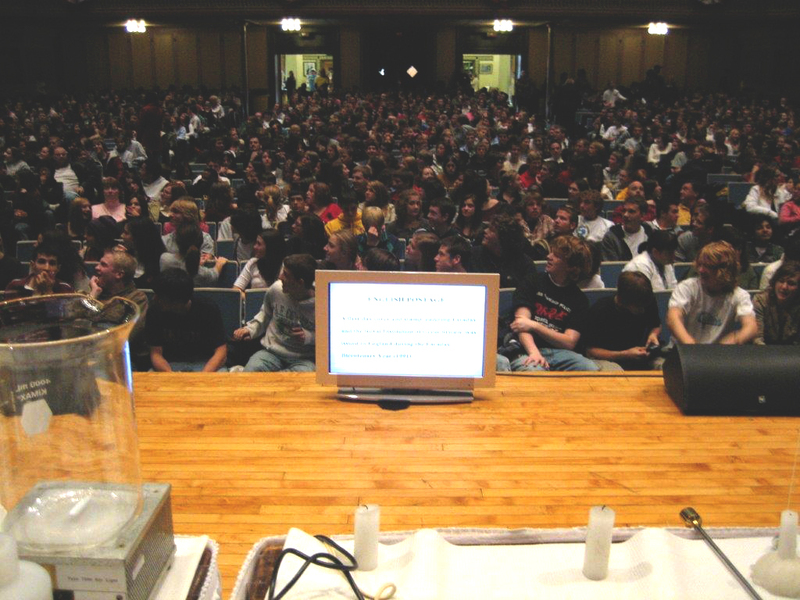 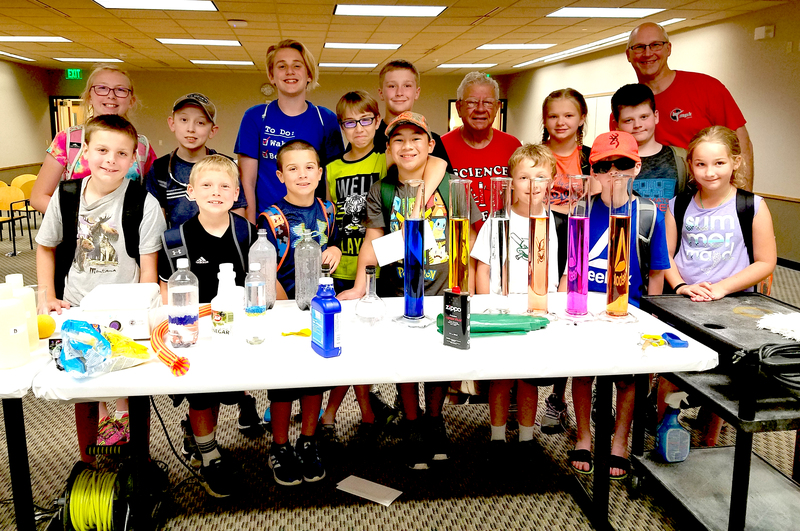 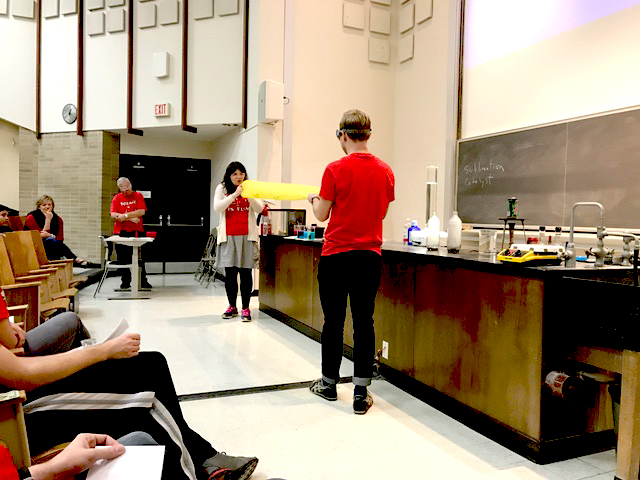 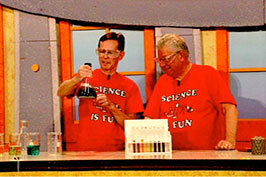 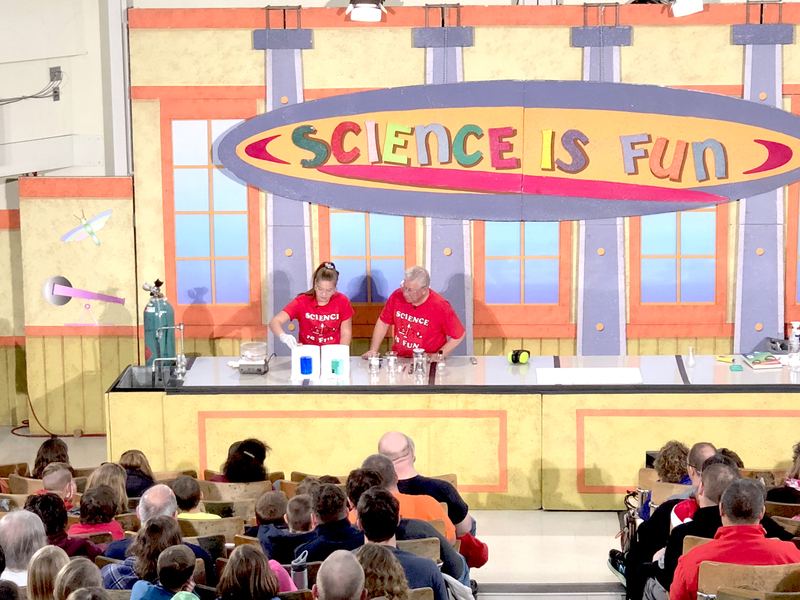 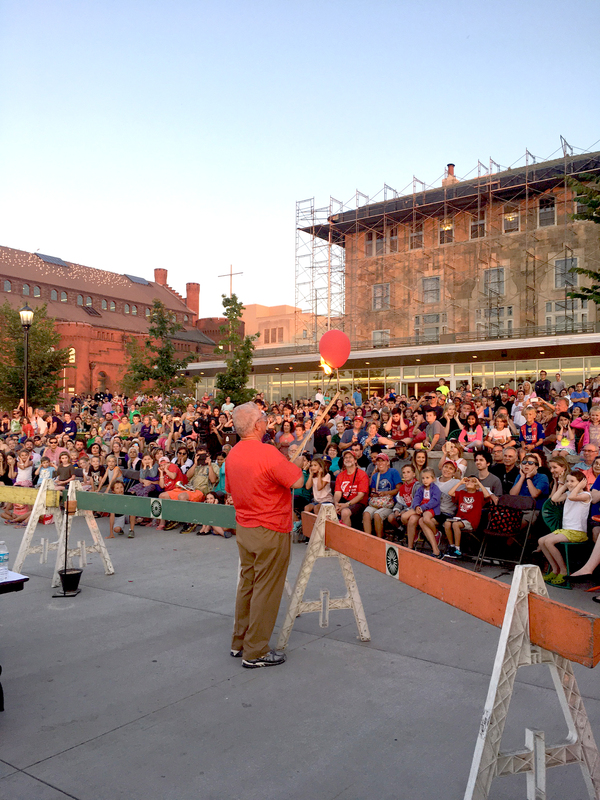 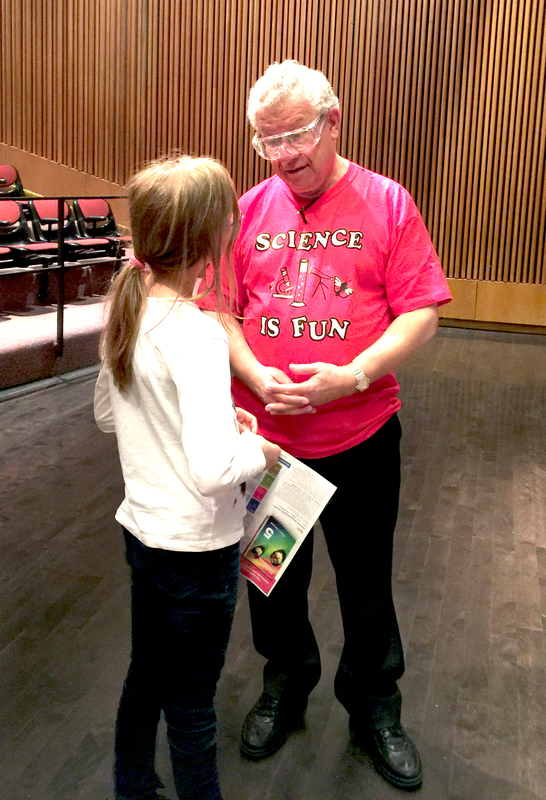 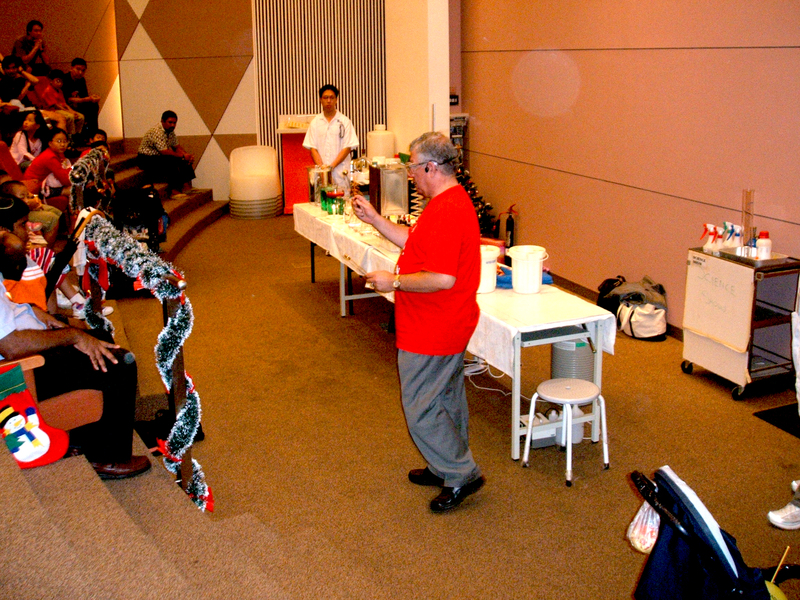 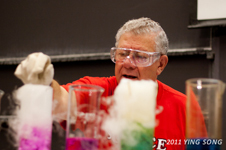 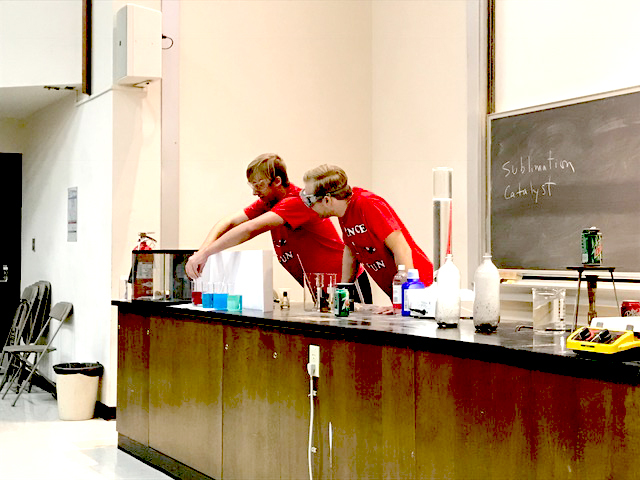 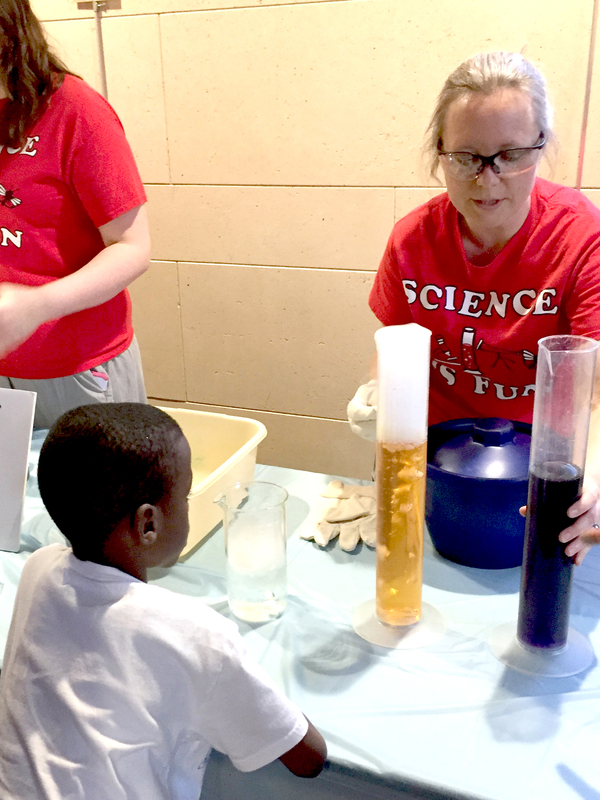 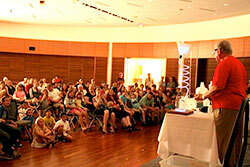 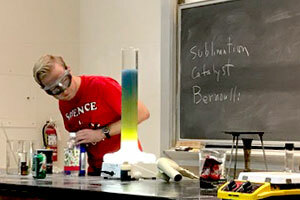 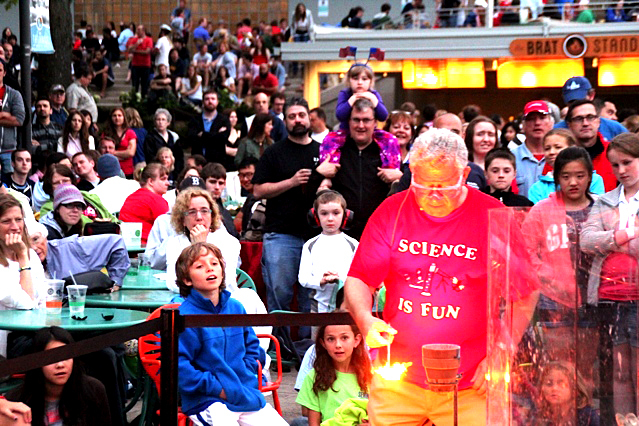 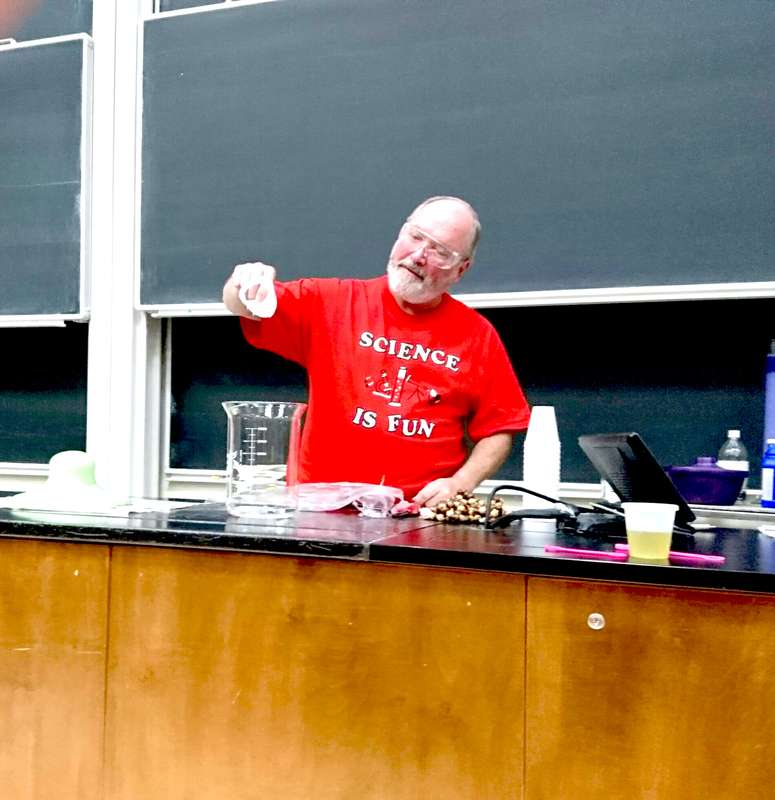 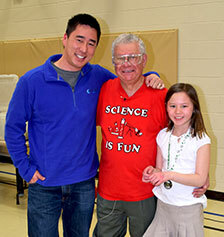 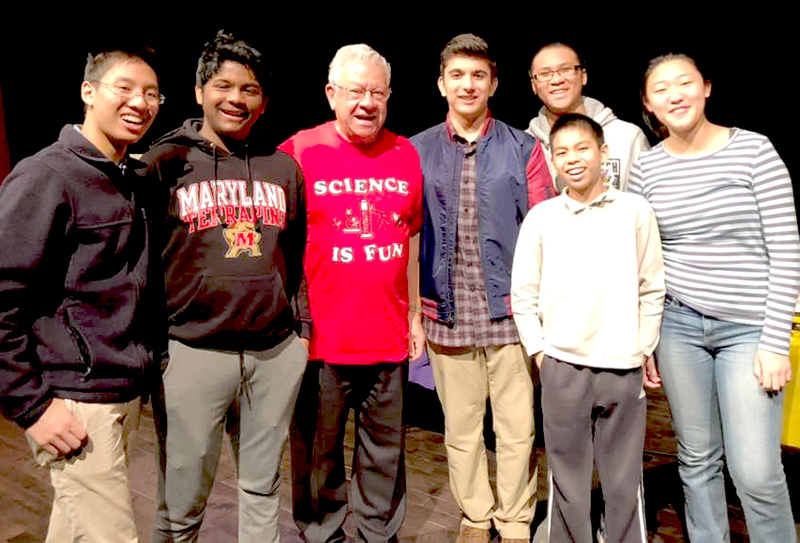 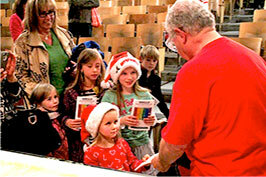 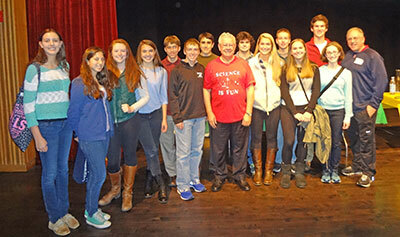 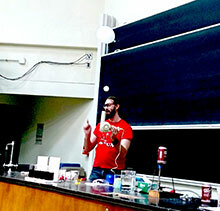 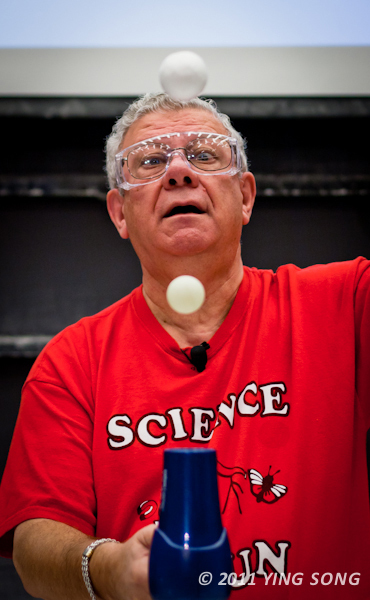 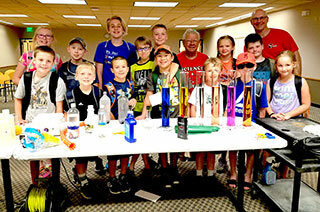 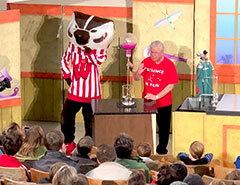 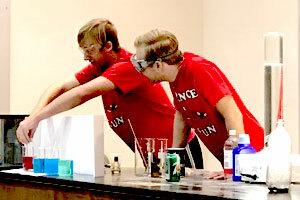 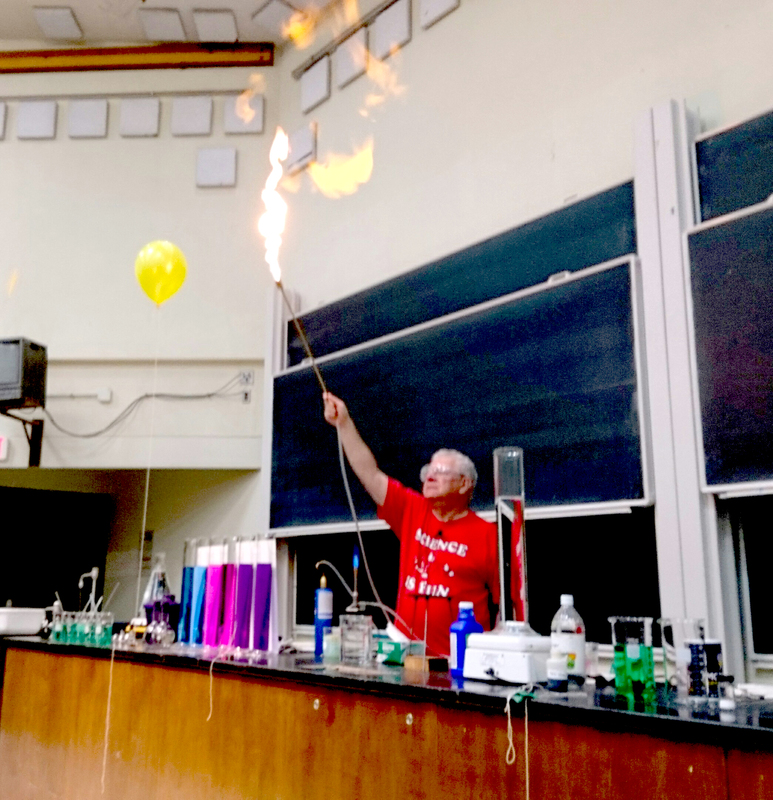 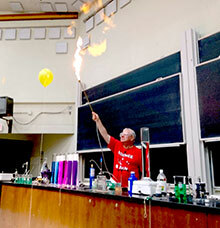 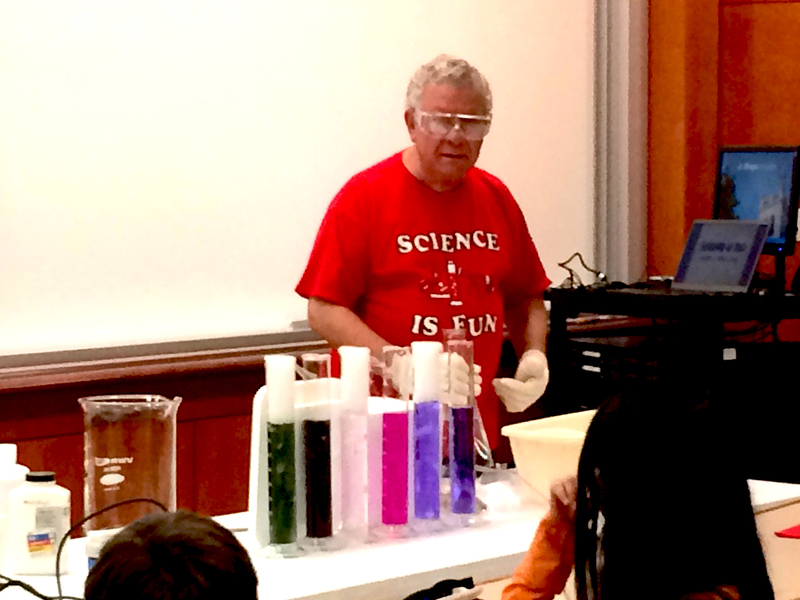 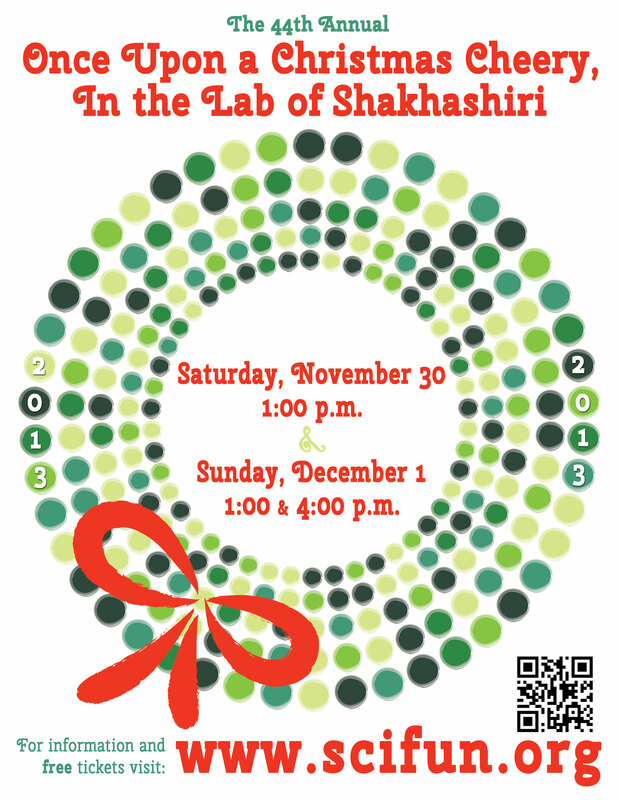 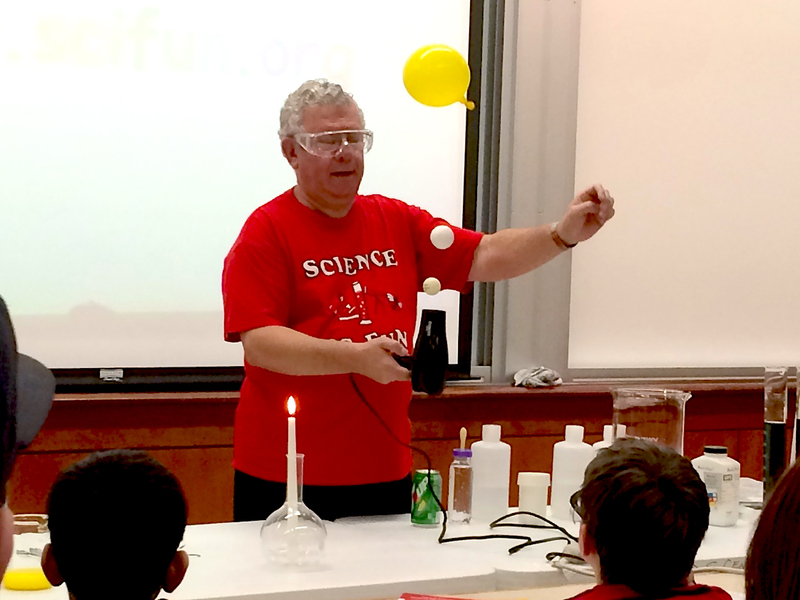 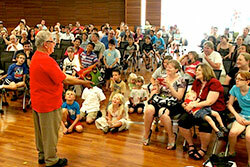 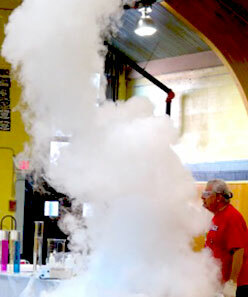 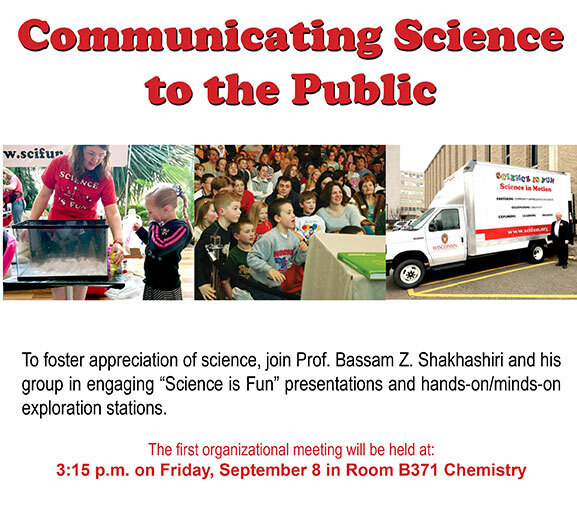 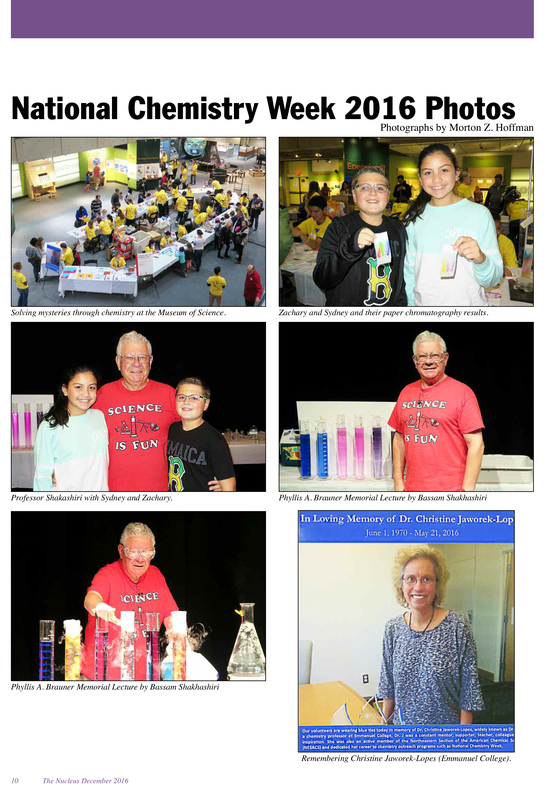 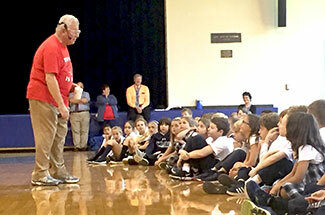 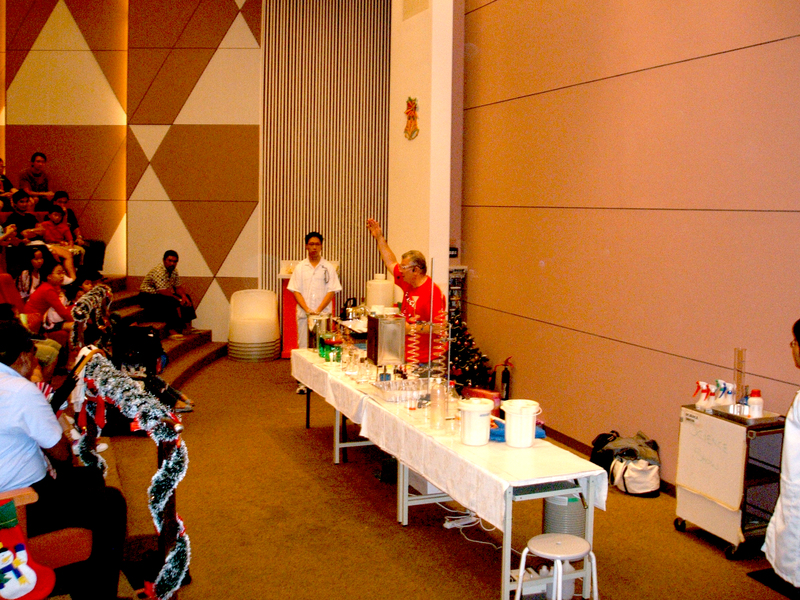 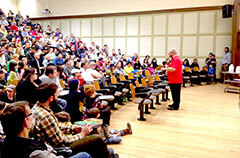 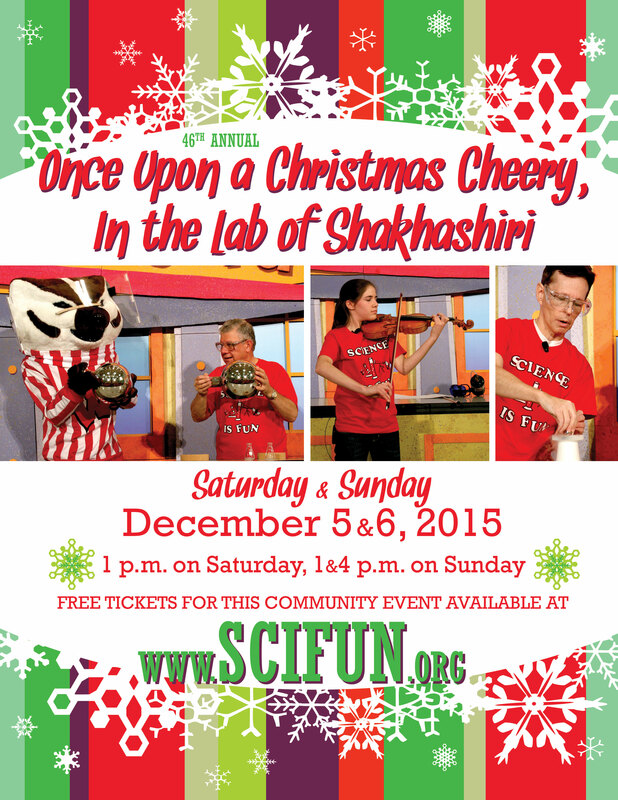 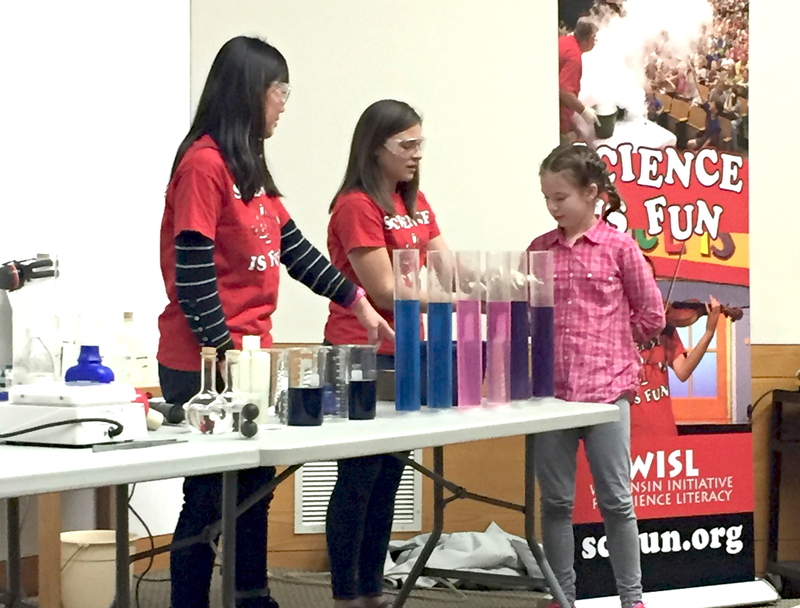 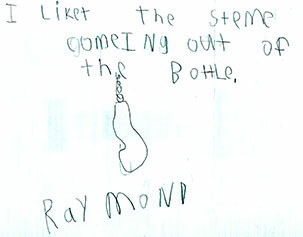 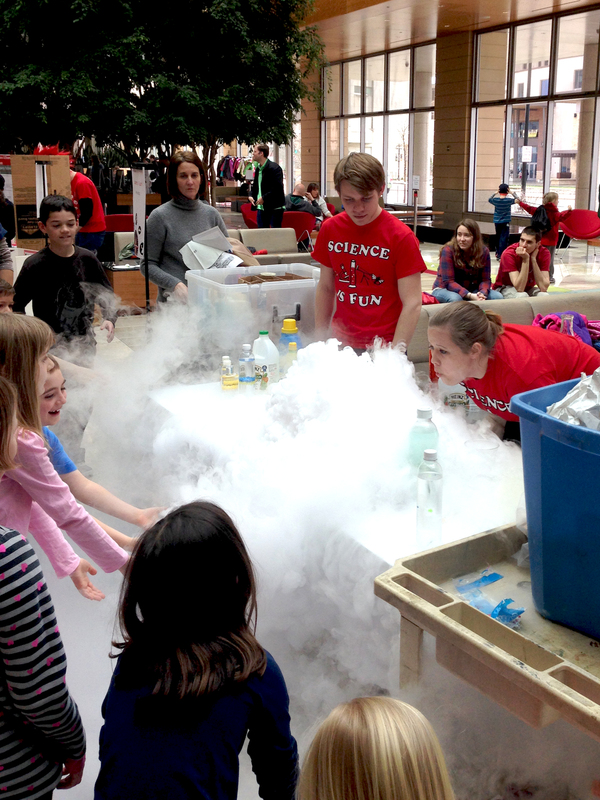 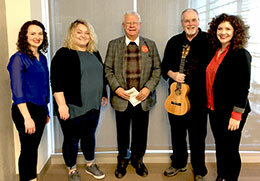 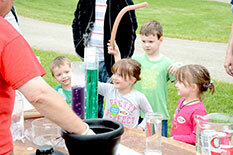 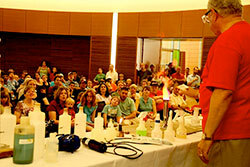 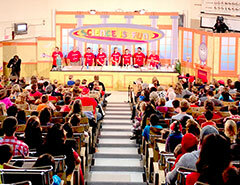 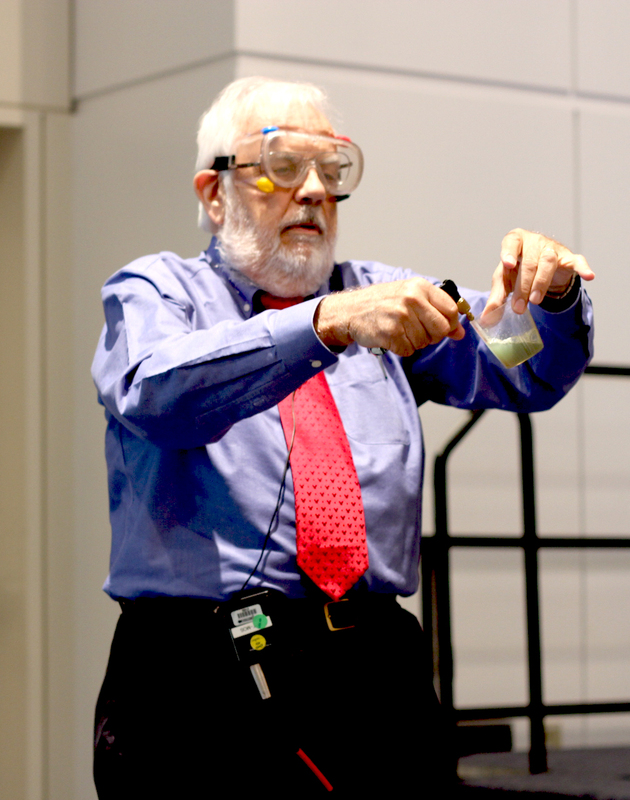 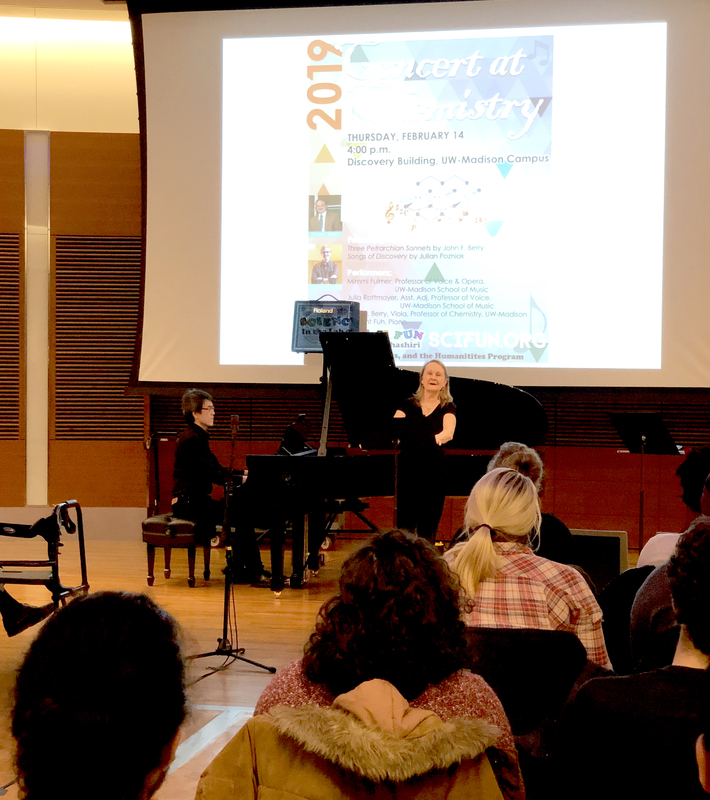 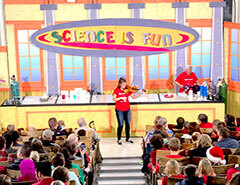 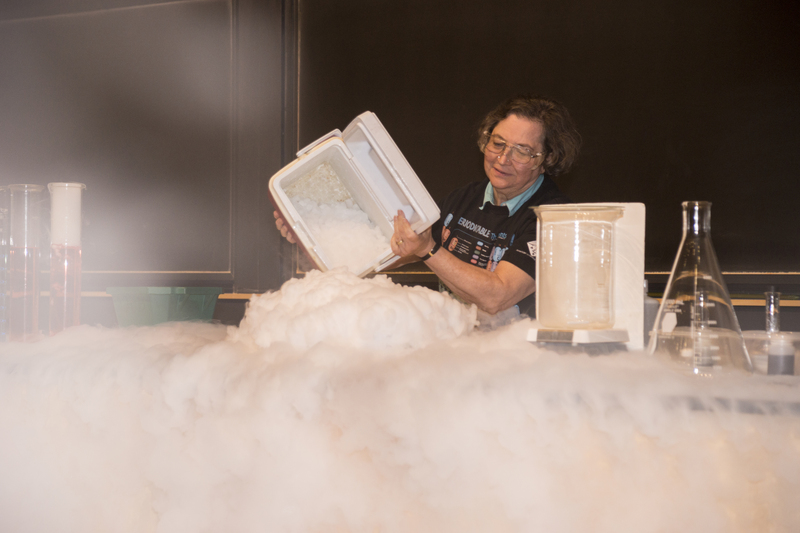 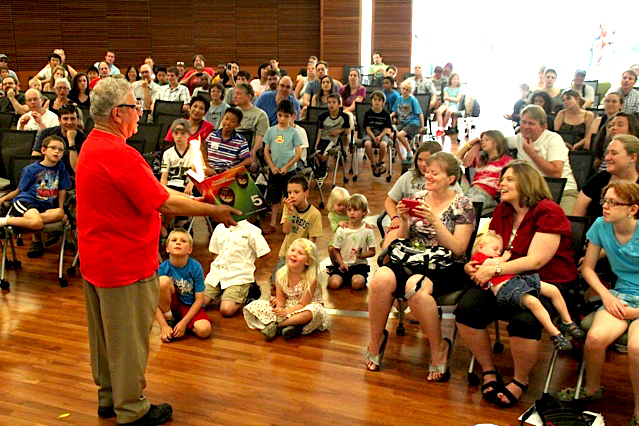 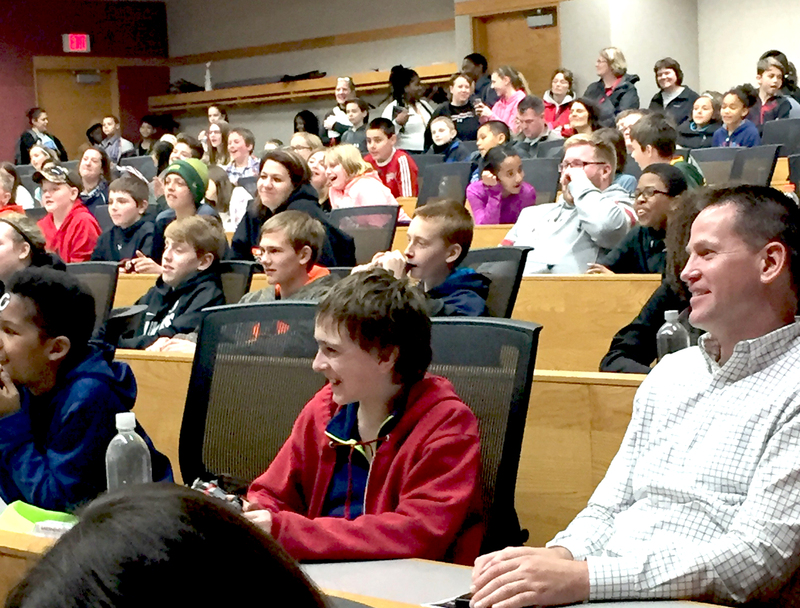 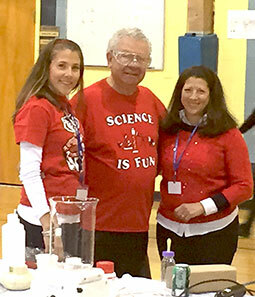 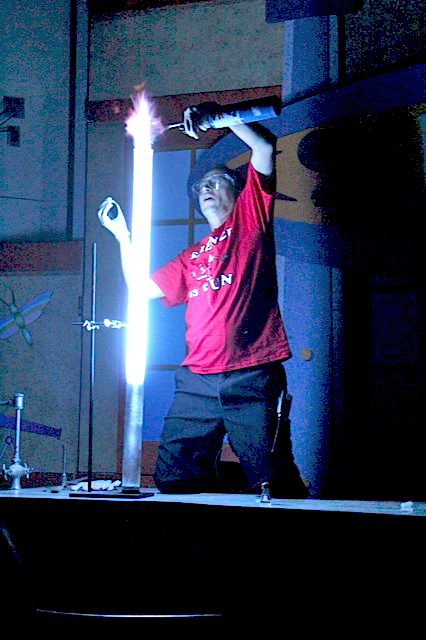 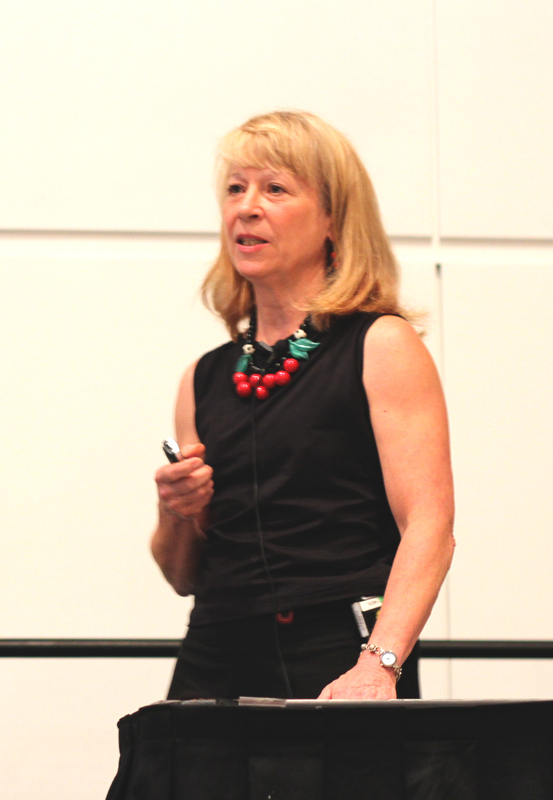 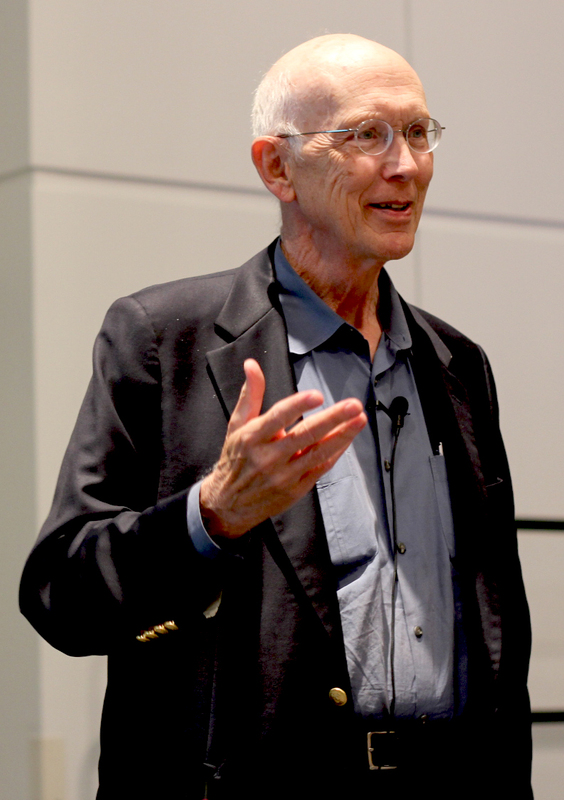 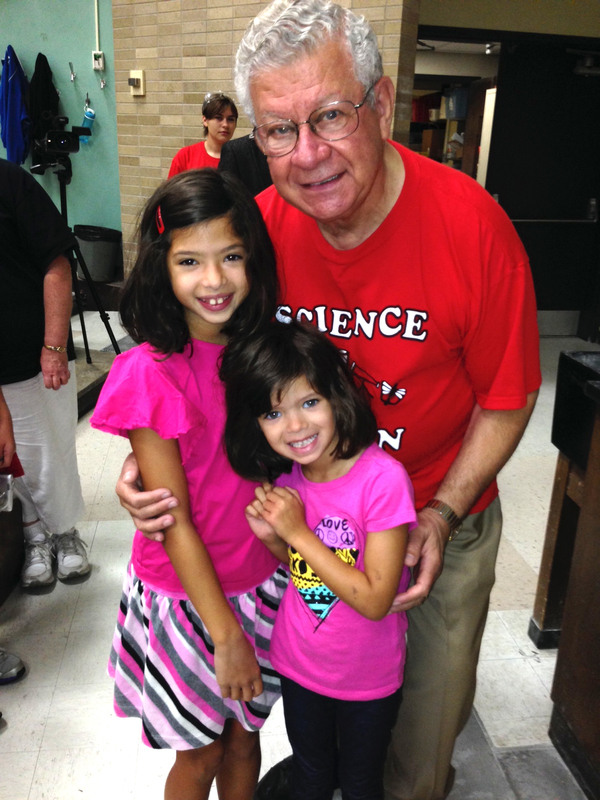 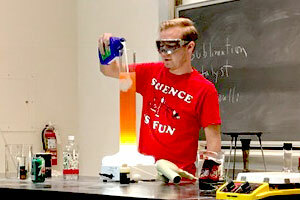 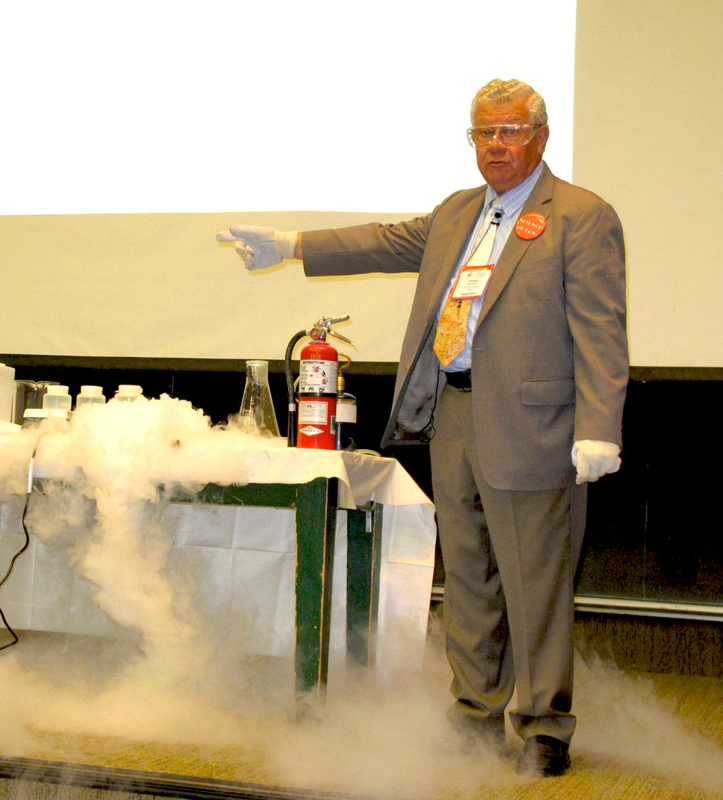 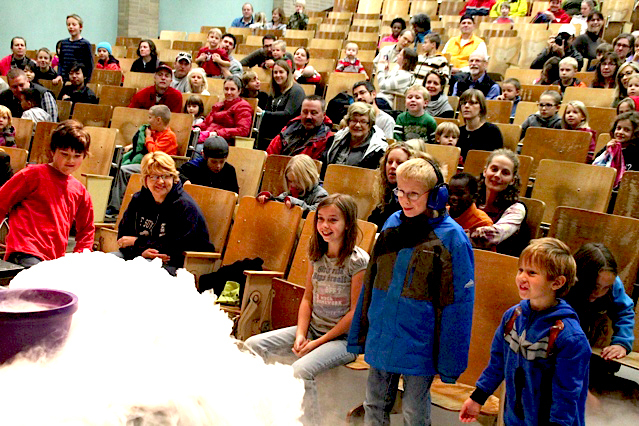 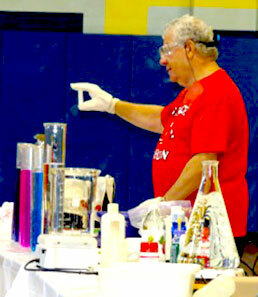 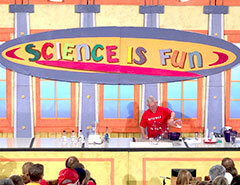 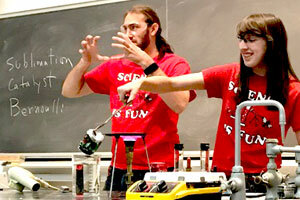 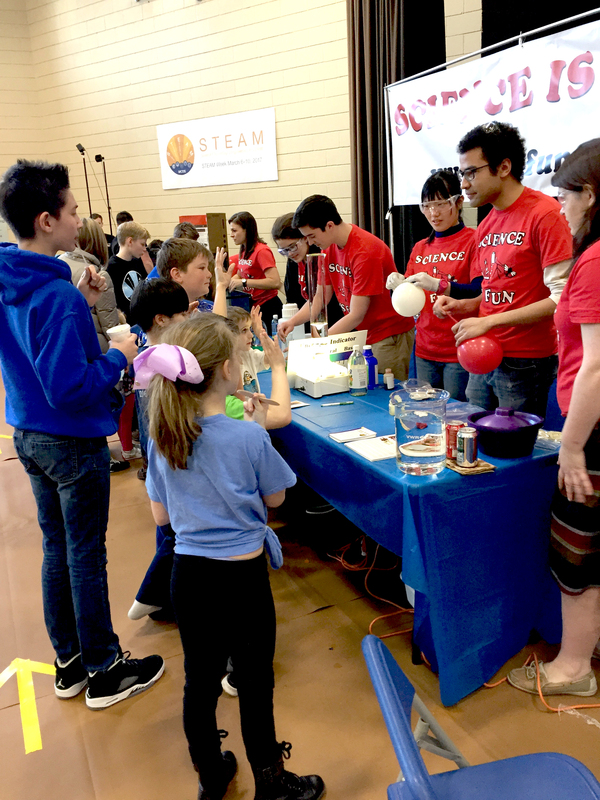 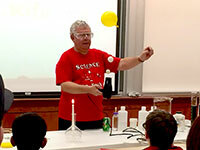 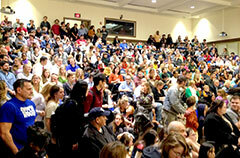 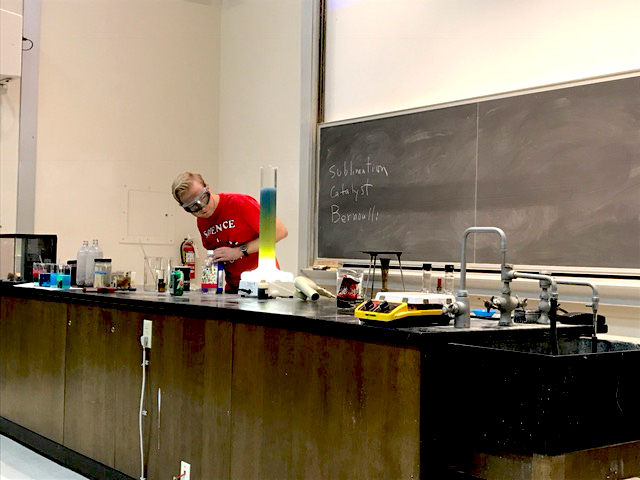 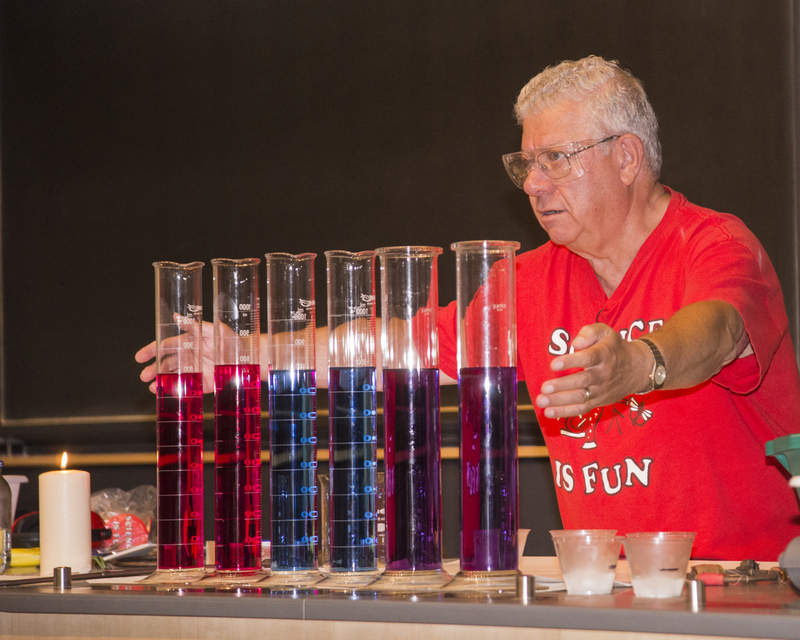 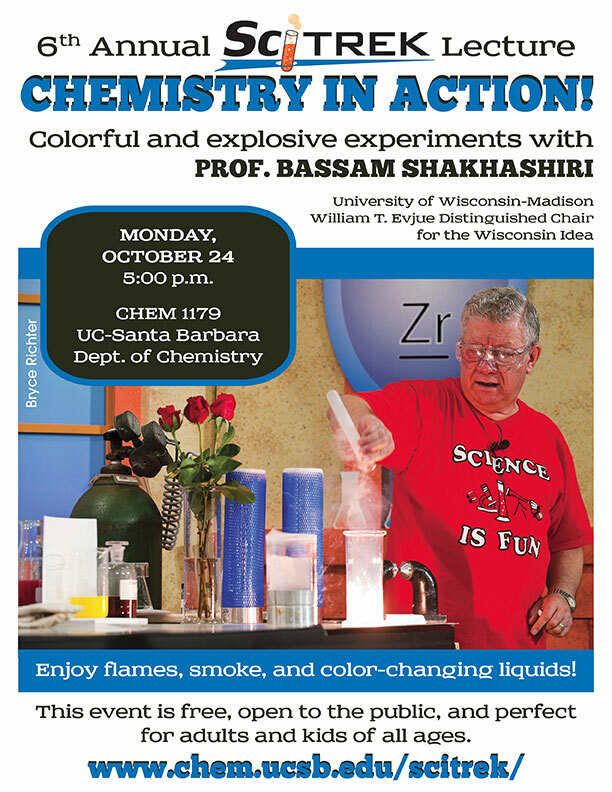 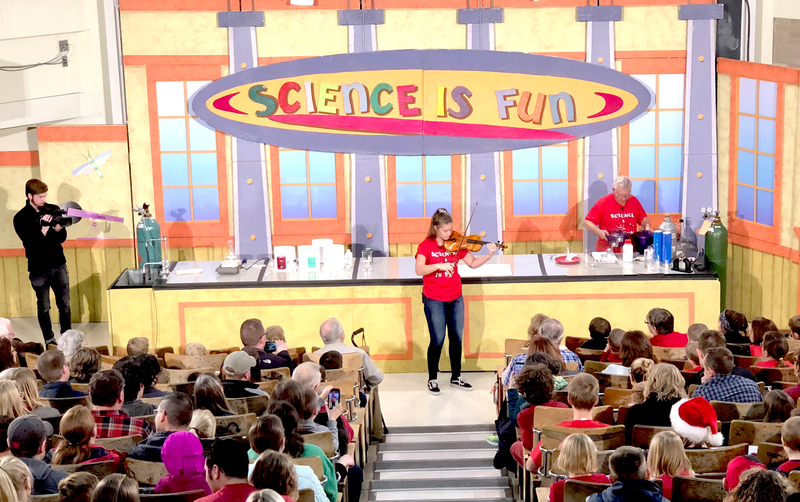 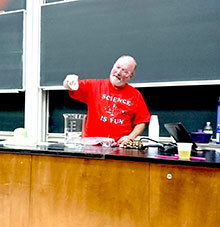 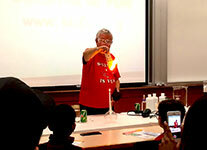 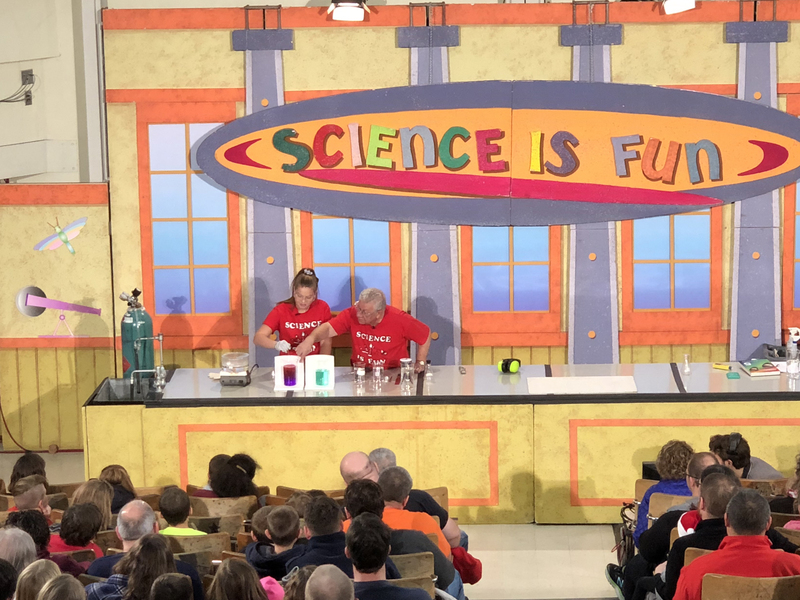 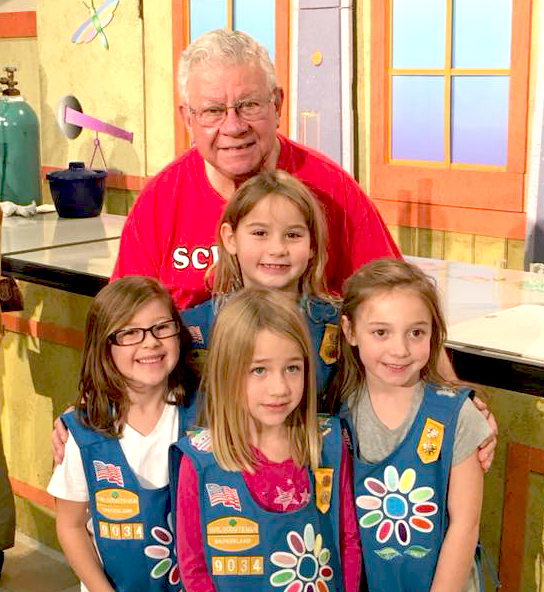 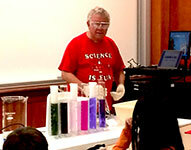 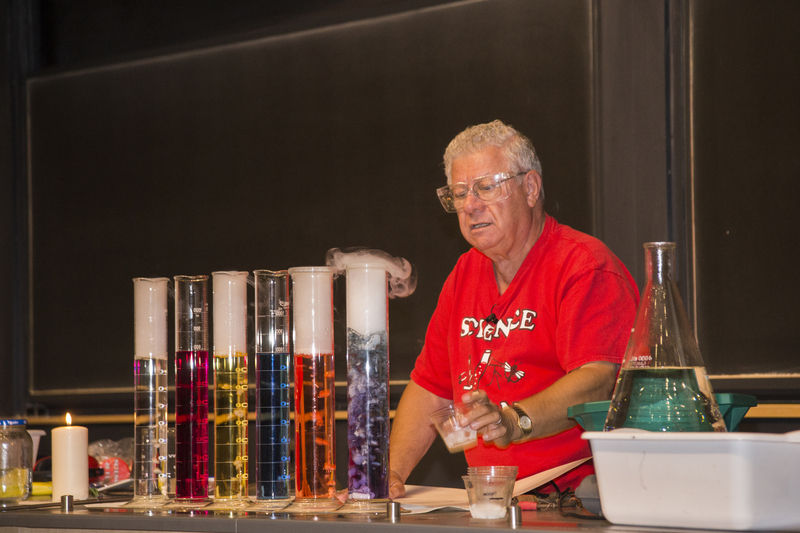 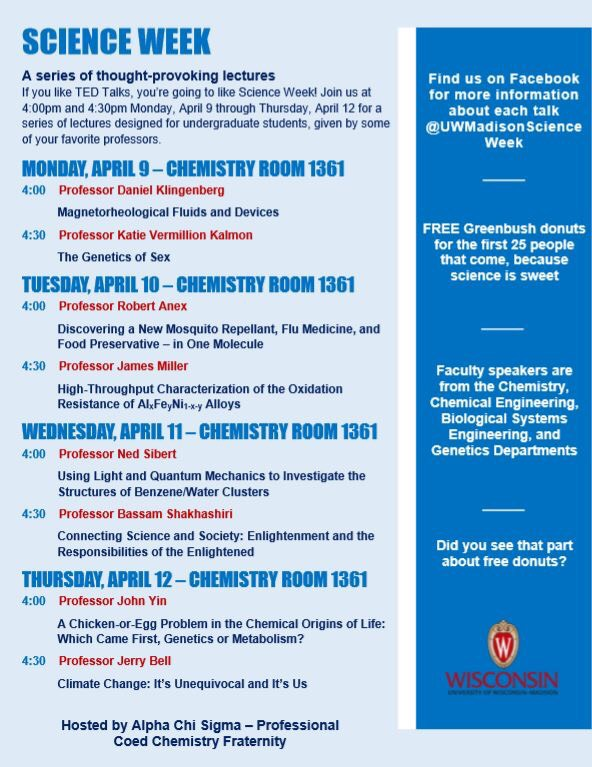 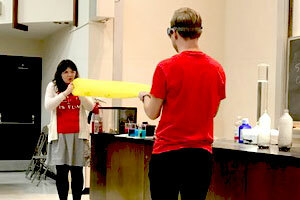 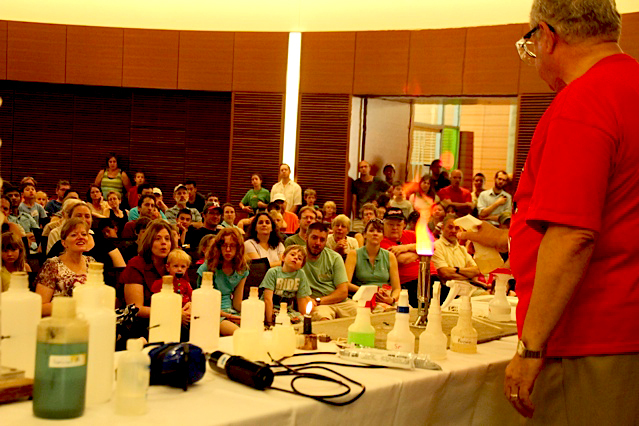 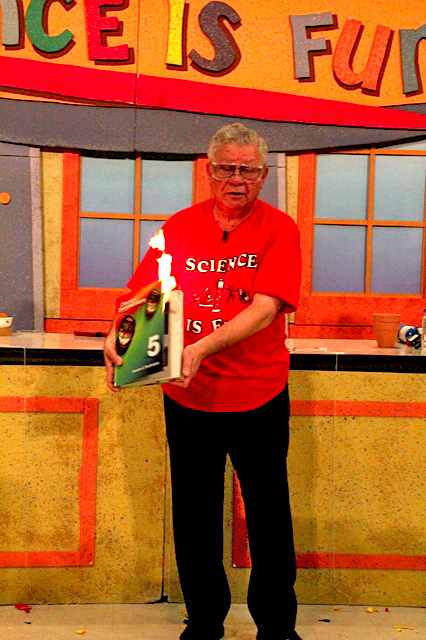 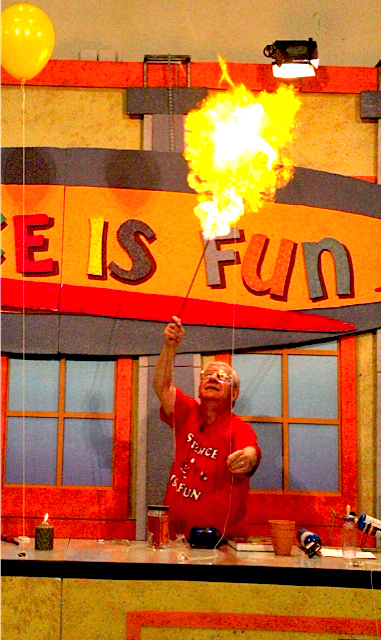 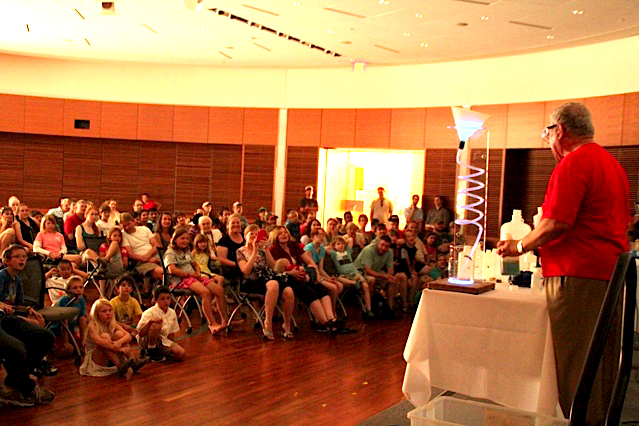 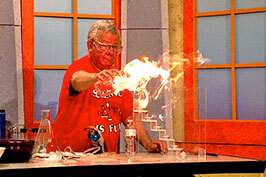 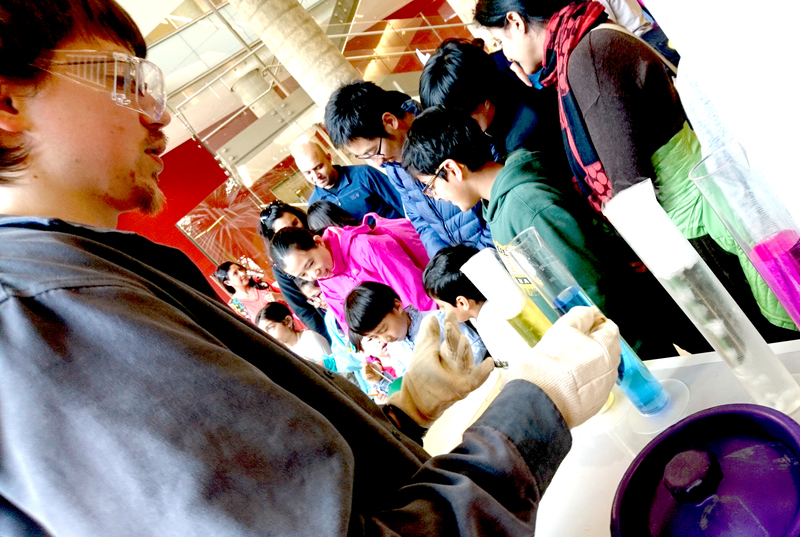 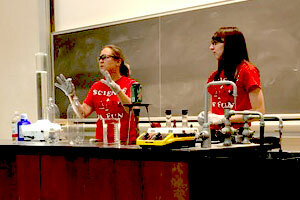 Fisher Lecture Series: The Joy of Learning - Science is Fun! 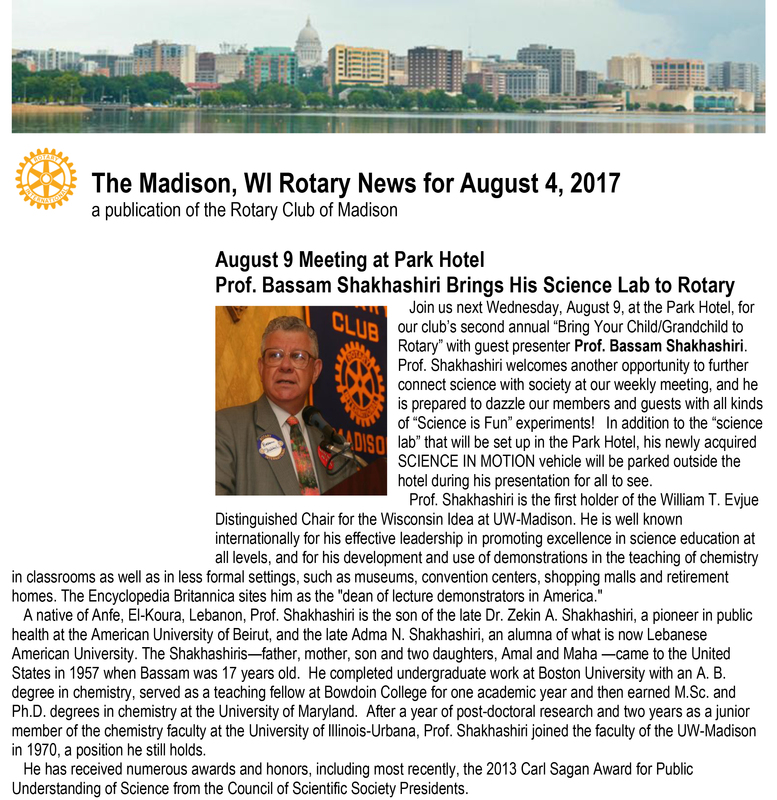 "On advancing science, technology and human rights"
Prof. Shakhashiri toured the country, speaking and presenting at various venues. Poster Session begins at 7:00 p.m.
Sci-Mix Session begins at 8:00 p.m.
"Communicating chemistry in the classroom and to the general public"
"Color, light, vision and perception in chemistry"
"Exhortations for good teaching and the responsibilities of the learner"
Click here to read an article from The Daily Star newspaper in Lebanon. 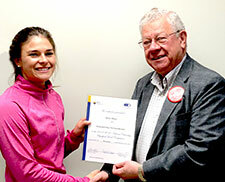 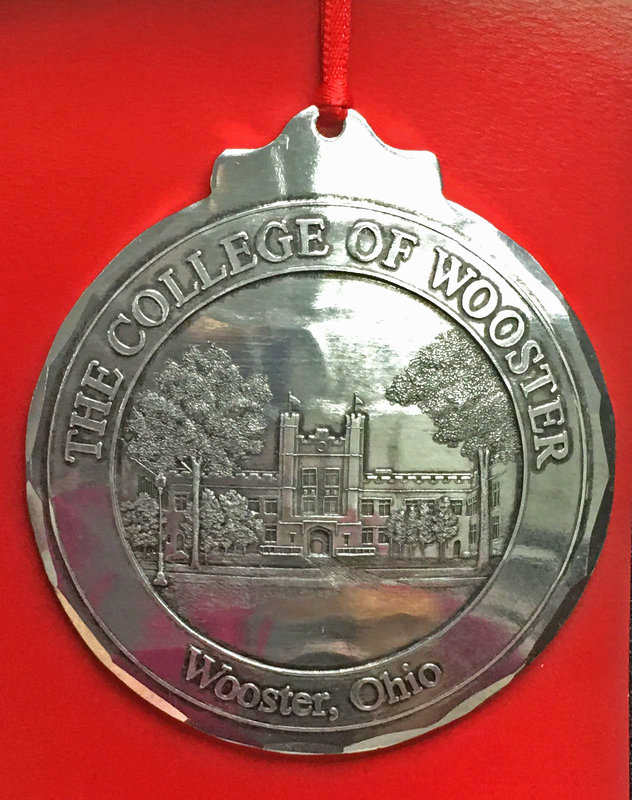 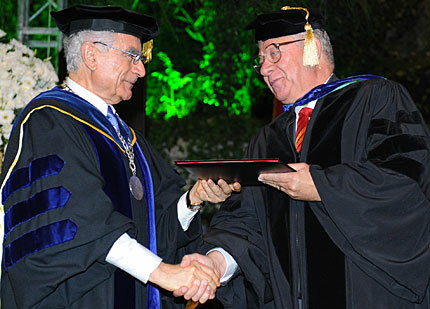 Click here to see the honorary diploma. 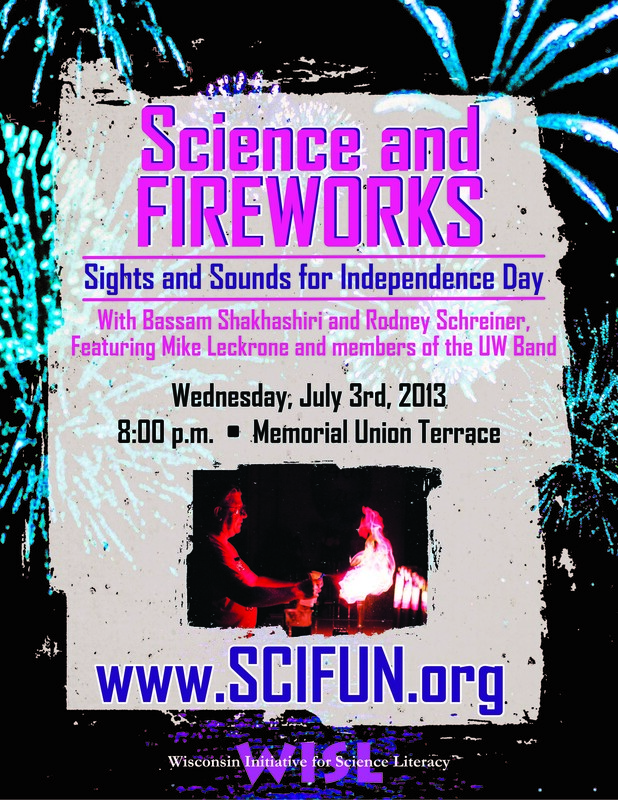 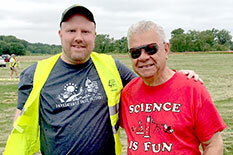 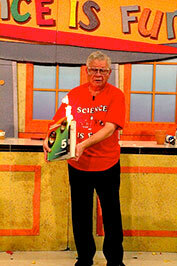 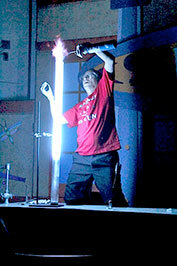 Click here for NPR's video explanation of the science of fireworks, featuring Professor Shakhashiri. 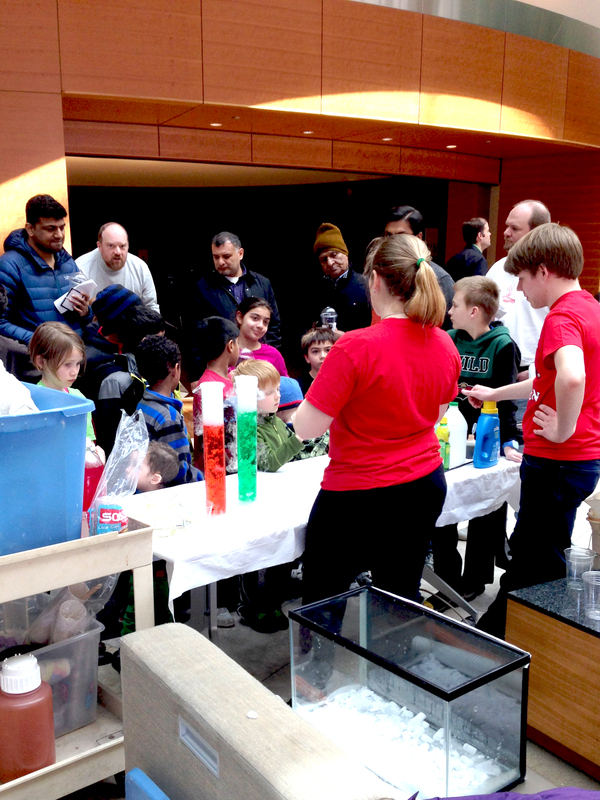 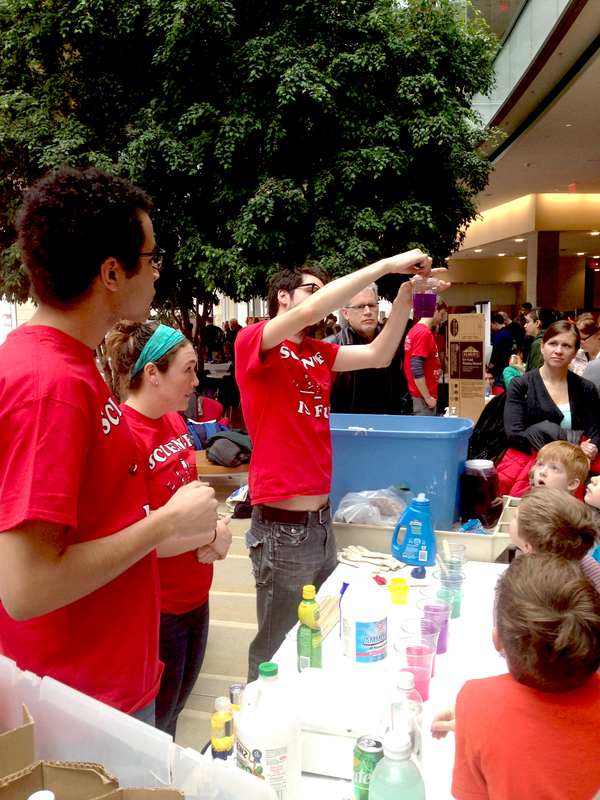 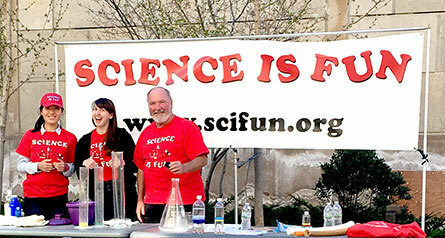 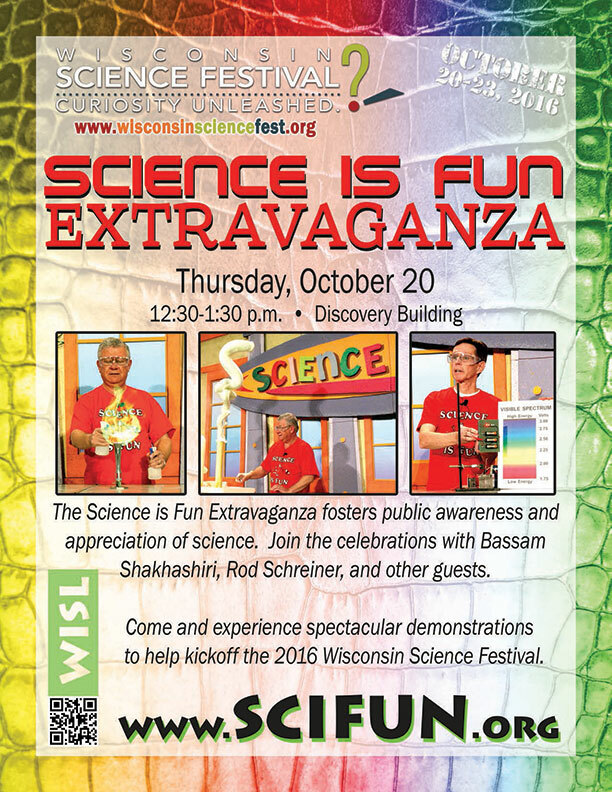 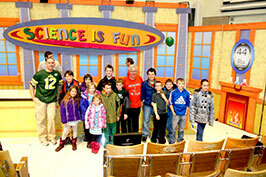 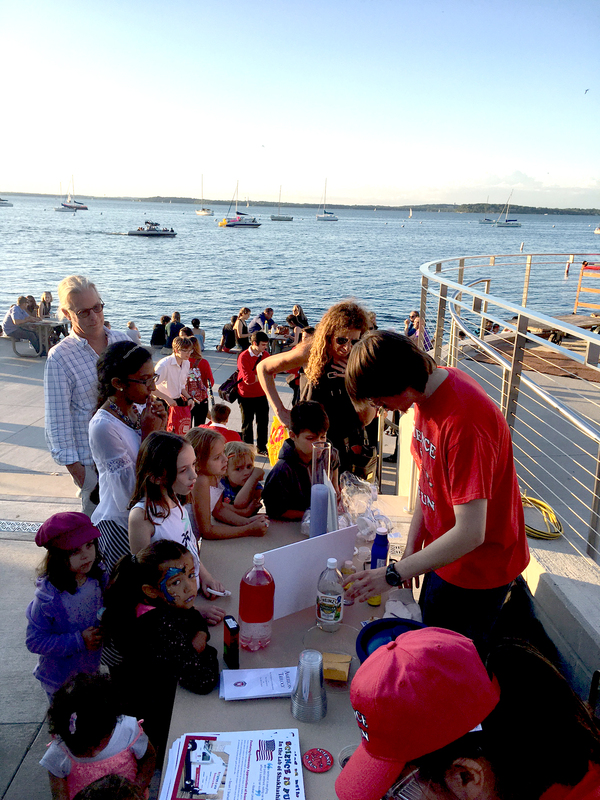 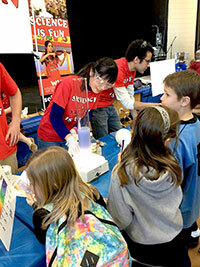 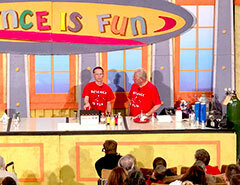 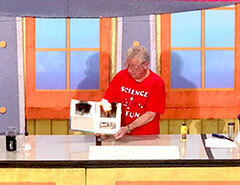 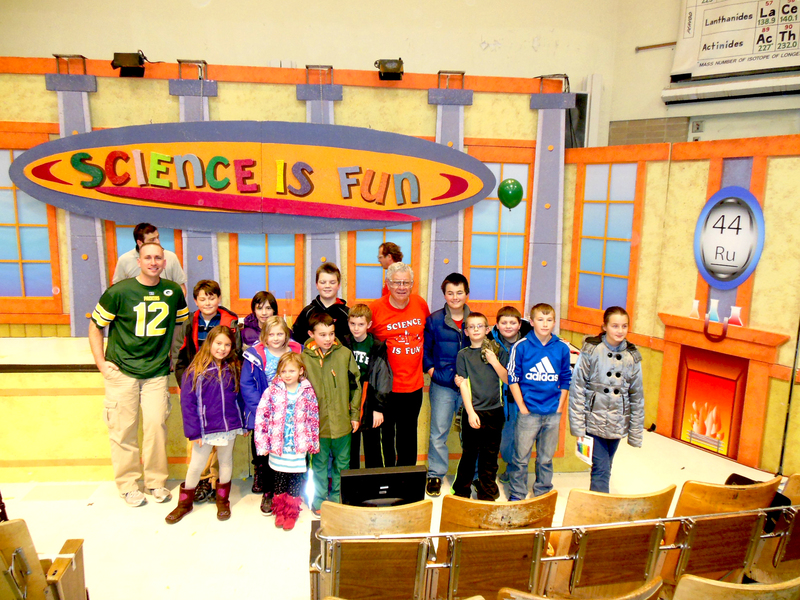 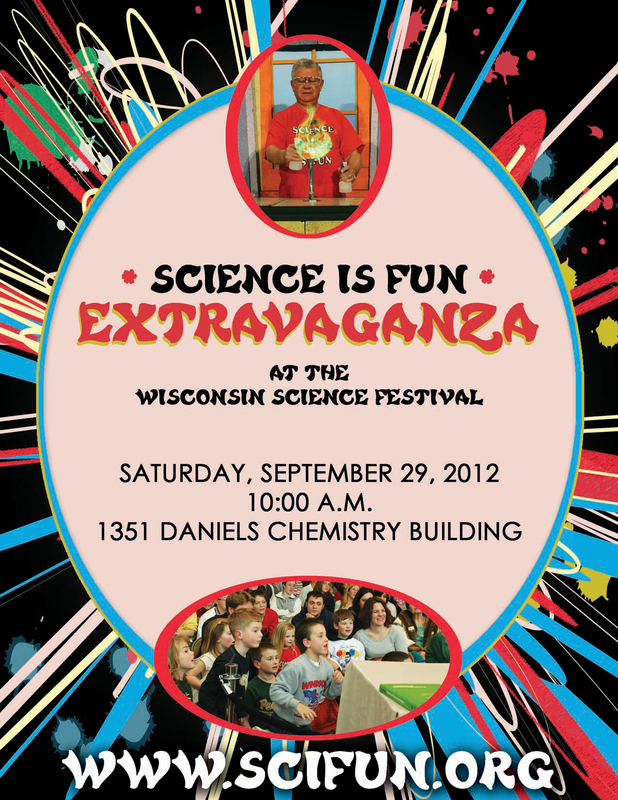 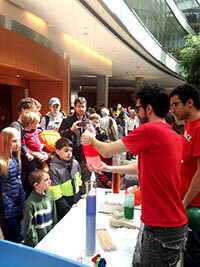 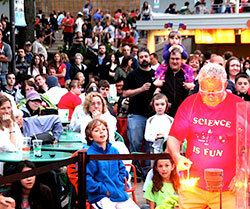 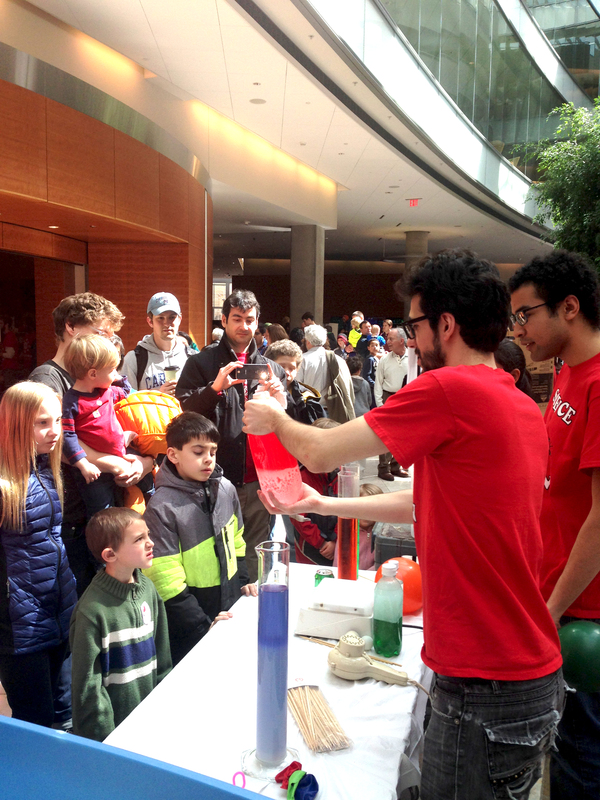 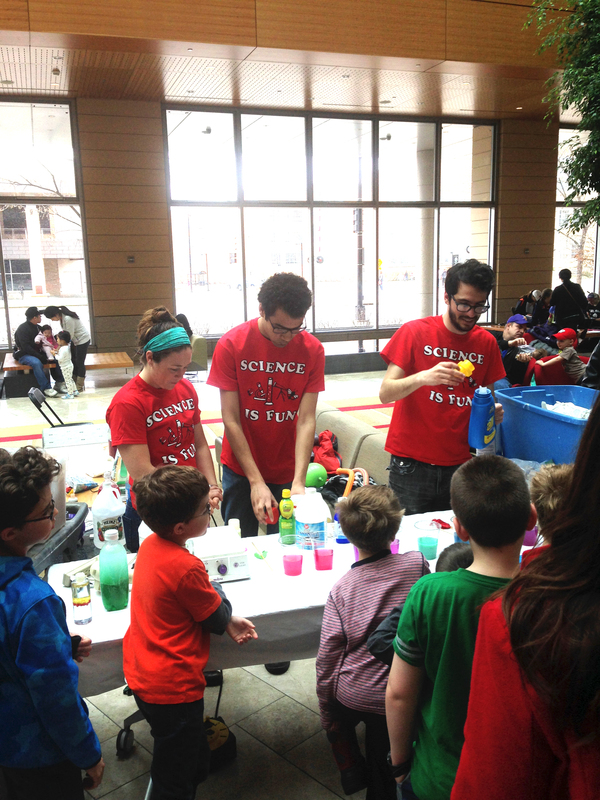 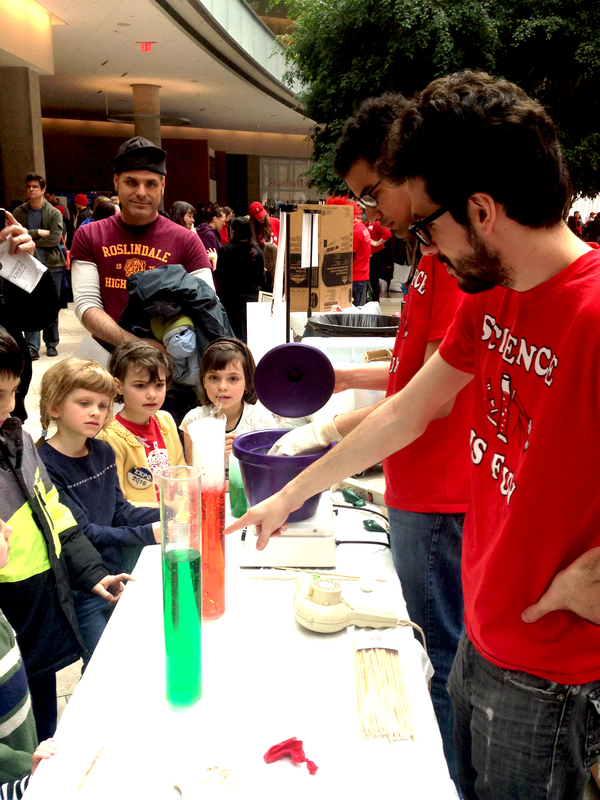 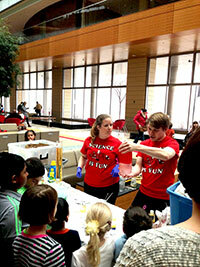 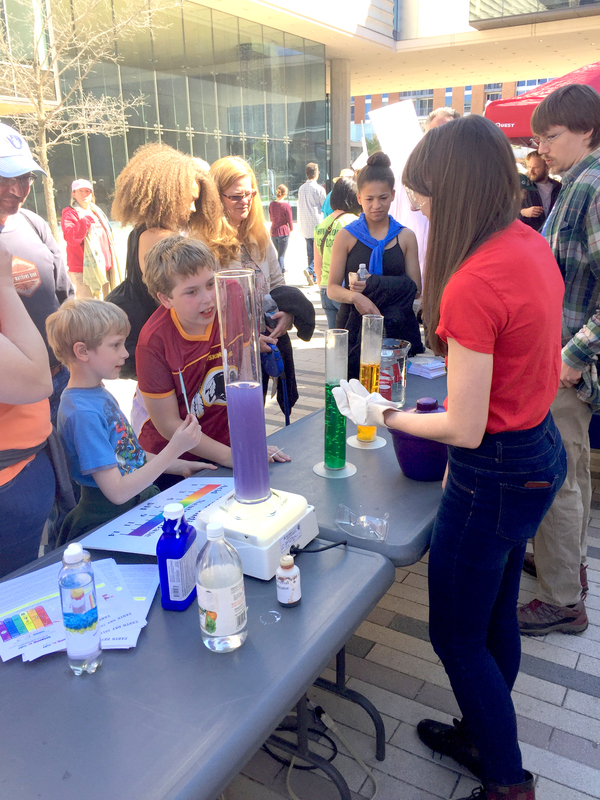 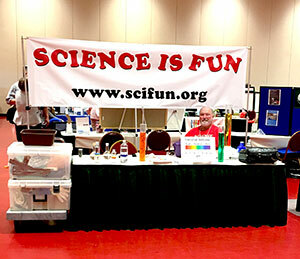 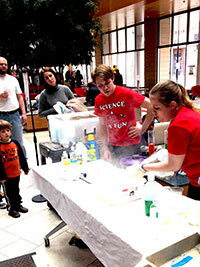 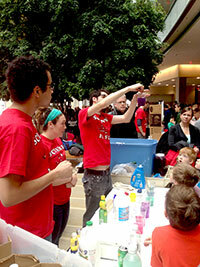 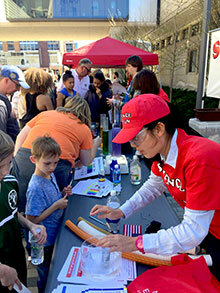 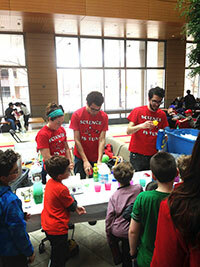 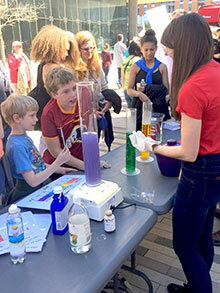 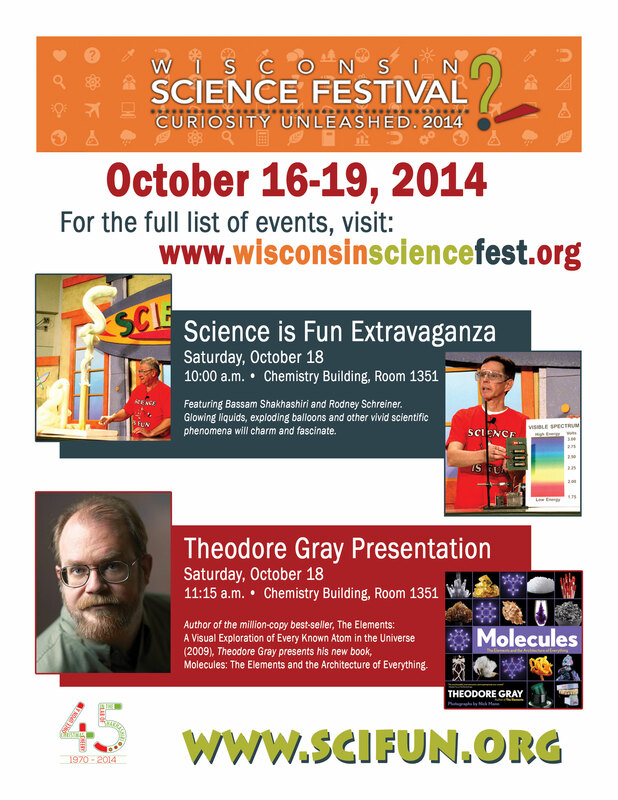 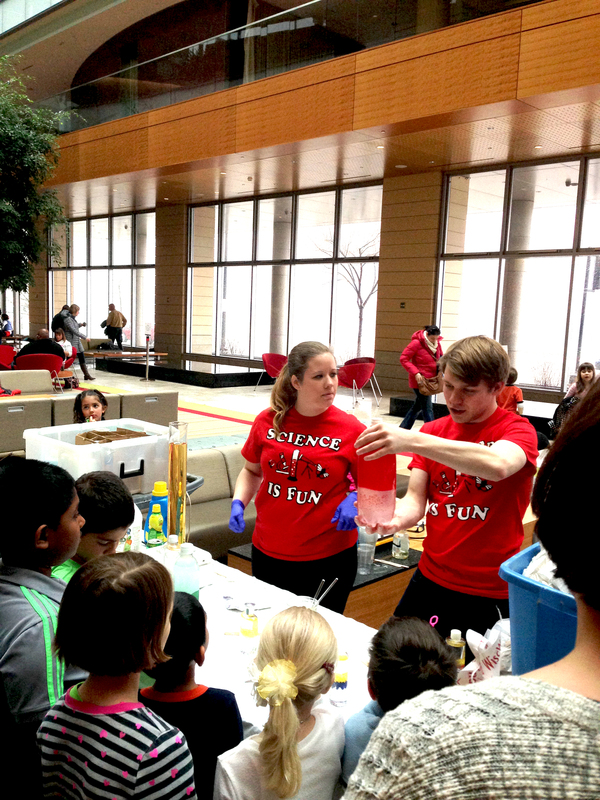 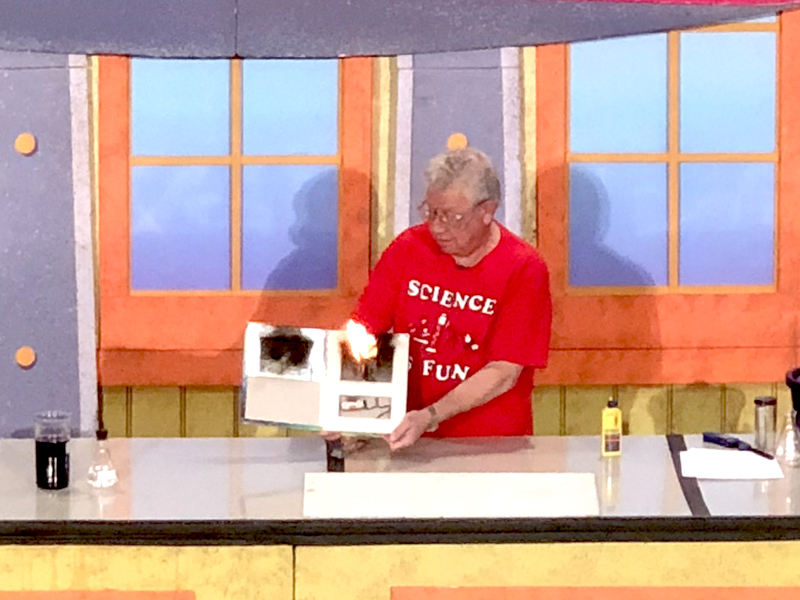 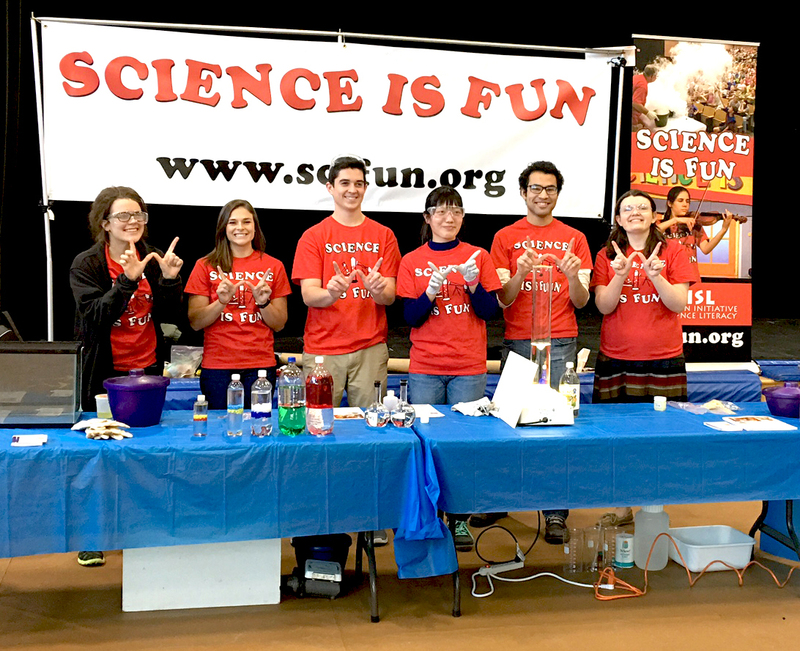 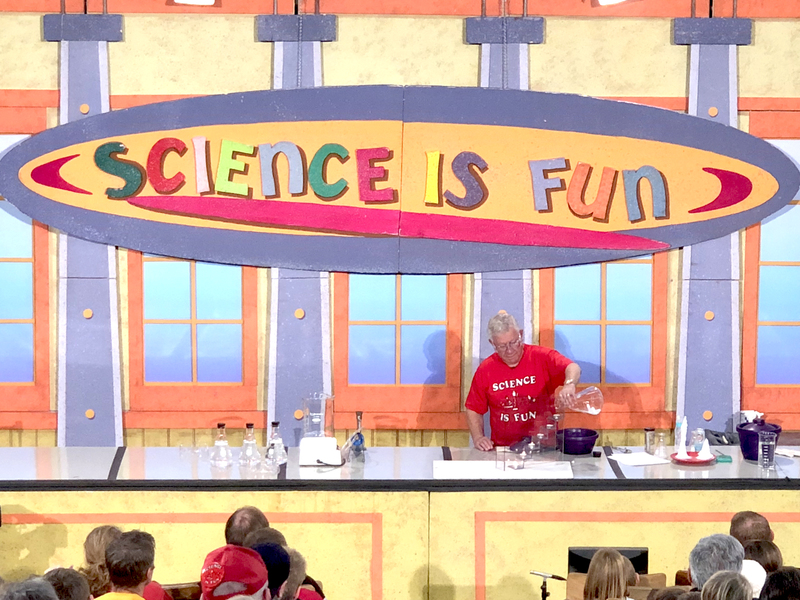 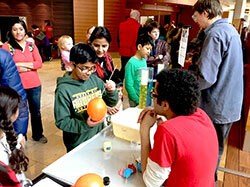 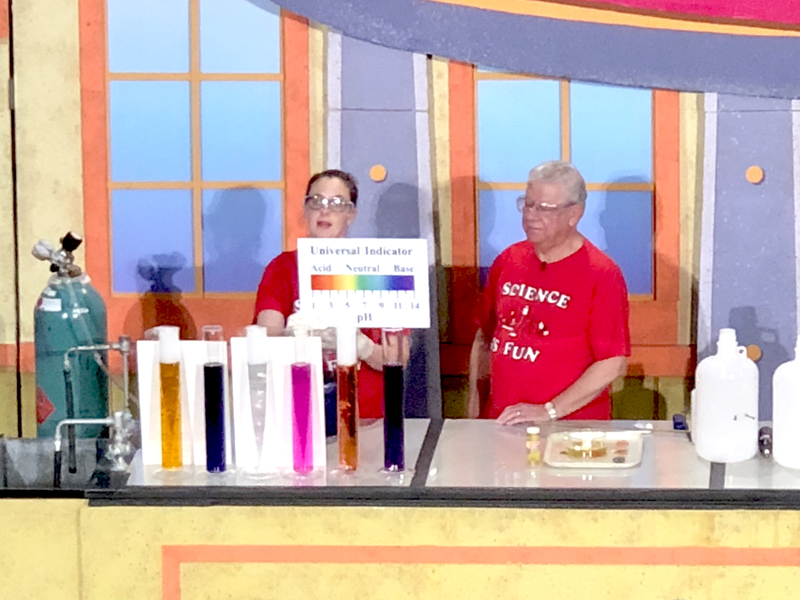 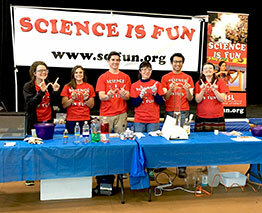 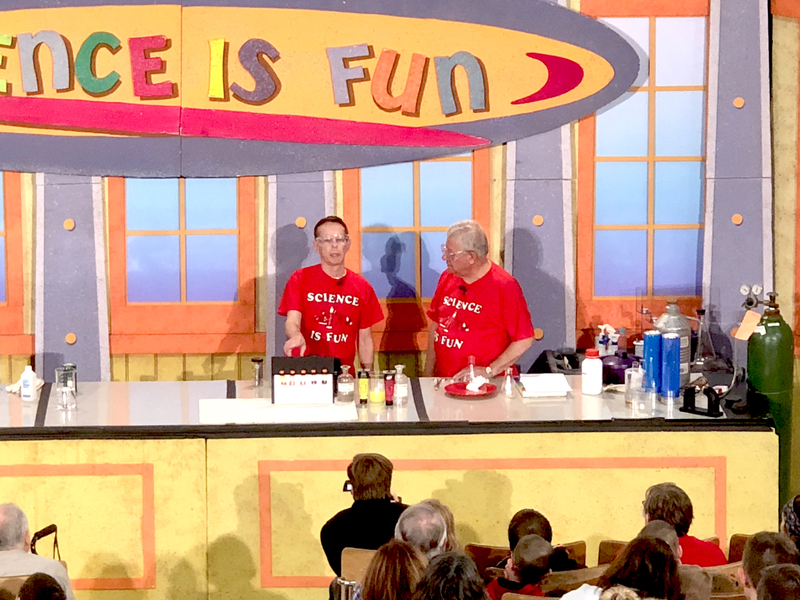 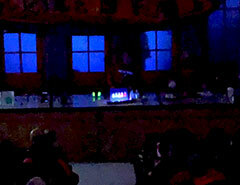 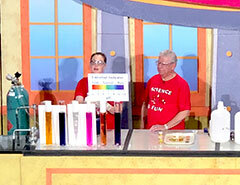 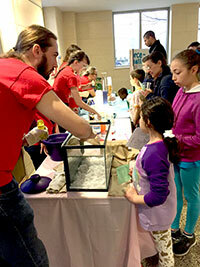 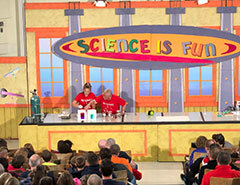 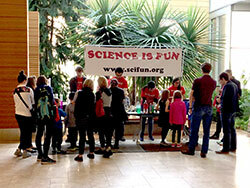 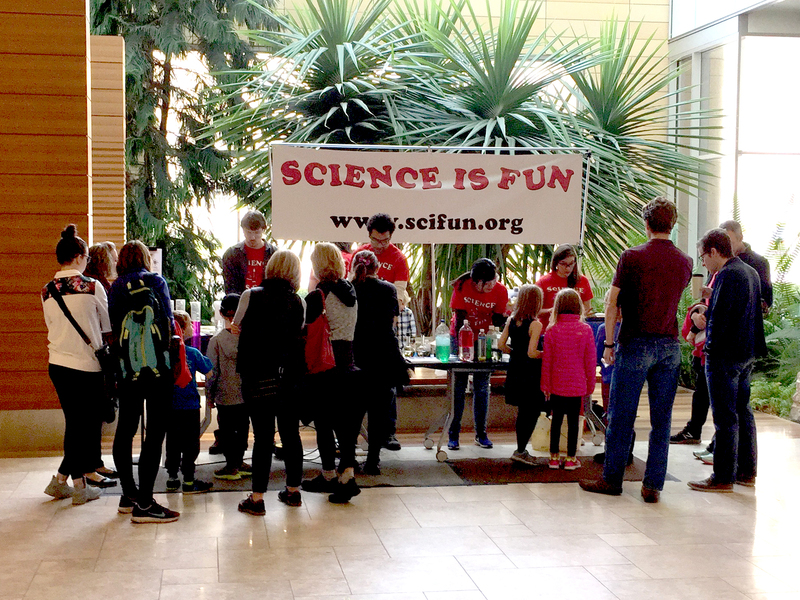 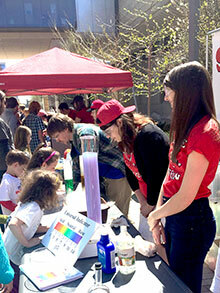 Public Presentations by the Science is Fun crew in the UW Stock Pavillion. 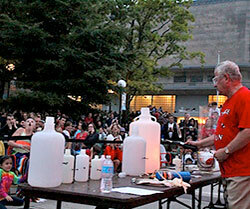 Linden Dr. and Babcock Dr.
Click here for information about videos of the annual holiday lectures. 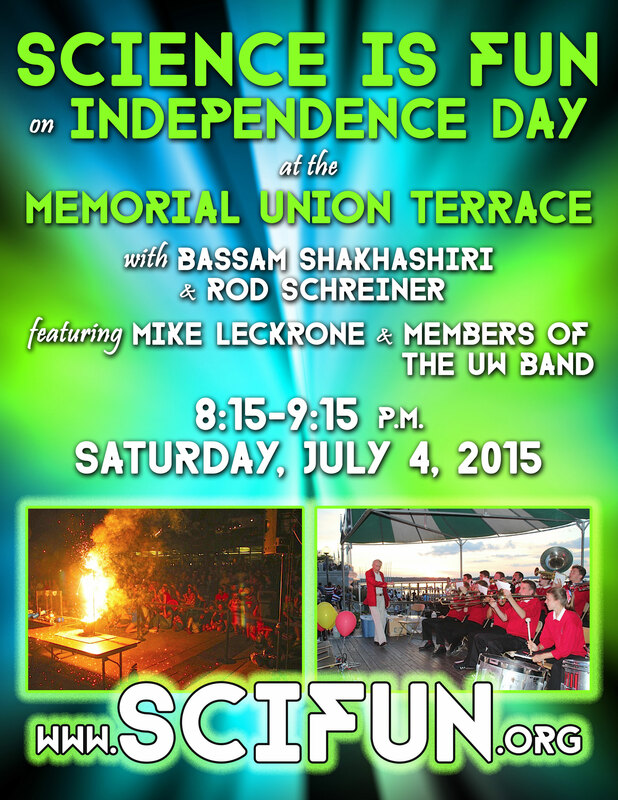 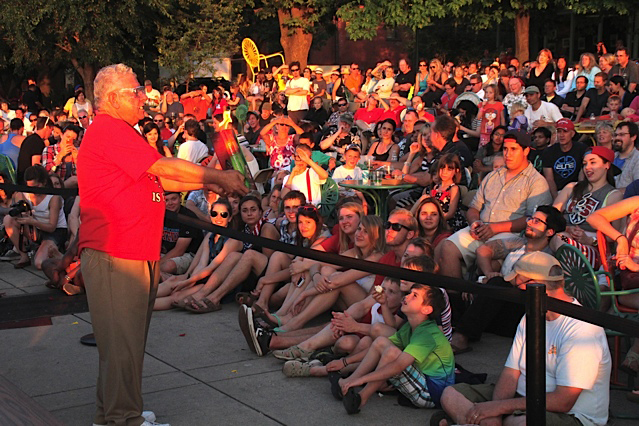 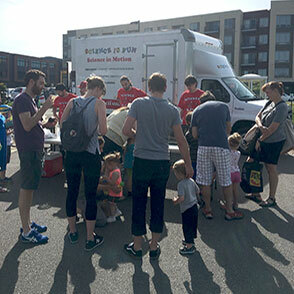 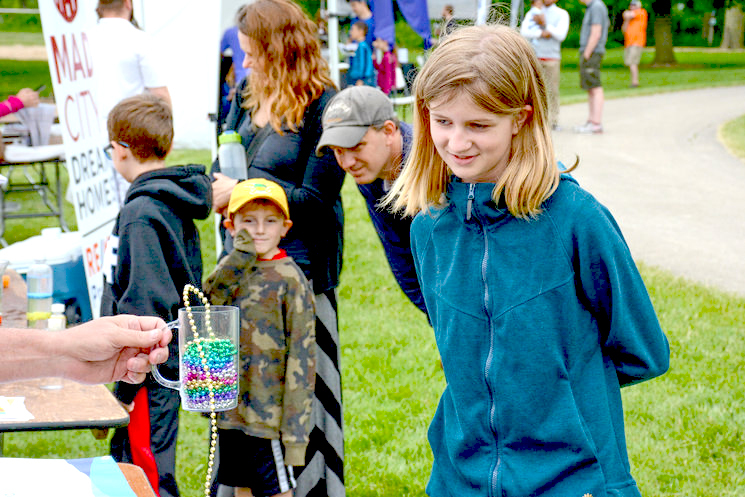 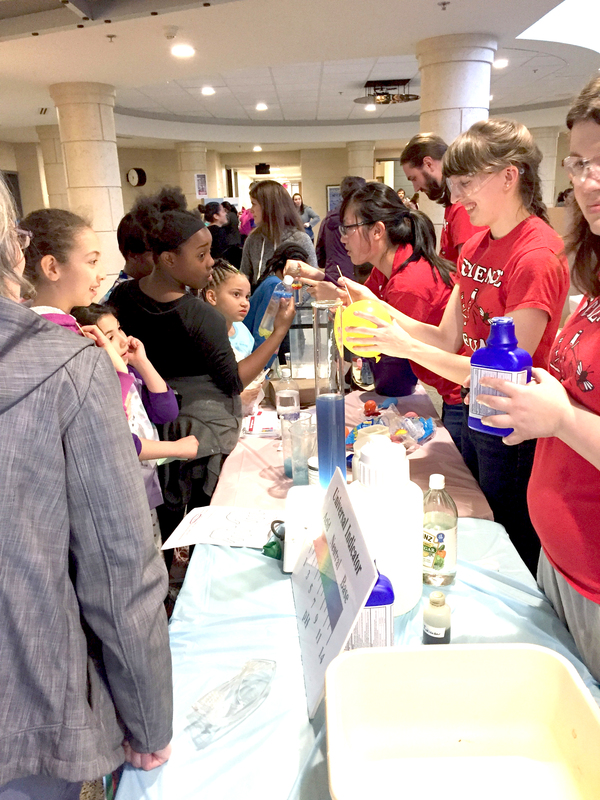 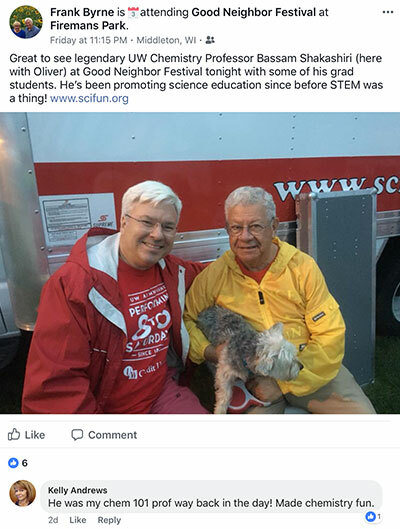 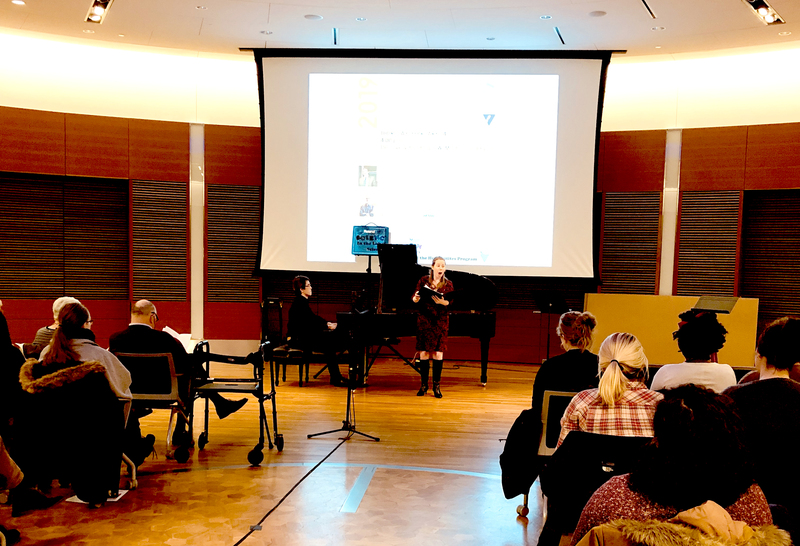 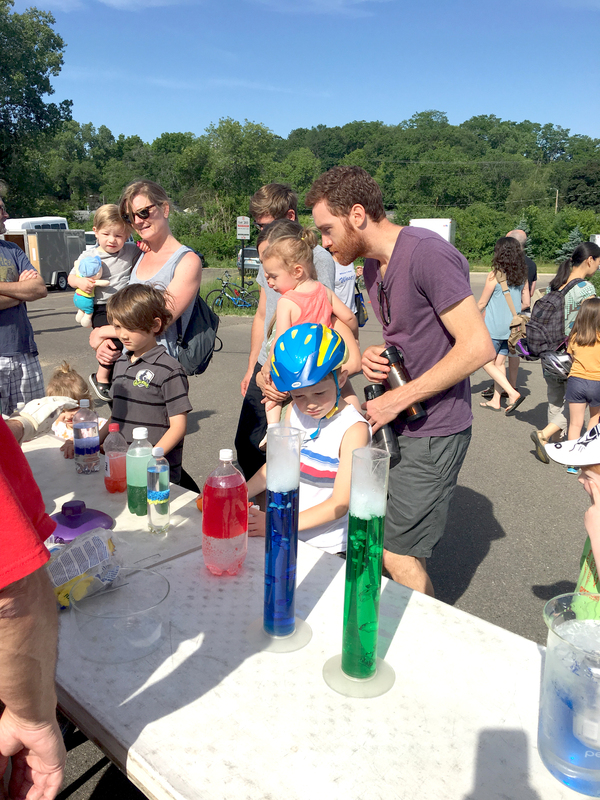 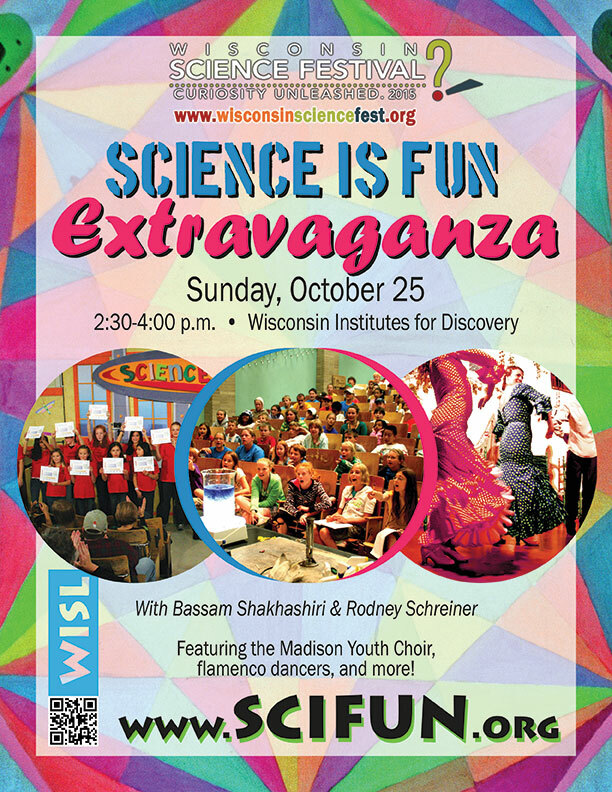 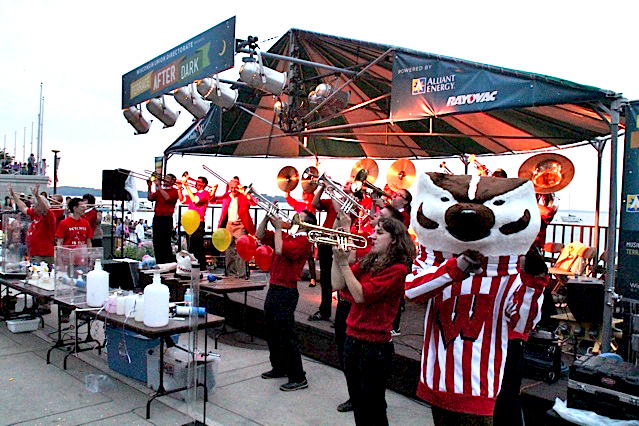 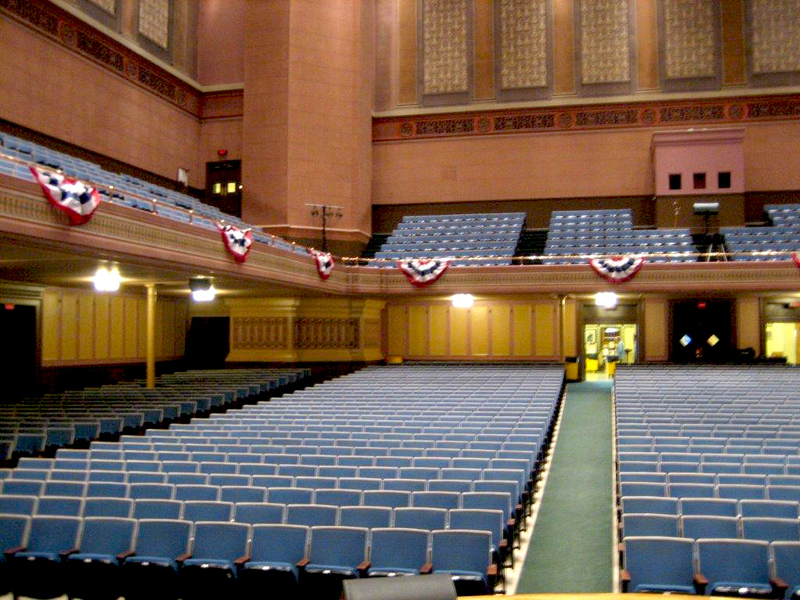 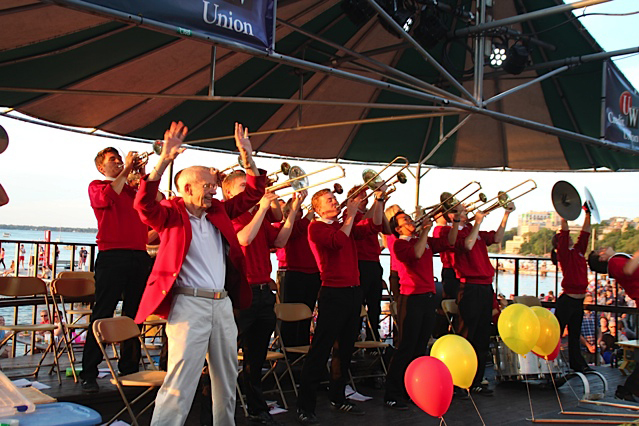 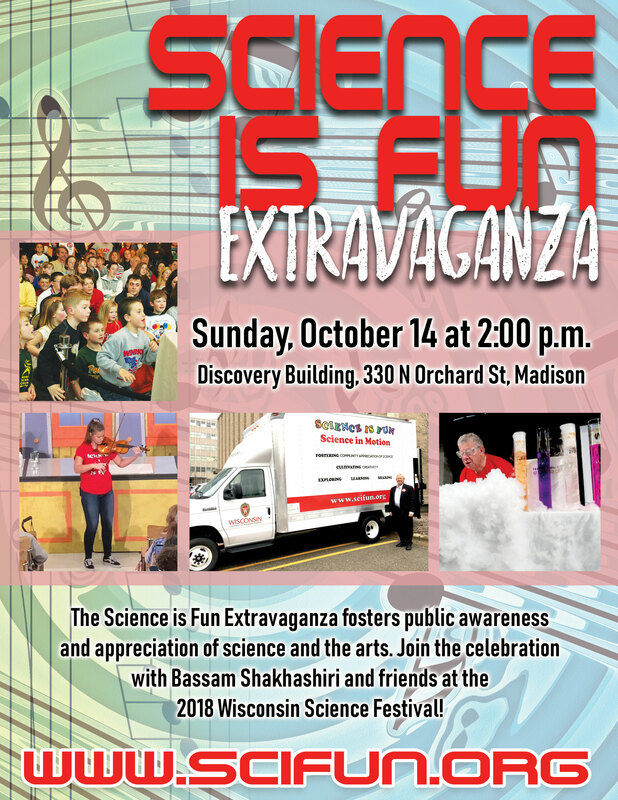 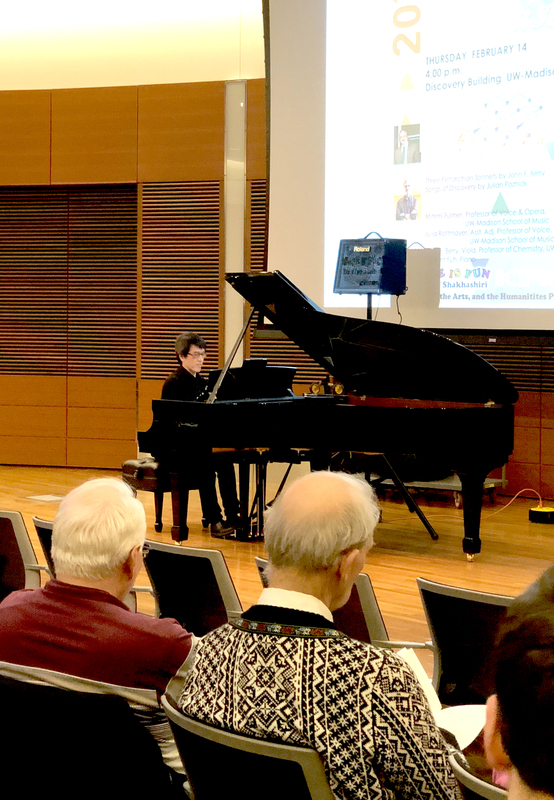 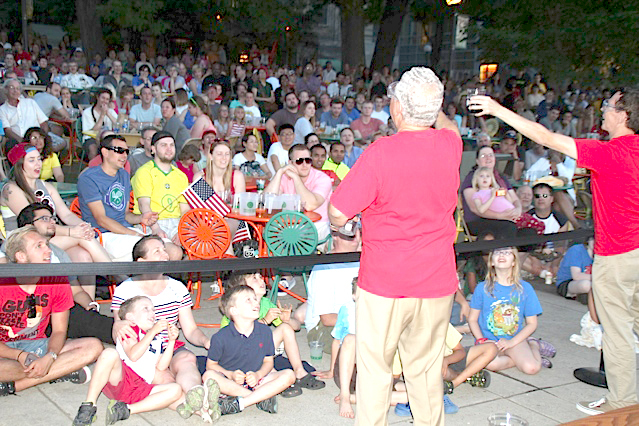 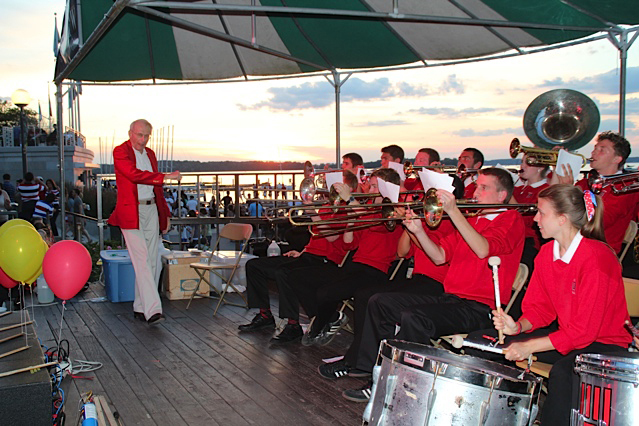 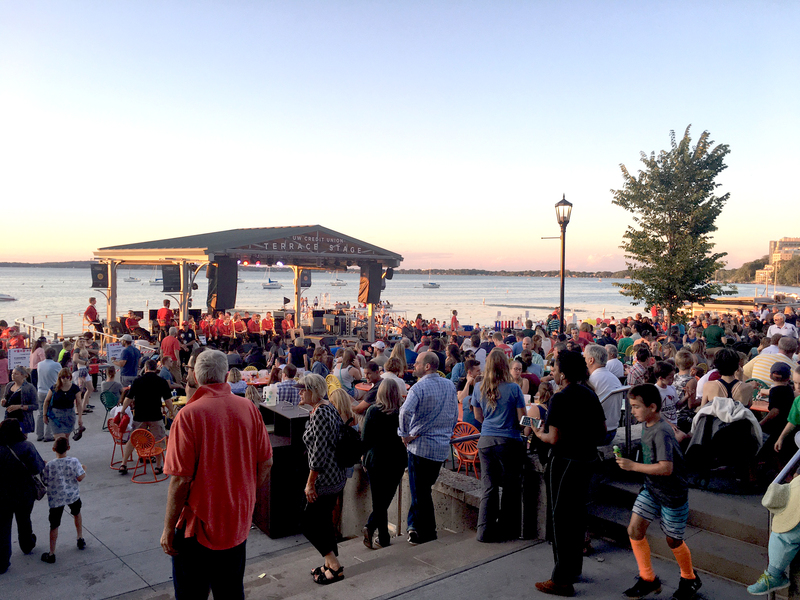 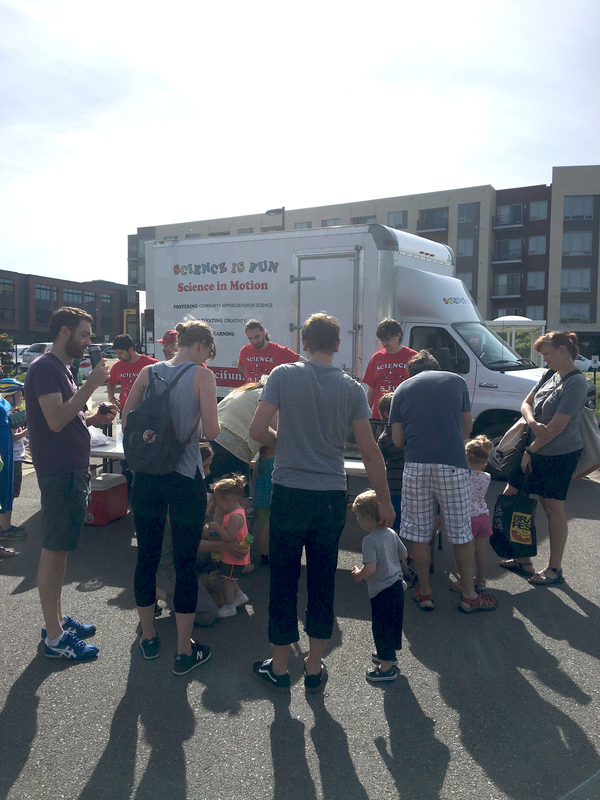 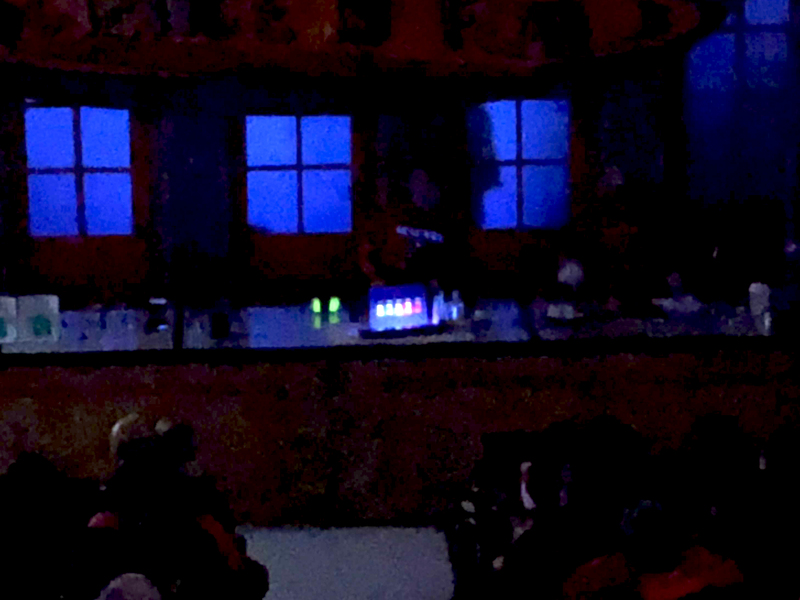 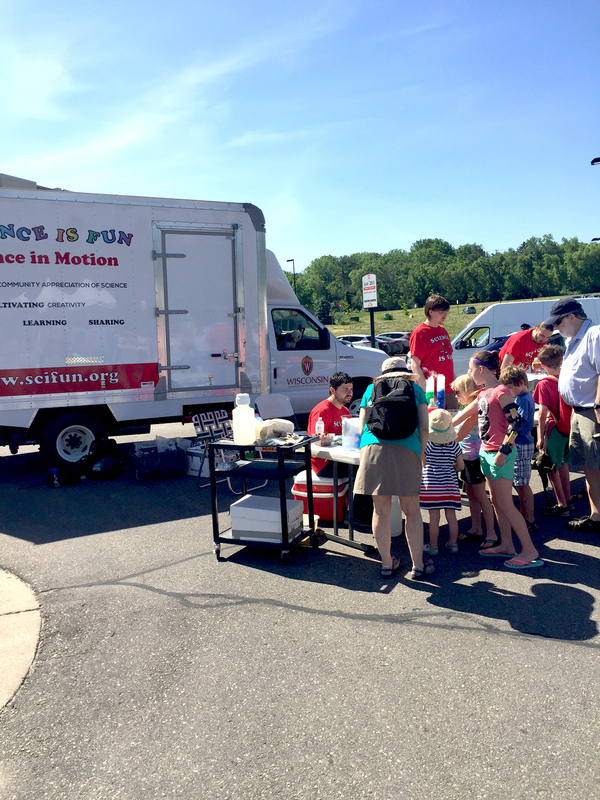 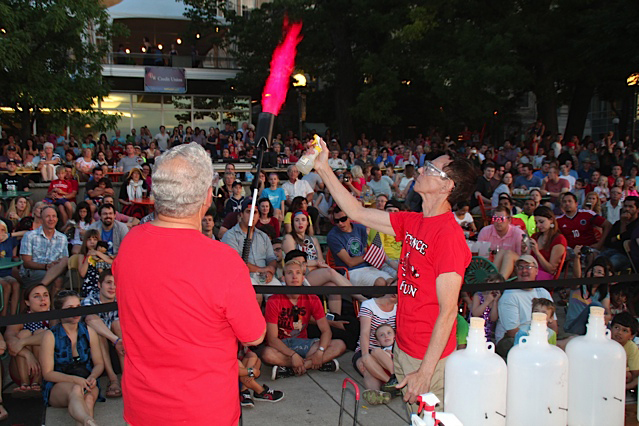 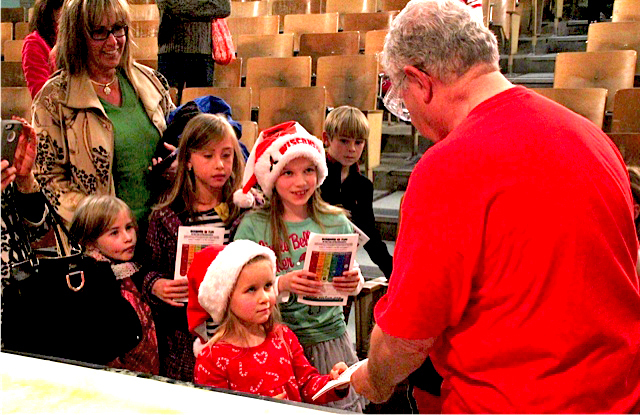 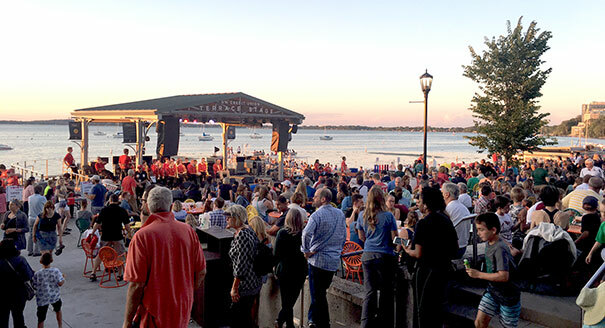 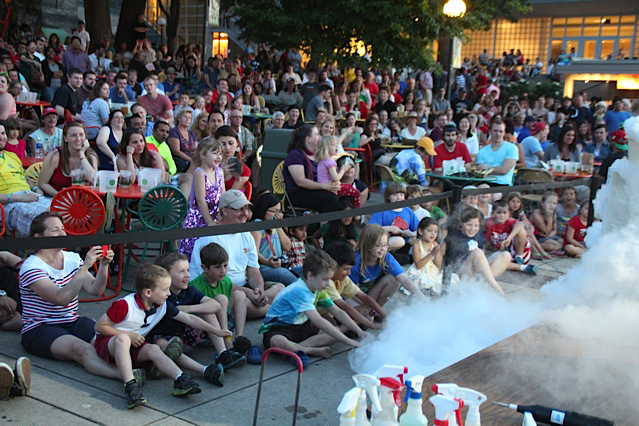 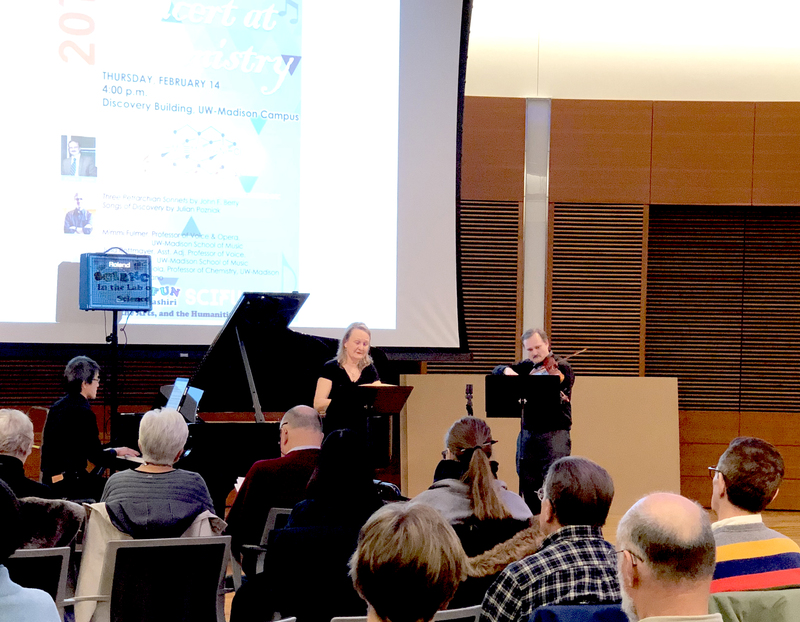 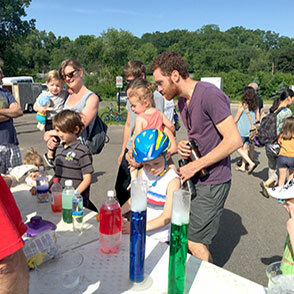 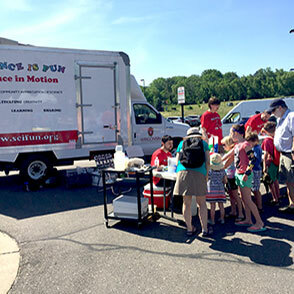 The evening will include Wisconsin Chamber Orchestra's Free Program with Oboist Naomi Bensdorf, an instrument "petting zoo" and science experiments by Prof. Bassam Shakhashiri and Dr. Rod Schreiner for kids prior to concert. 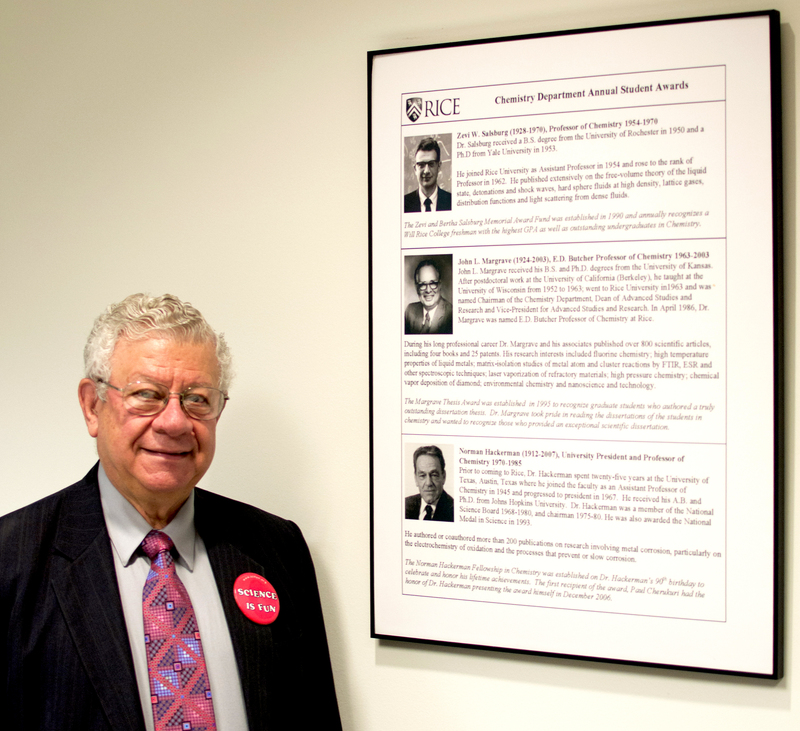 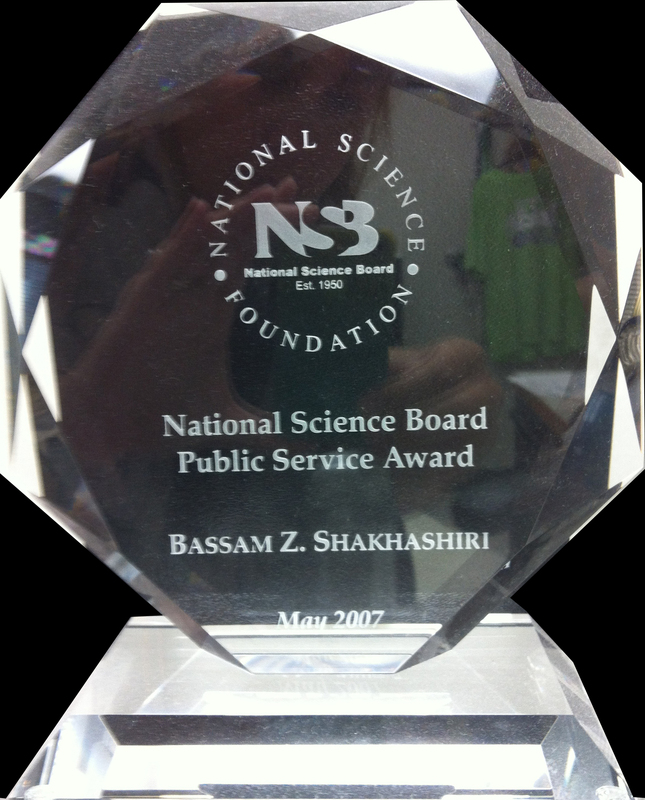 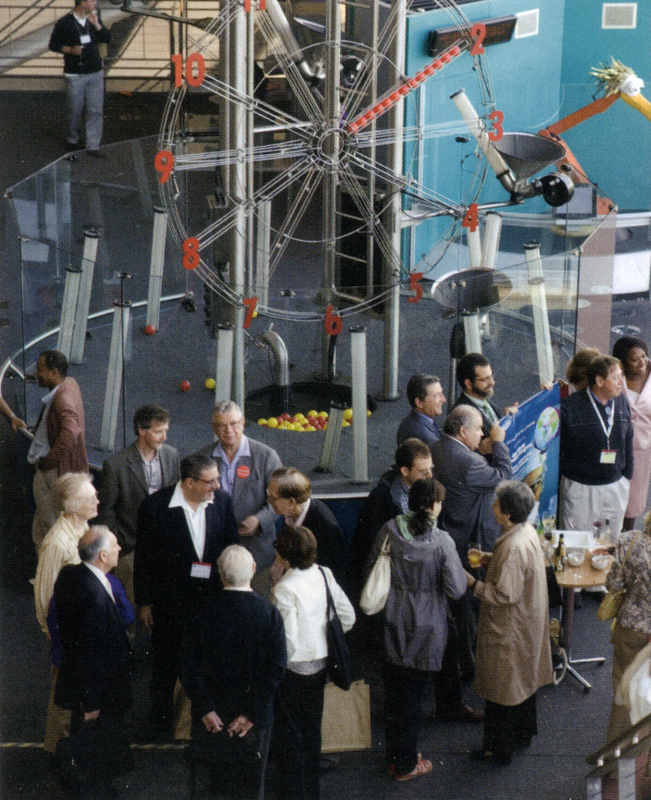 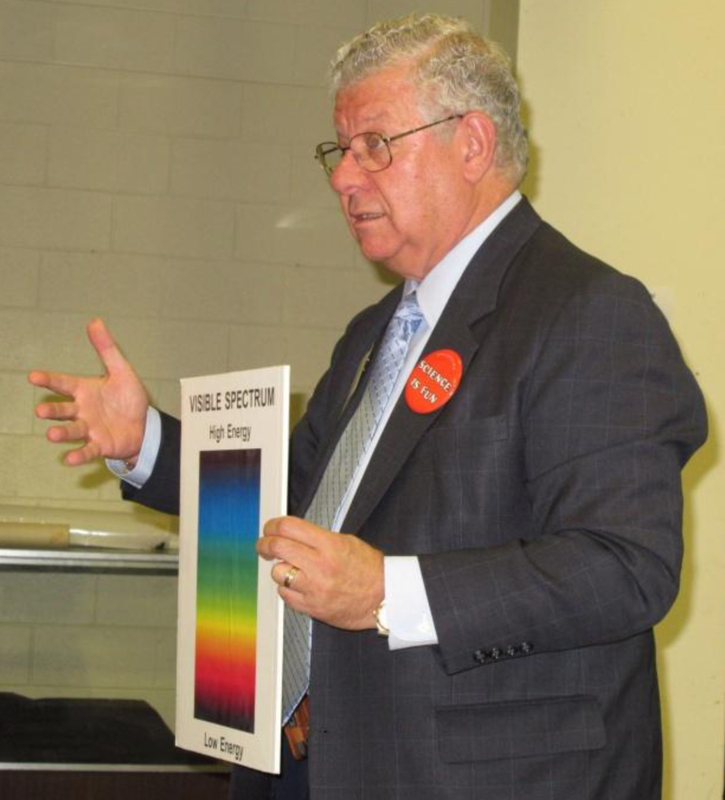 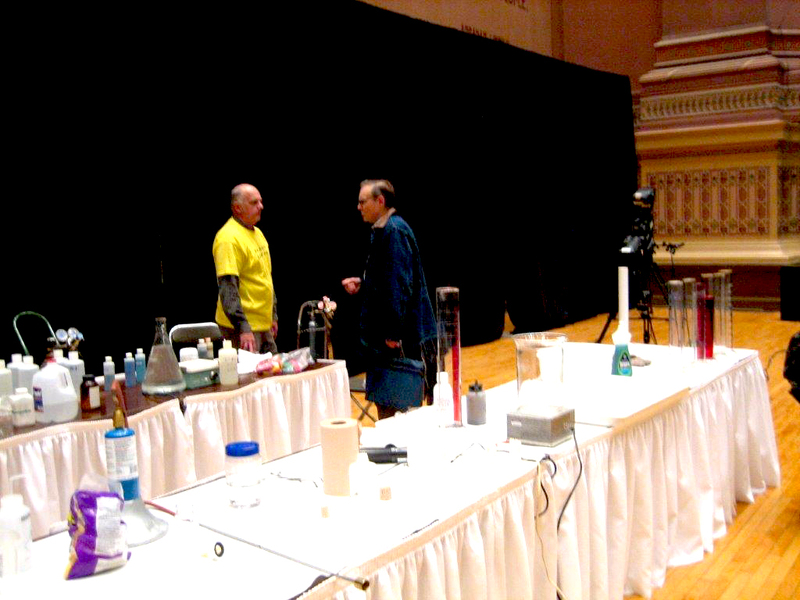 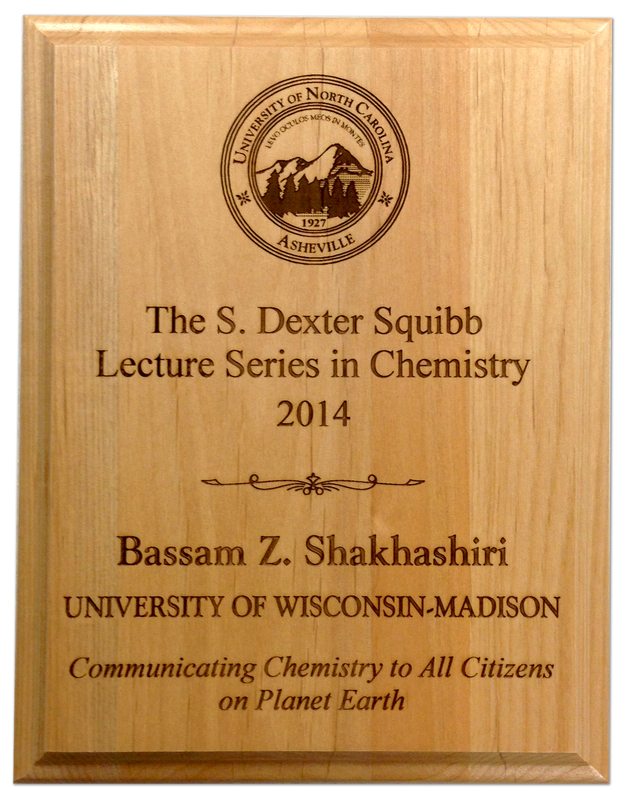 "Private Universe: Misconceptions in Science"
Bassam received the 2007 NSB Public Service Award "For extraordinary contributions to promote science literacy and cultivate the intellectual and emotional links between science and the arts for the public." 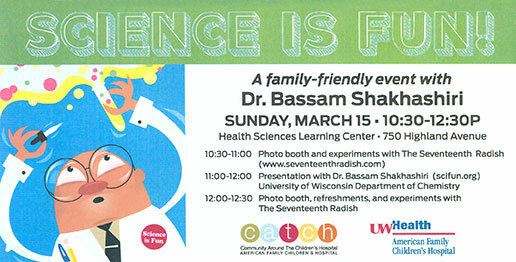 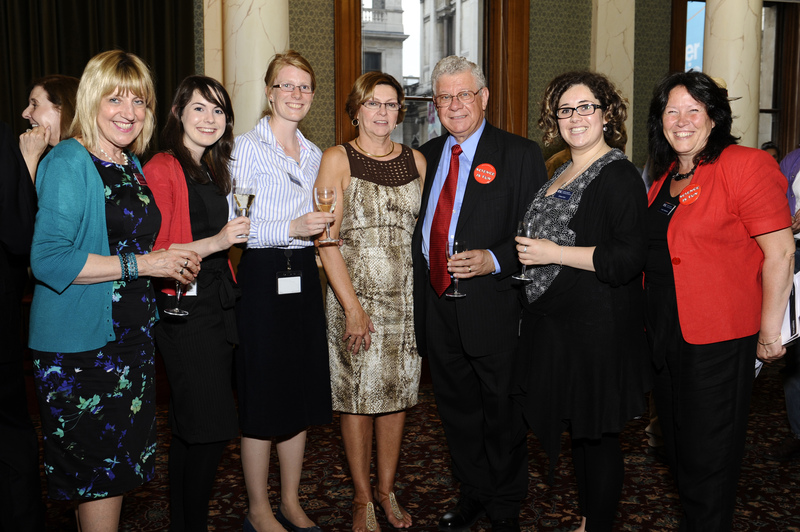 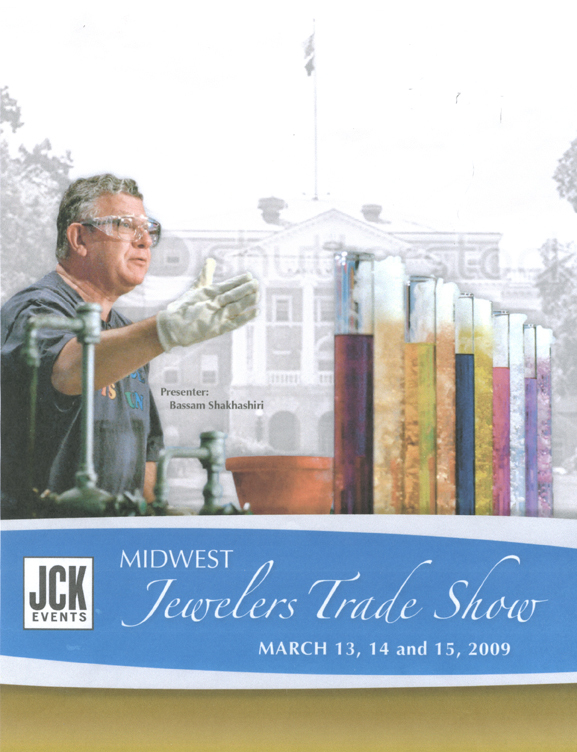 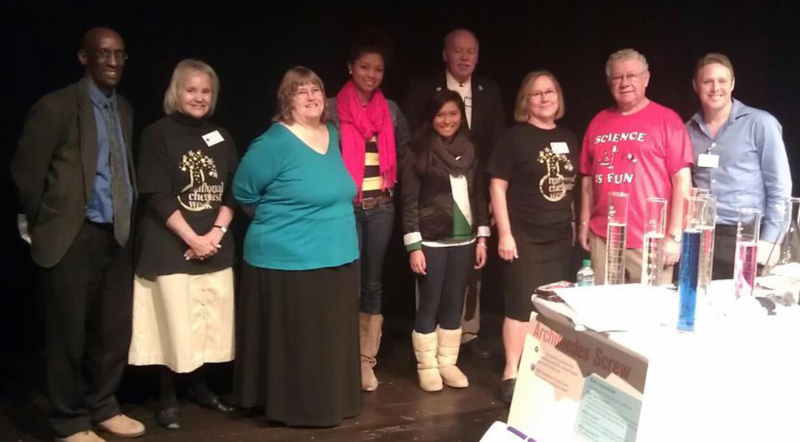 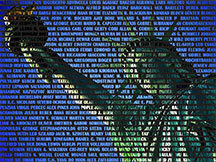 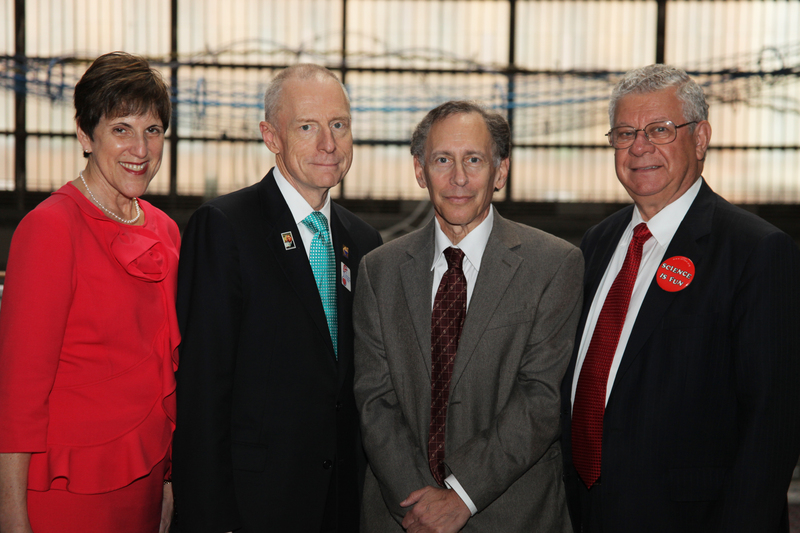 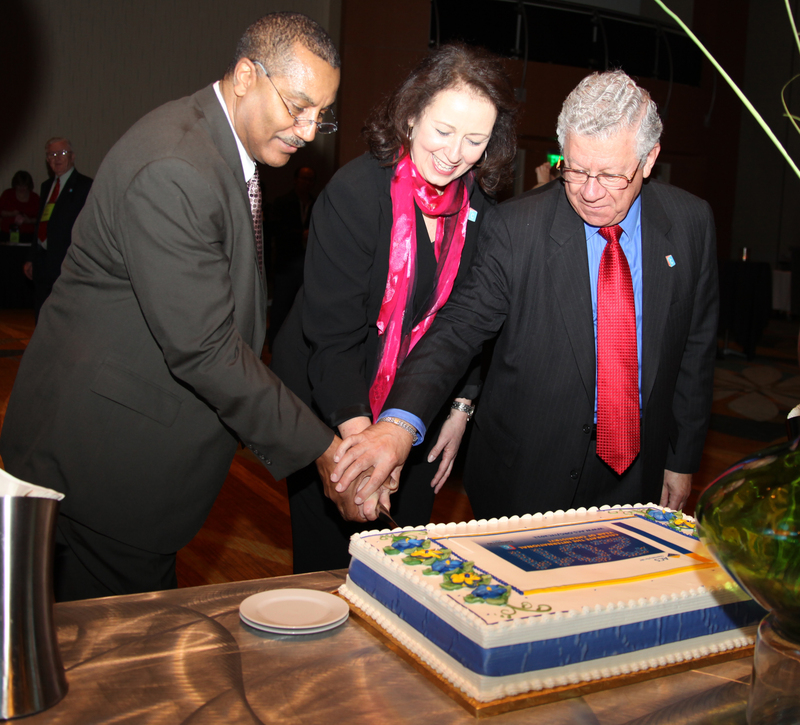 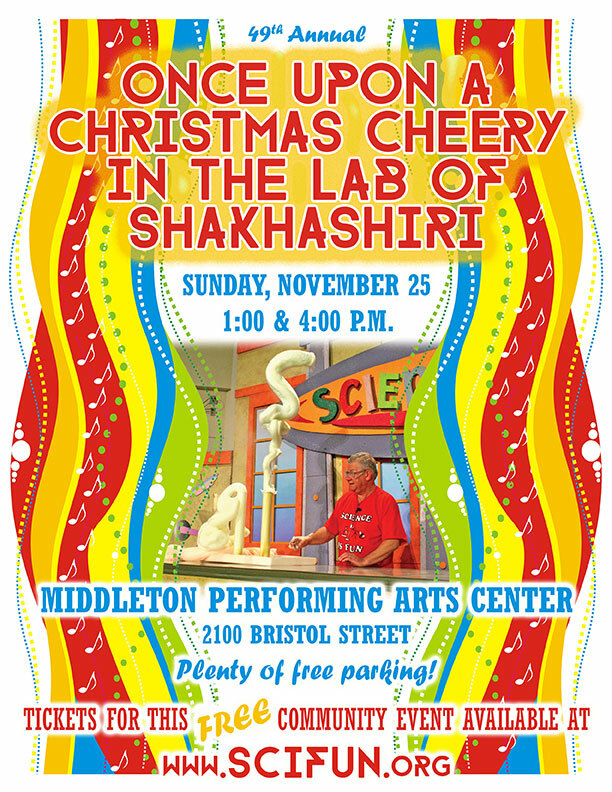 Click here for information and photos from this event. 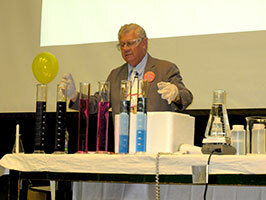 Click here for a picture of Prof. Shakhashiri at the Conference. 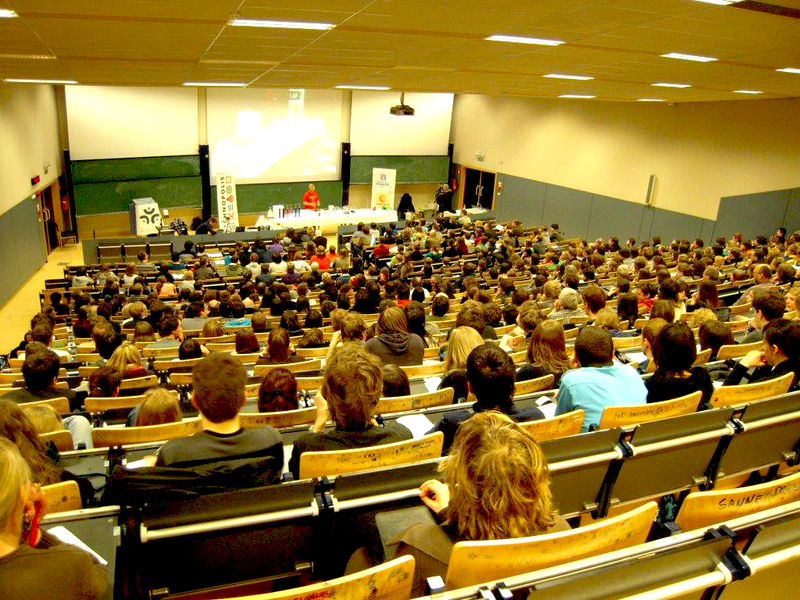 Read an article about the session here. 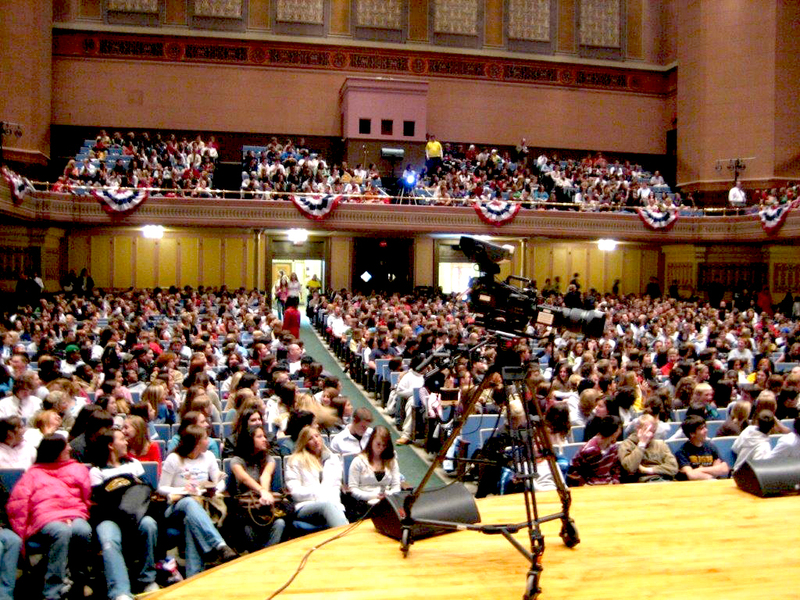 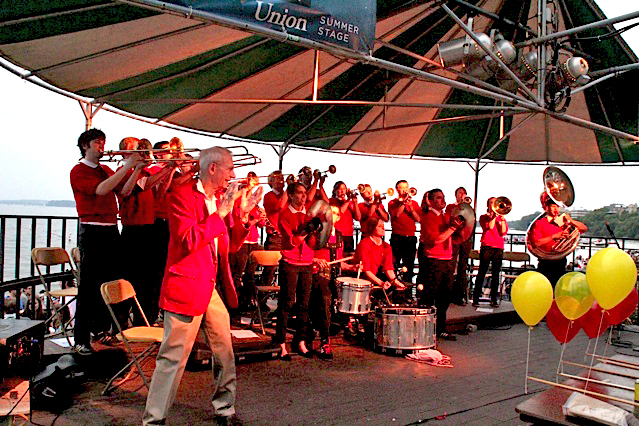 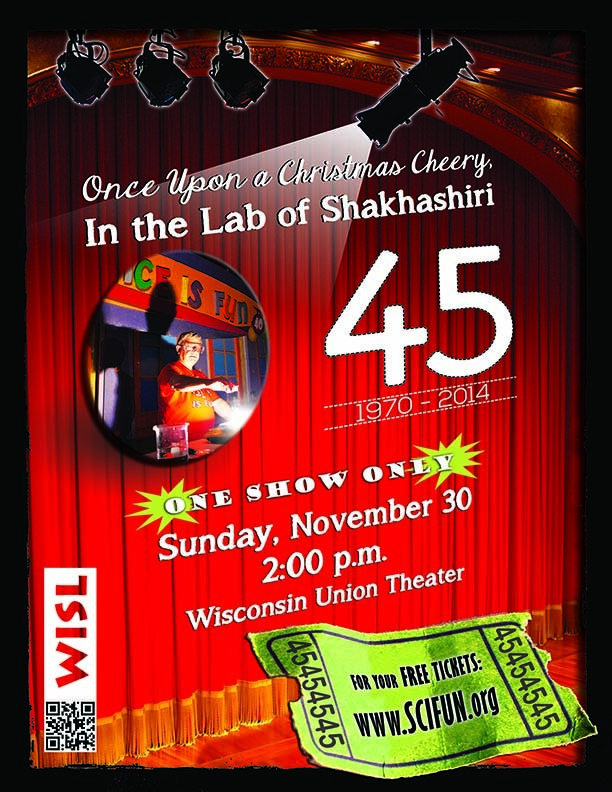 Click here to purchase a DVD of the production. 11:00 a.m. & 2:00 p.m.
Click here for a reading list from the talk.